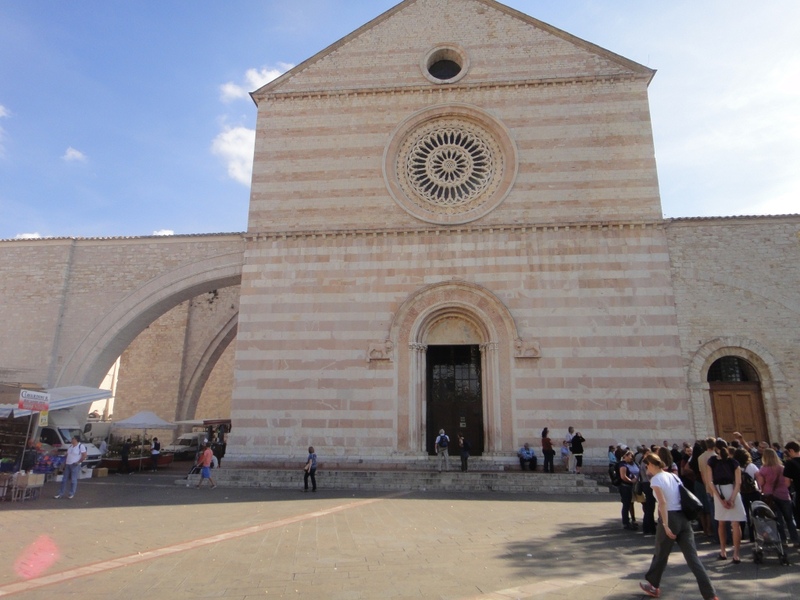 Yesterday our BC group returned from a splendid trip to the region of Umbria where we walked in the steps of Francis of Assisi and Benedict of Norcia. 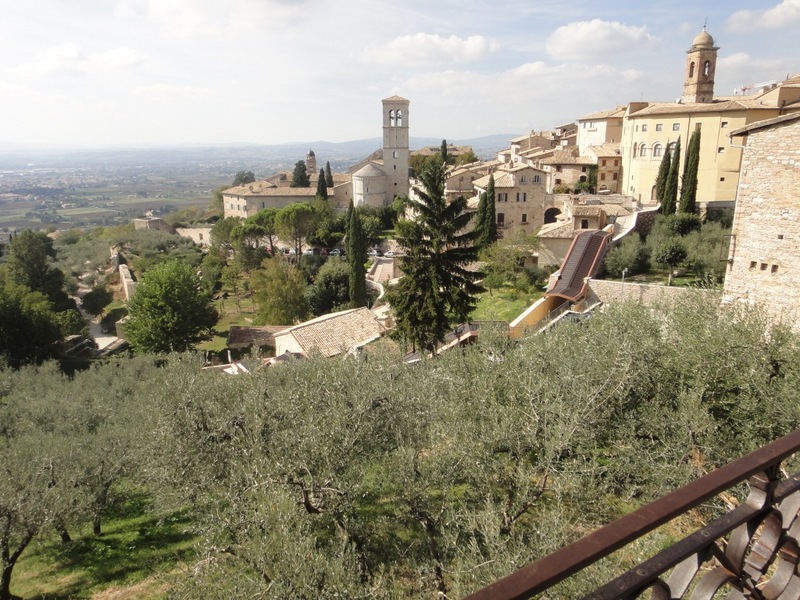 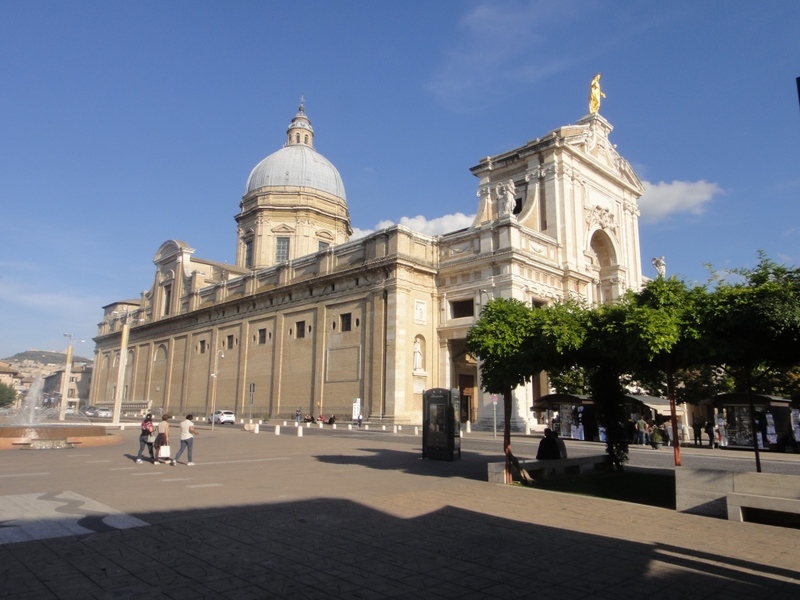 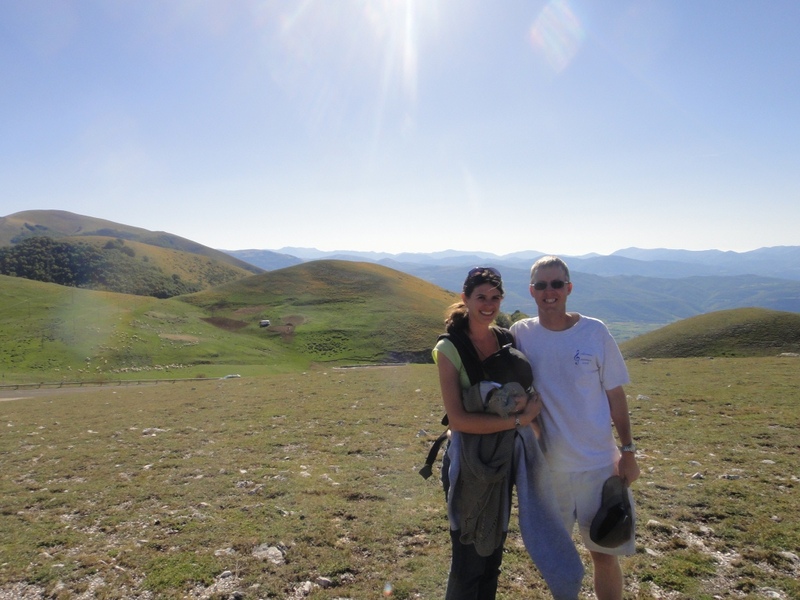 In addition to visiting these two places of pilgrimage, we were able to browse the towns and country around them, including a visit to the mountain region of Castelluccio and the historic city of Perugia. 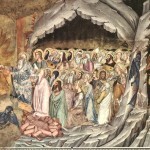 Praying in the places where these great saints–so crucial to the Church and Western civilization–lived and ministered. 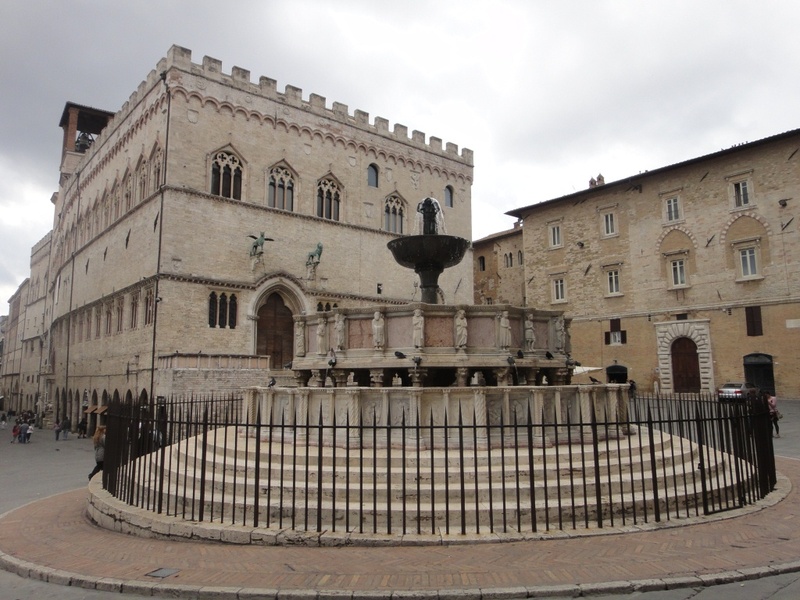 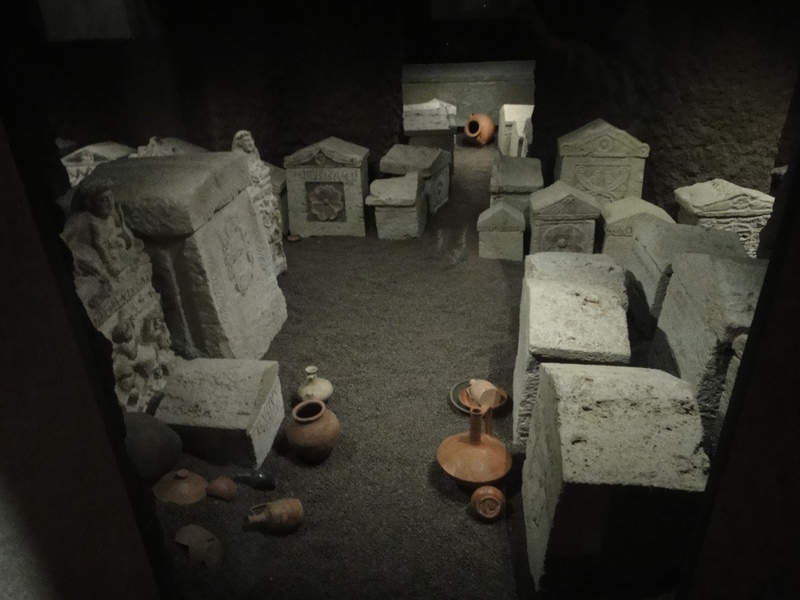 An encounter with ruins of the ancient Etruscan civilization in Perugia–I hadn’t expected this and learned a great deal from our guide, Franceso. 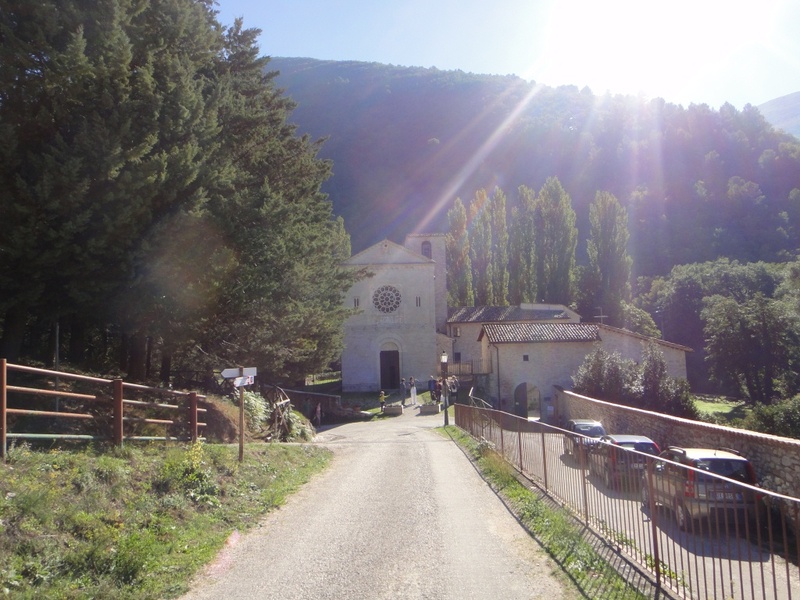 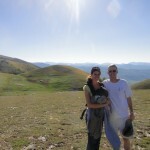 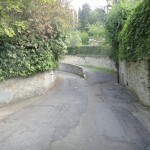 Climbing our way (in the bus) up the Umbrian mountains and getting out to take in the vast panoramas they provide. 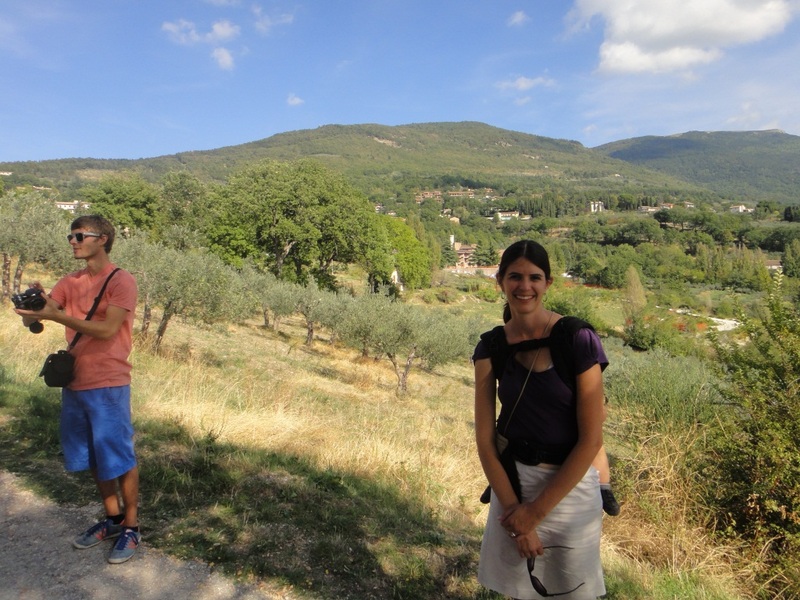 Our group thus got to enjoy some natural beauty straight from the hand of God in addition to taking in the man-made beauty of the local towns. 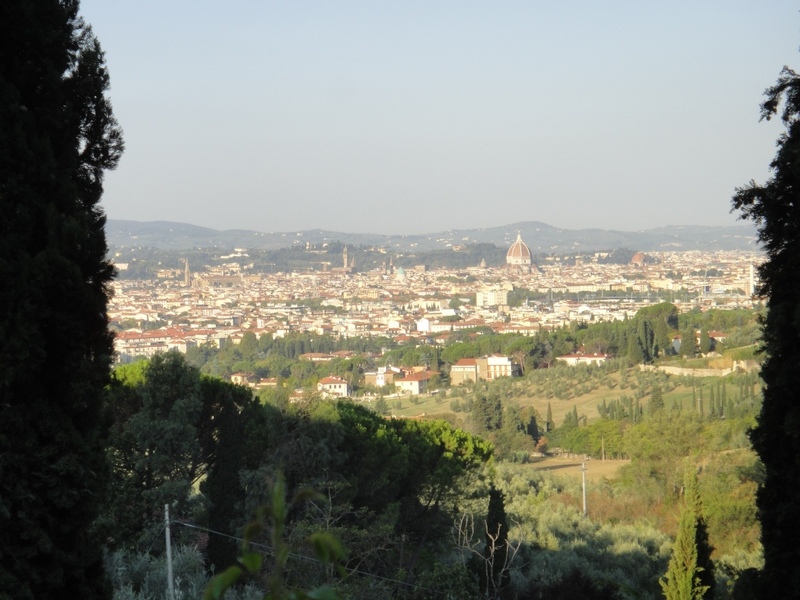 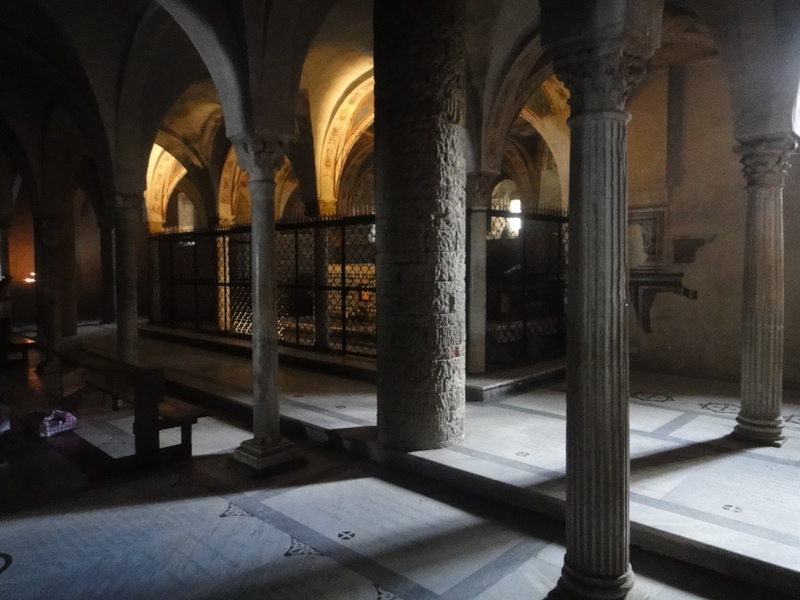 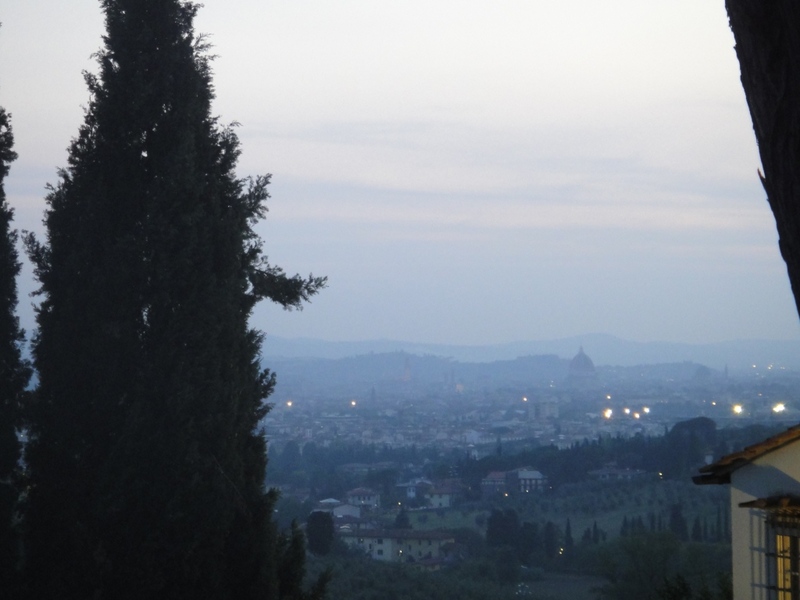 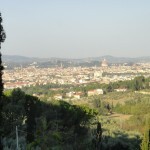 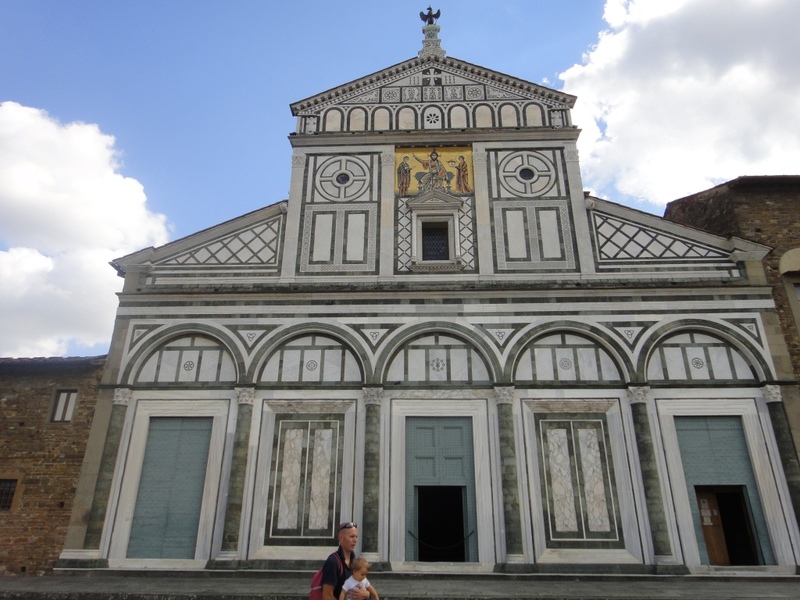 A visit to the Benedictine Church of San Miniato al Monte, located atop a huge hill overlooking Florence. 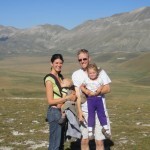 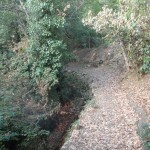 This was not part of our group trip; rather, the Ramages made this trek the day before leaving. 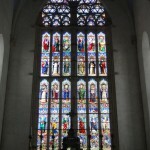 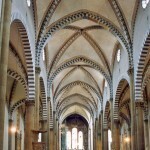 It is a splendid medieval church that is intricately appointed without being overdone. 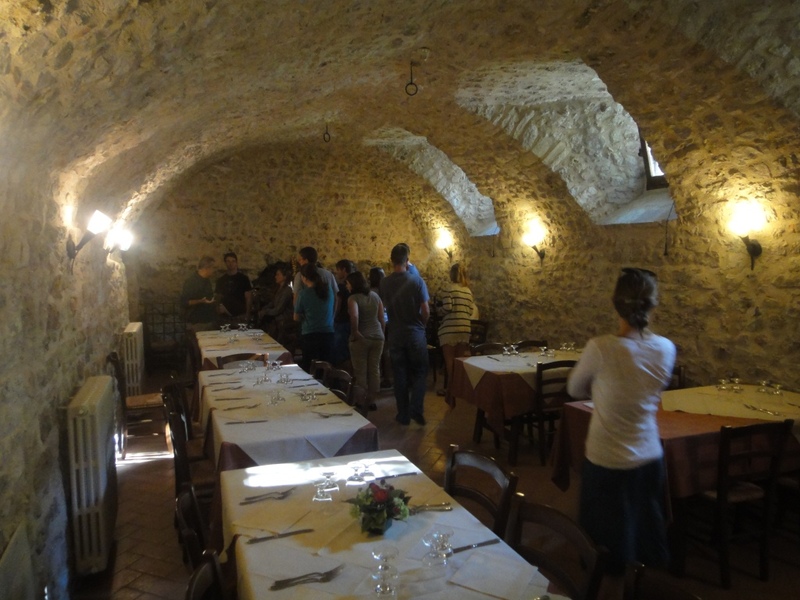 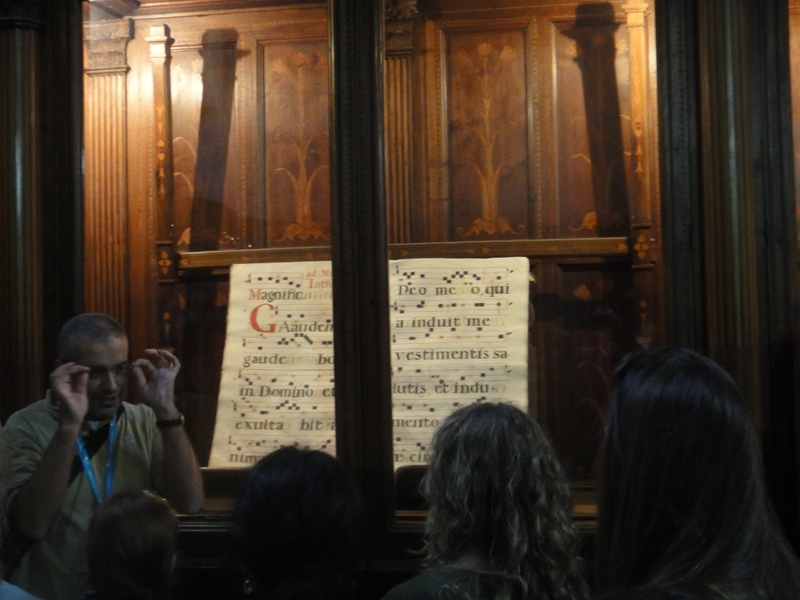 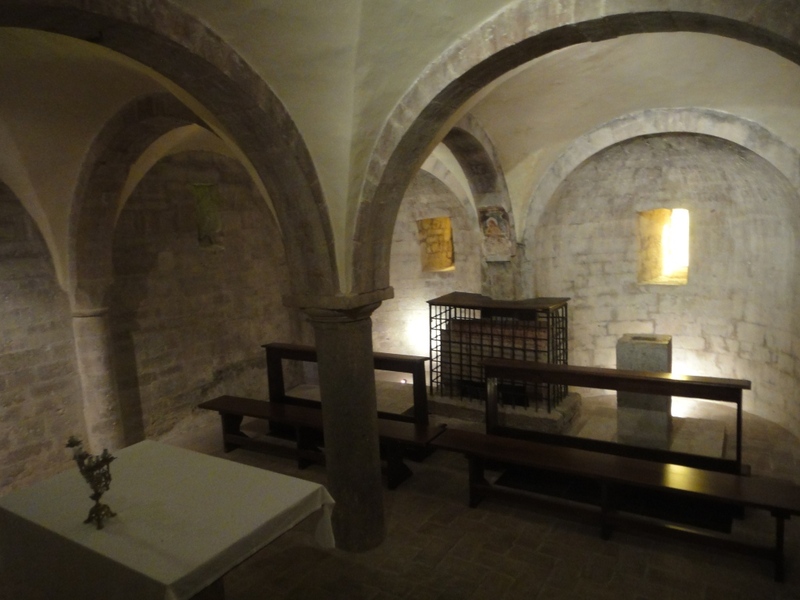 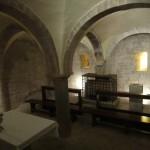 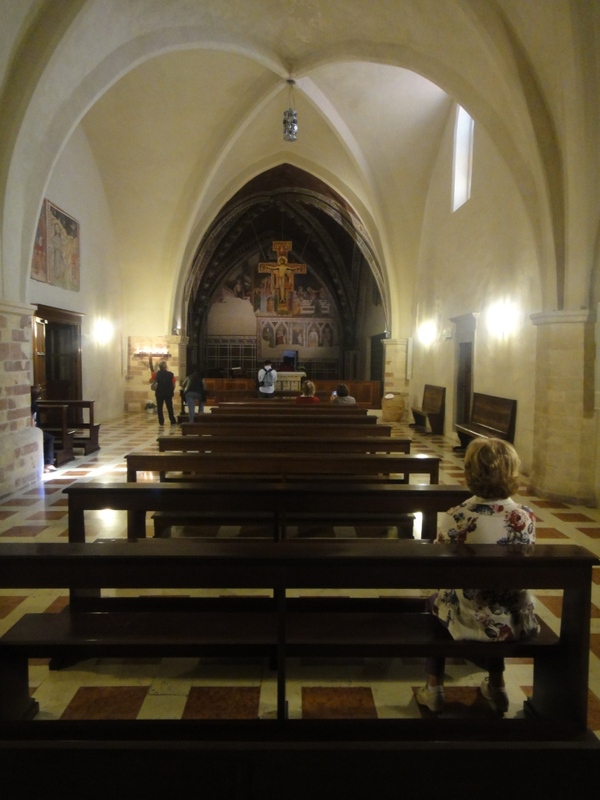 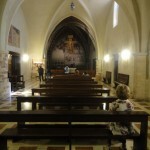 It also has a sacristy that treats the entire life of St. Benedict in art. 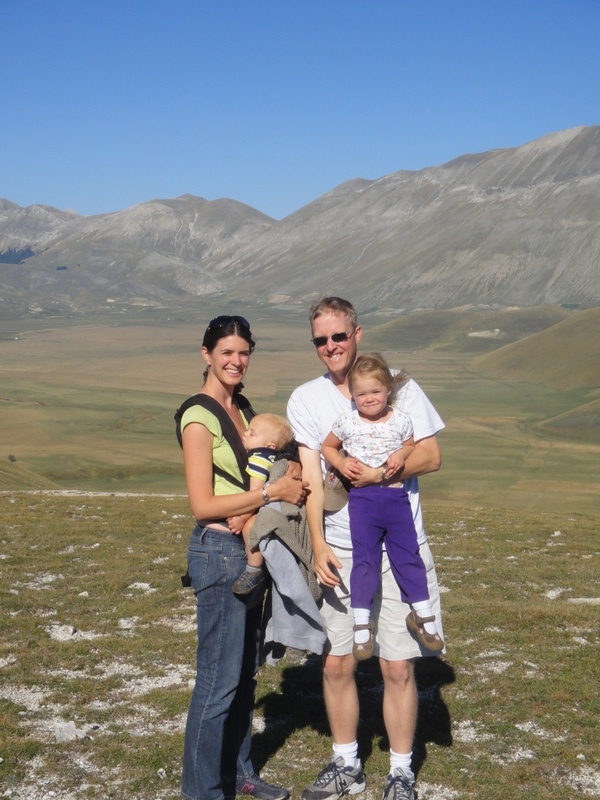 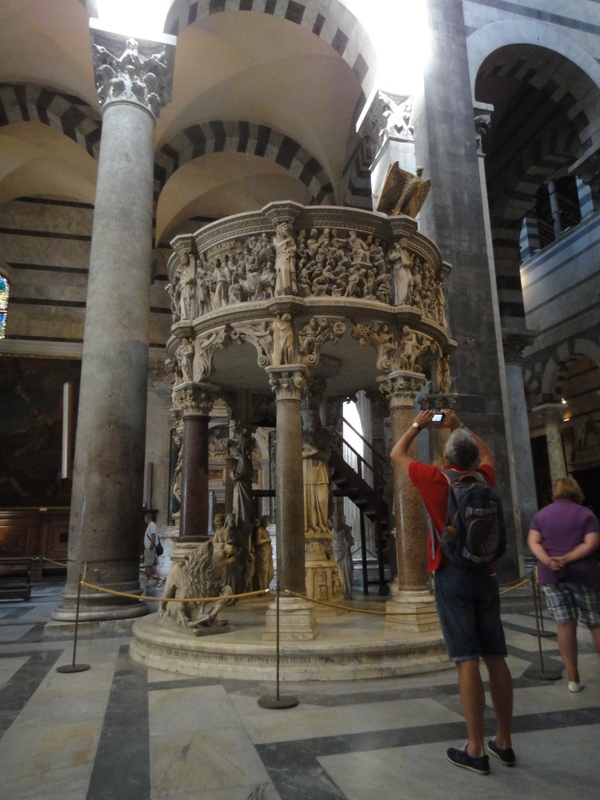 It was great for my family to travel to these places with our local guide, as some of these sites are not on the standard tourist/pilgrim itinerary yet remain well worthy of a stop. 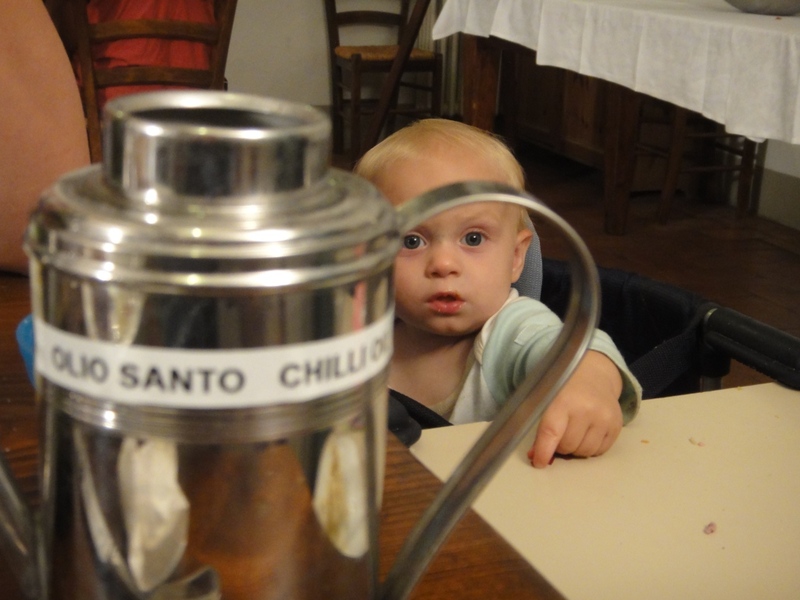 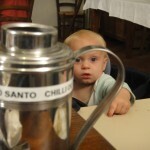 Joseph with Olio Santo–this “holy oil” is what the Italians call the glorious product that ensues when olive oil is marinated with crushed red pepper. 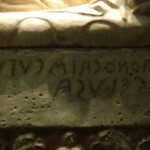 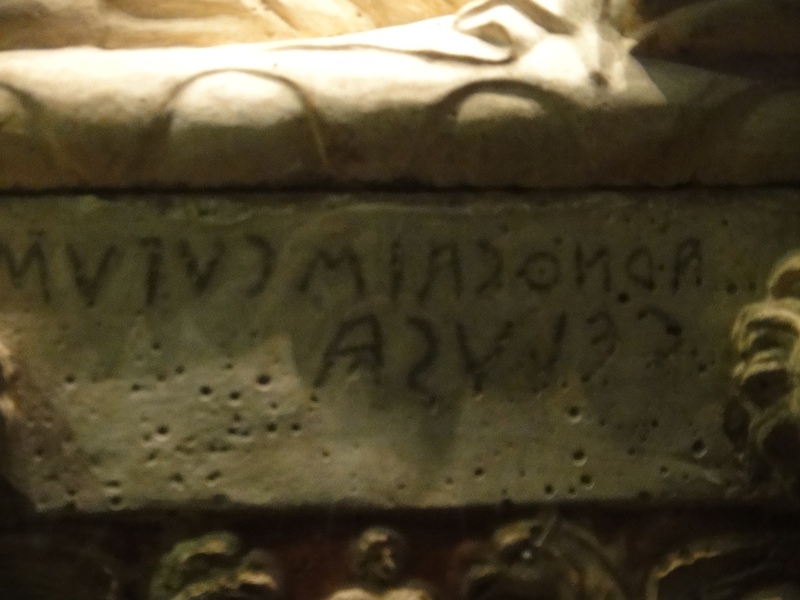 Close-up of the inscription on the Etruscan tomb–it reads right to left (like Semitic languages), but it has Latin/Greek-style letters. 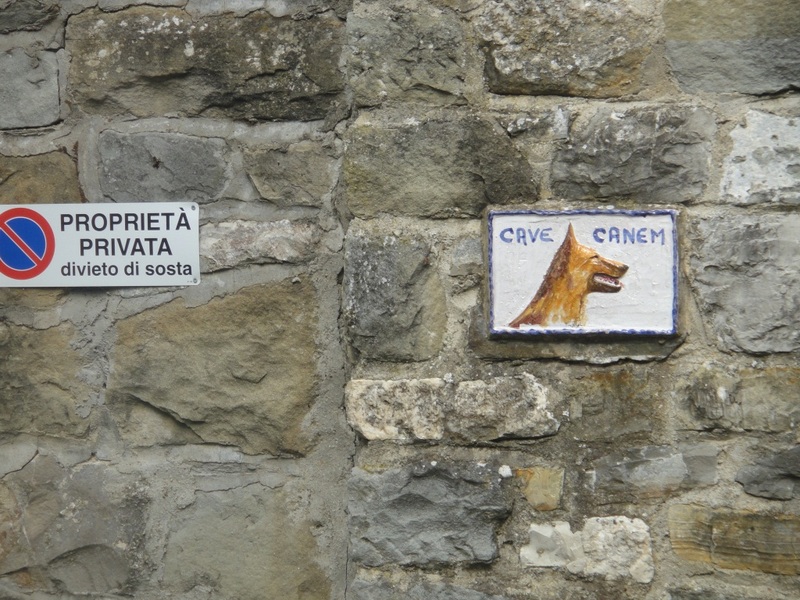 The origins of the Etruscans remain a mystery to historians. 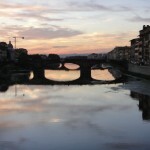 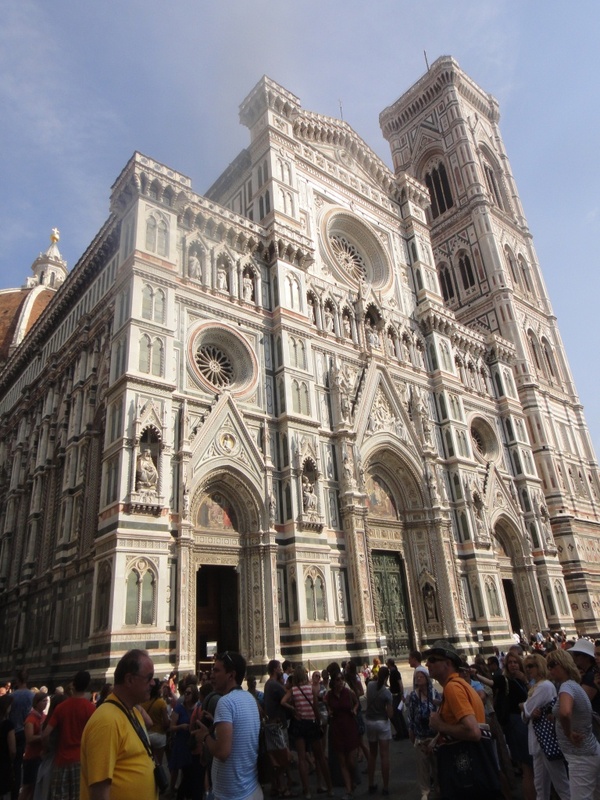 Our BC group has been blessed to visit some great Florentine sites in the past couple of days. 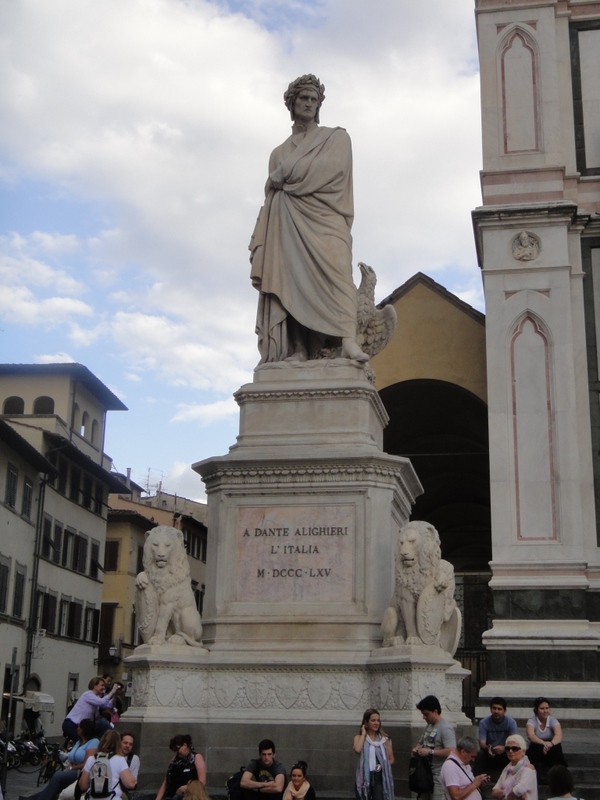 Here I’m going to highlight mainly how what we saw relates to the life of Dante, as the Divine Comedy has been my principal academic interest this semester and a course I’m co-teaching with my wife. 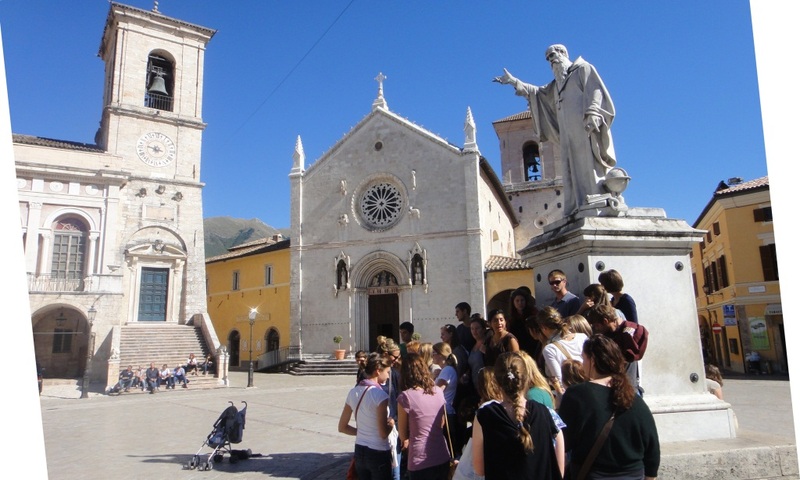 Our students have been doing a great job of reading and discussing Dante so far, and it has been a joy to prepare this course while living in Dante’s town. 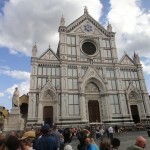 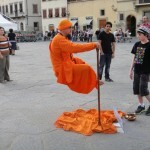 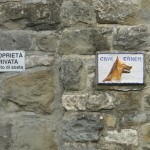 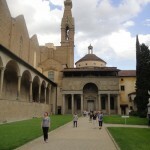 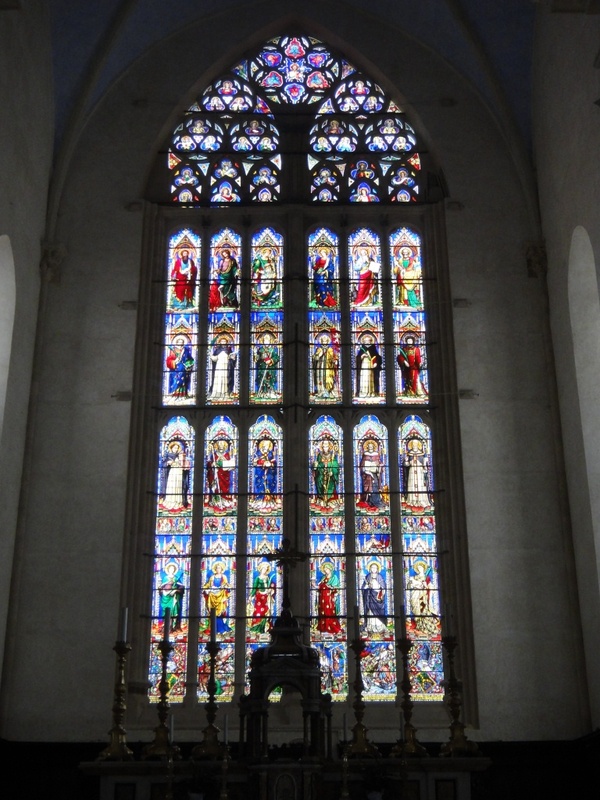 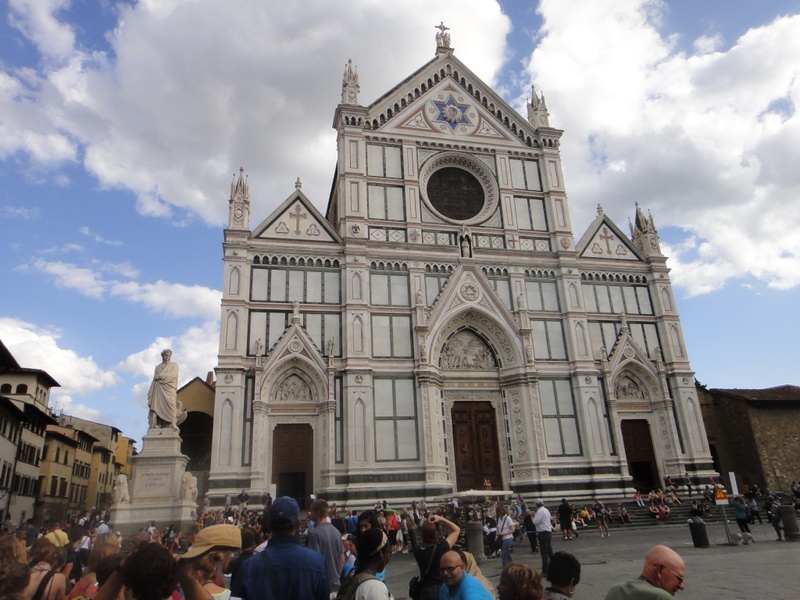 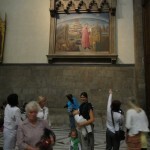 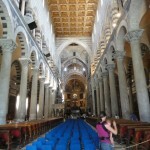 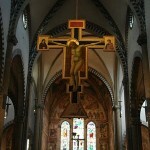 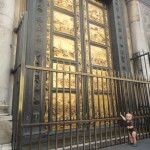 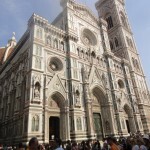 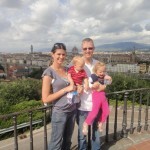 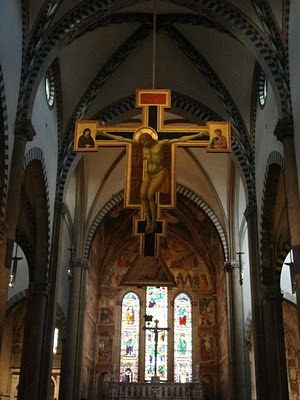 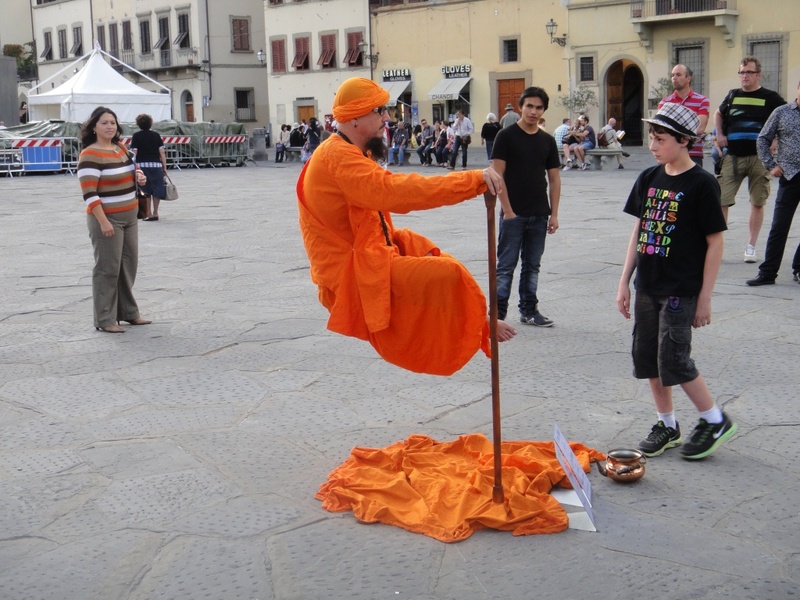 The first site I want to mention is the church of Santa Croce in Florence. 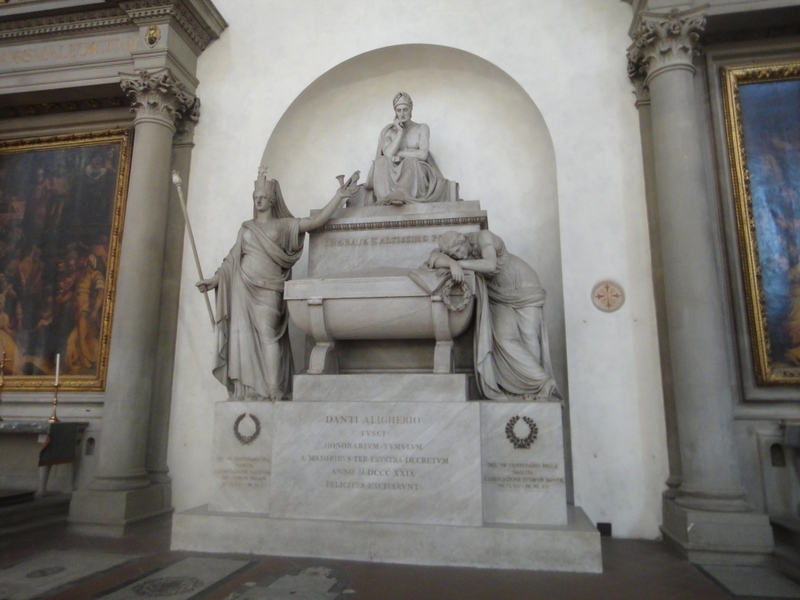 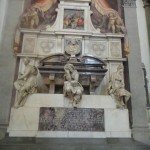 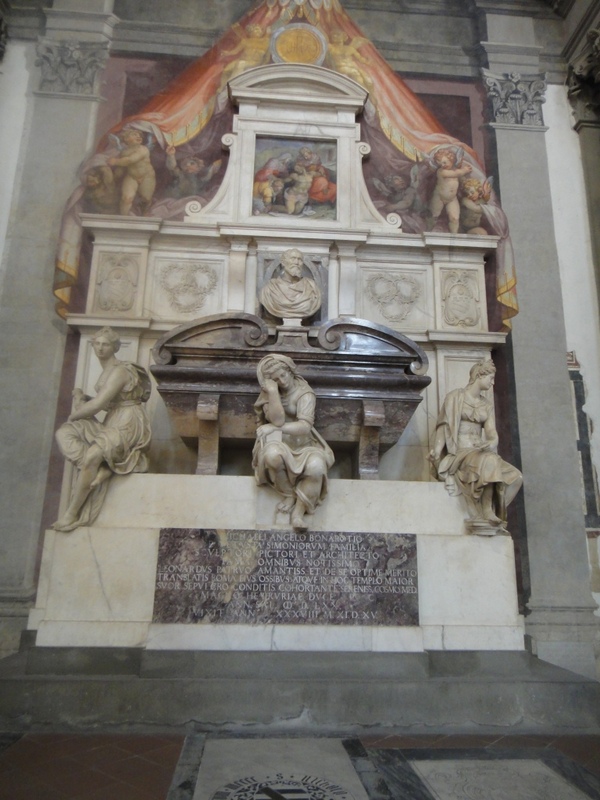 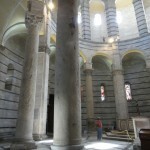 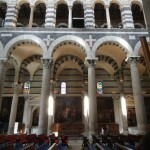 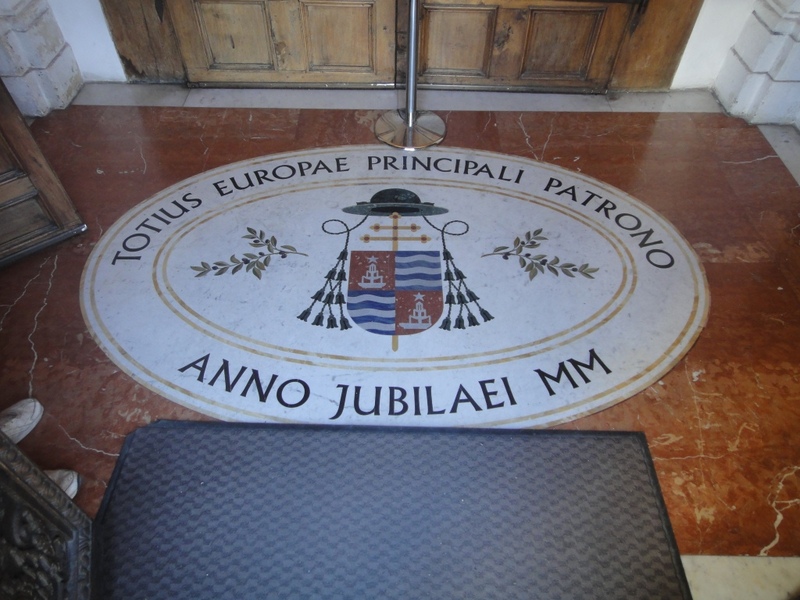 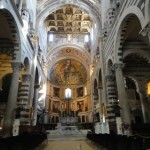 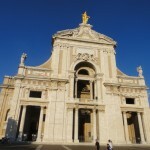 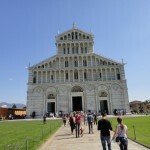 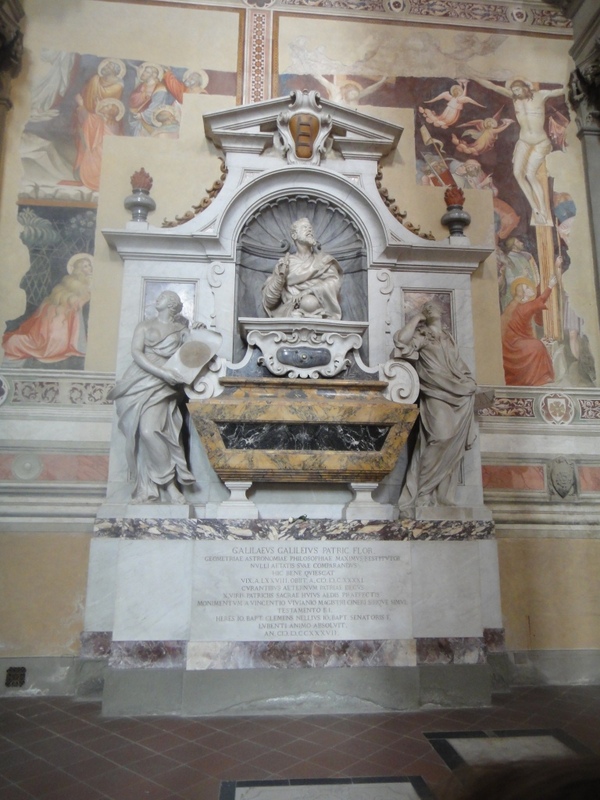 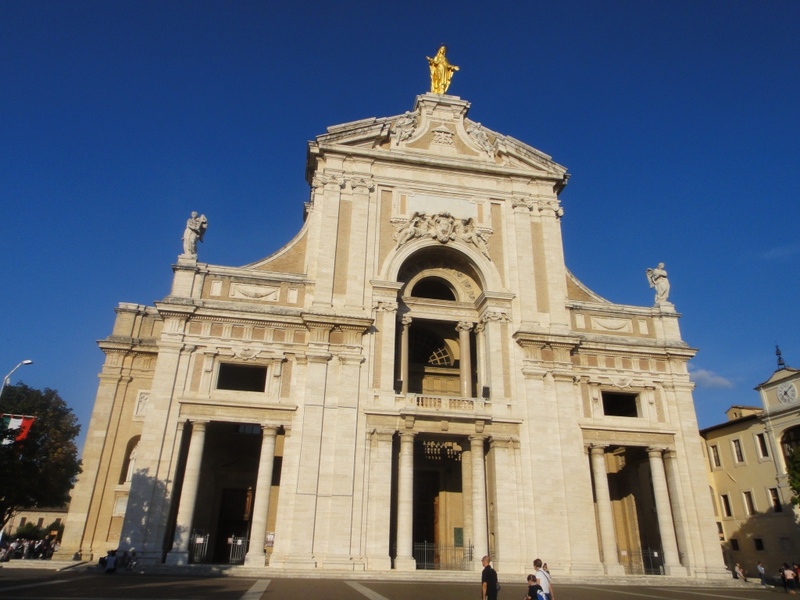 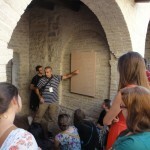 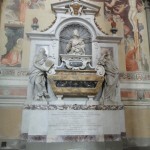 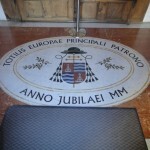 In this famous church lie buried men such as Galileo, Michelangelo, and Machiavelli. 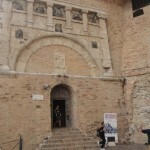 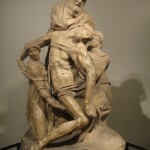 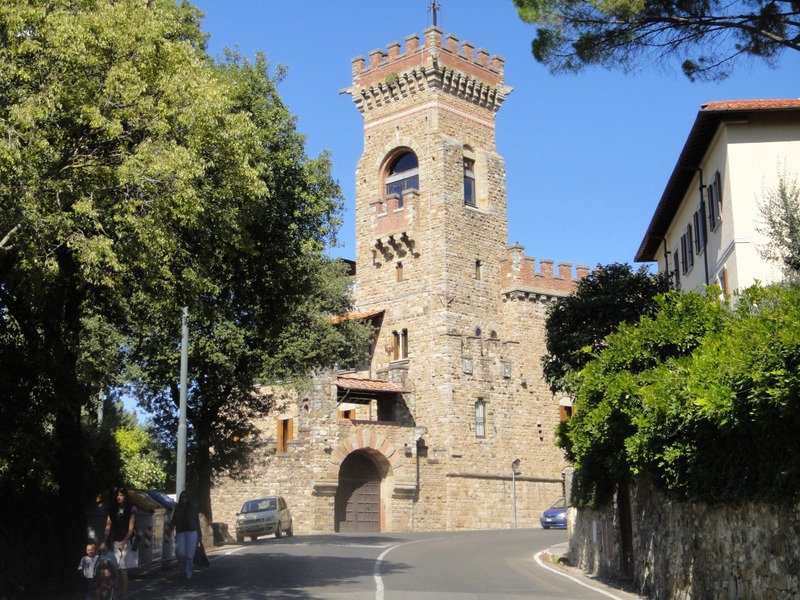 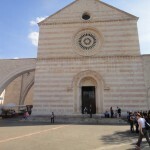 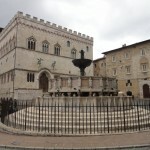 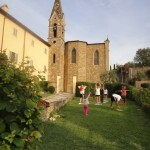 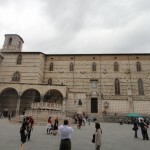 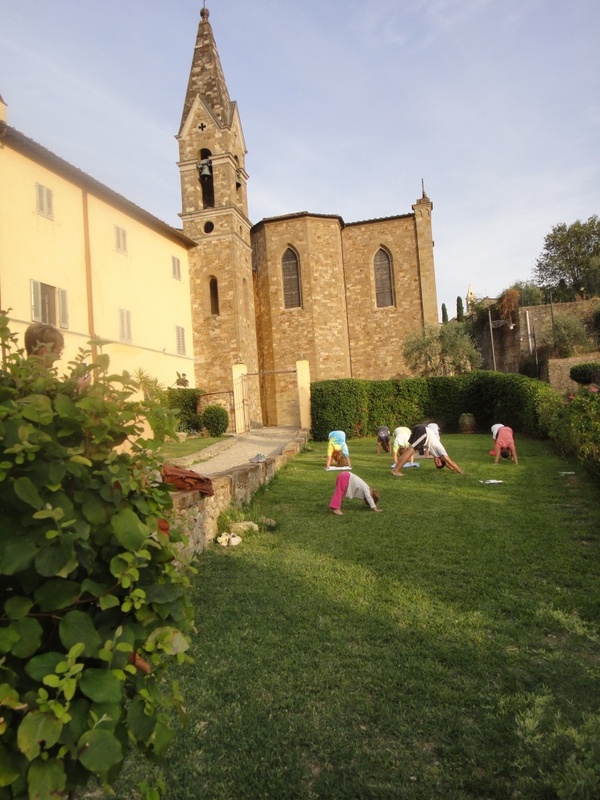 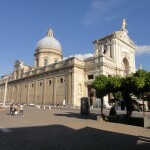 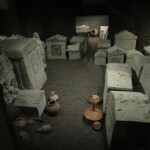 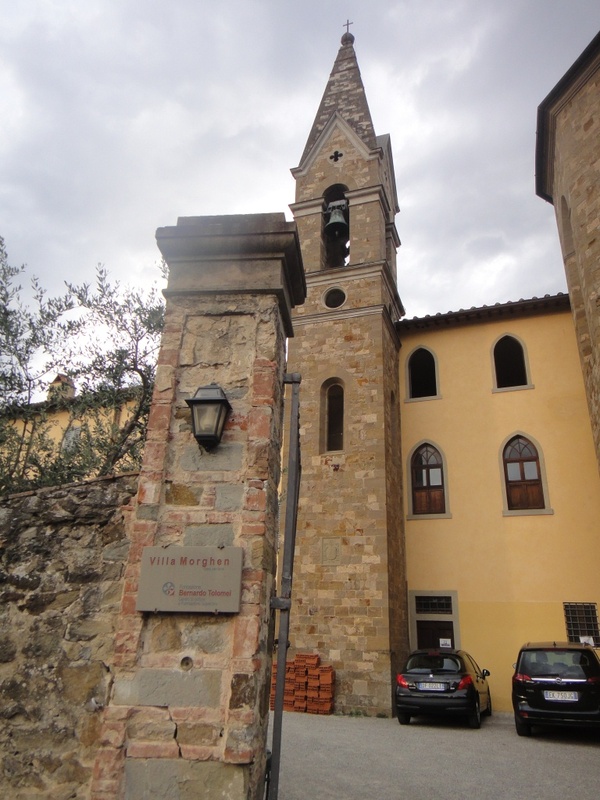 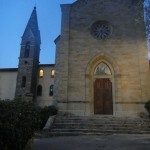 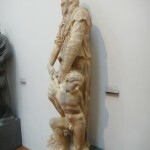 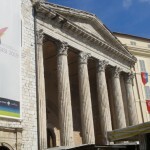 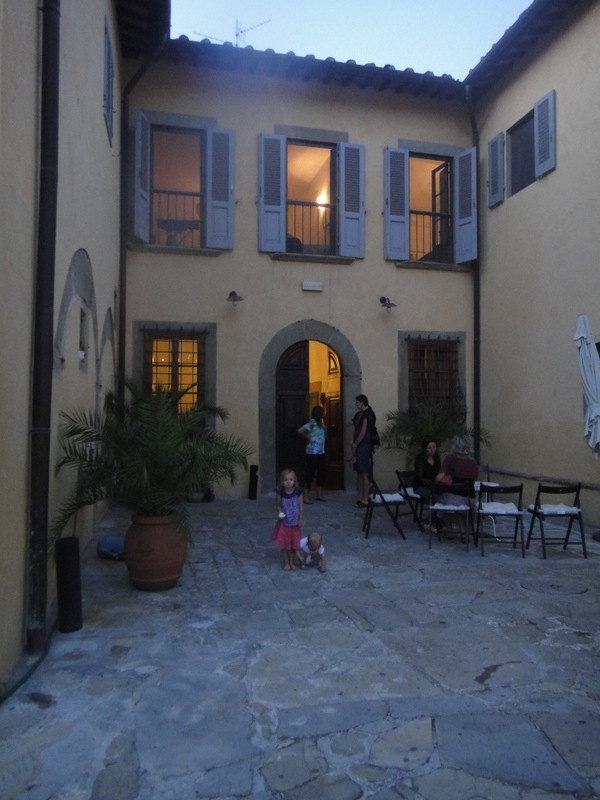 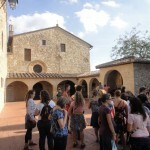 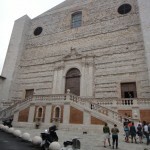 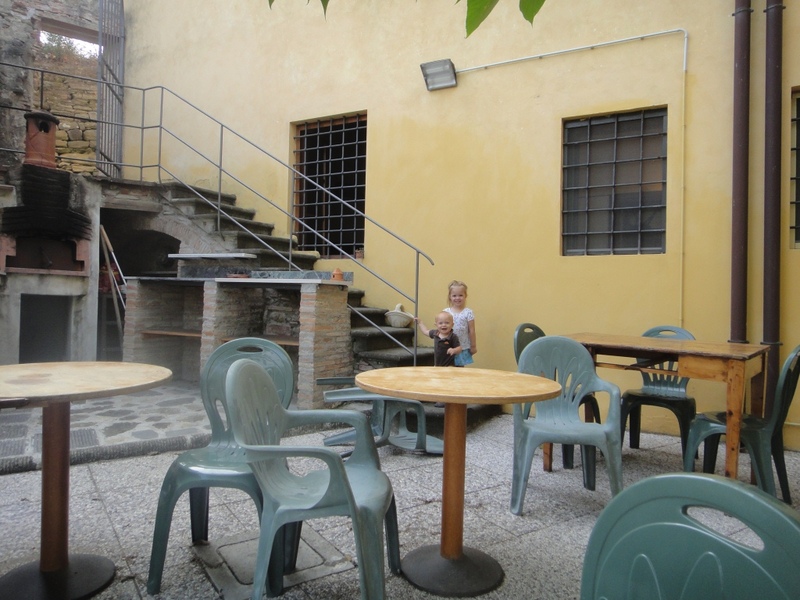 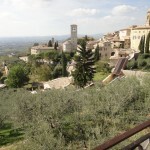 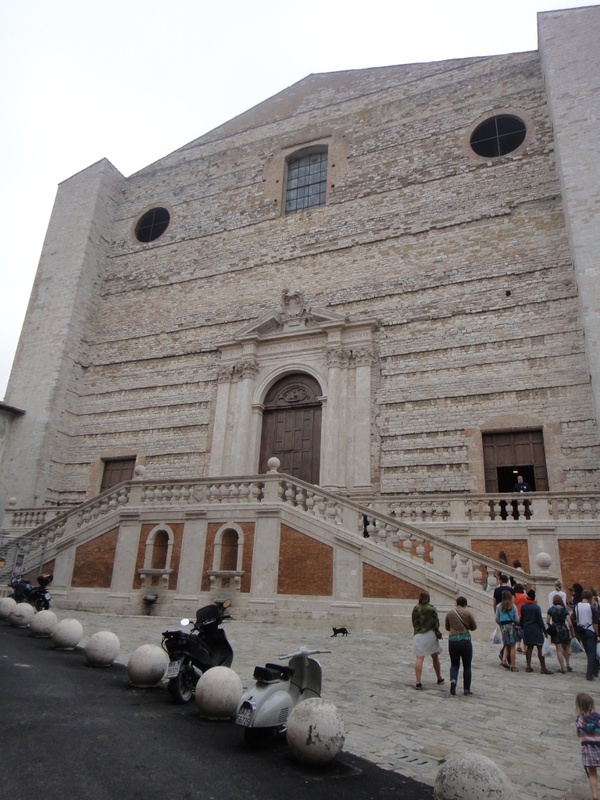 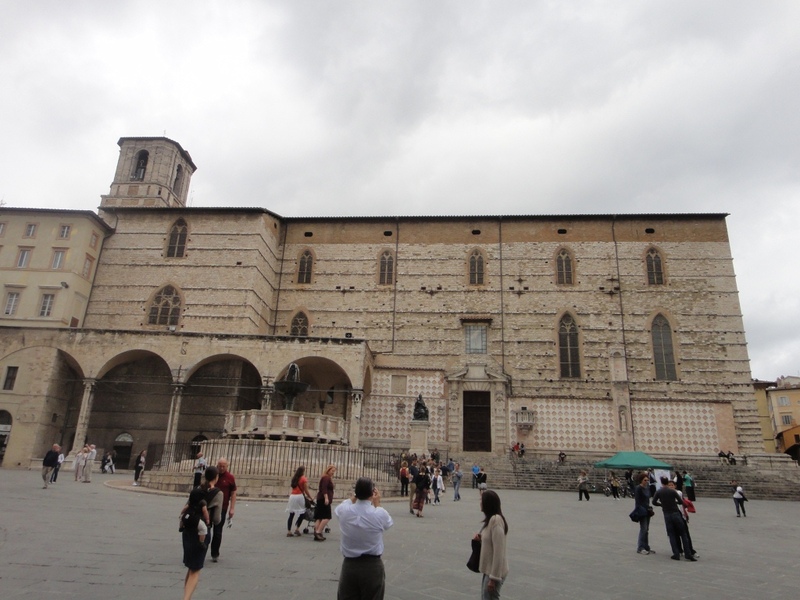 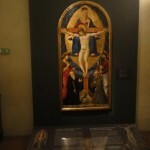 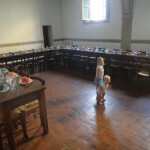 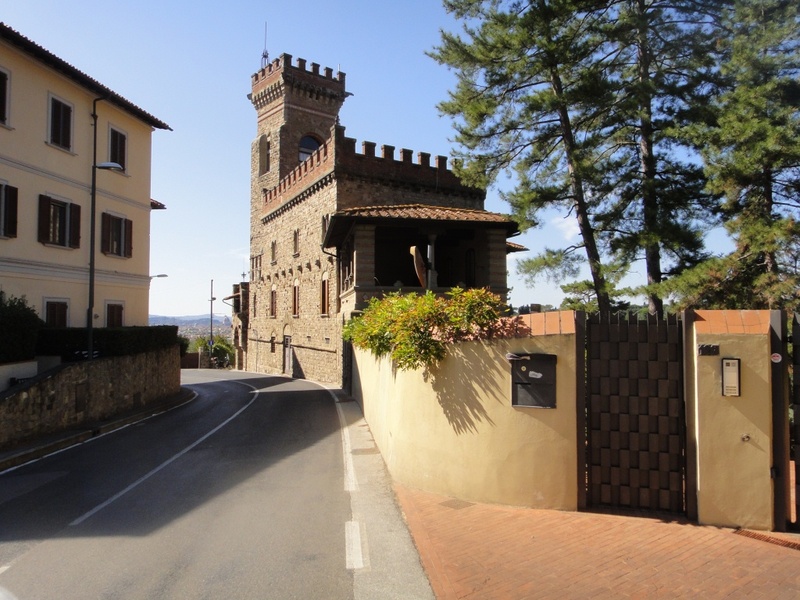 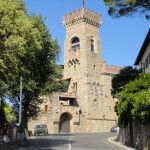 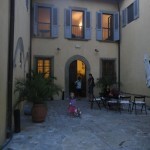 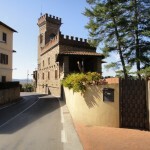 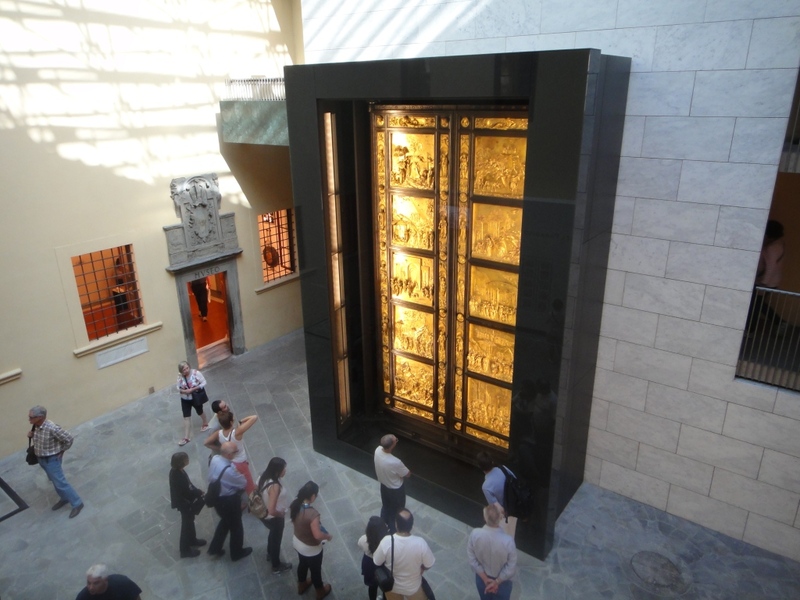 Its museum, formerly a Franciscan convent, houses art from Cimabue and Donatello among other greats. 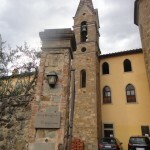 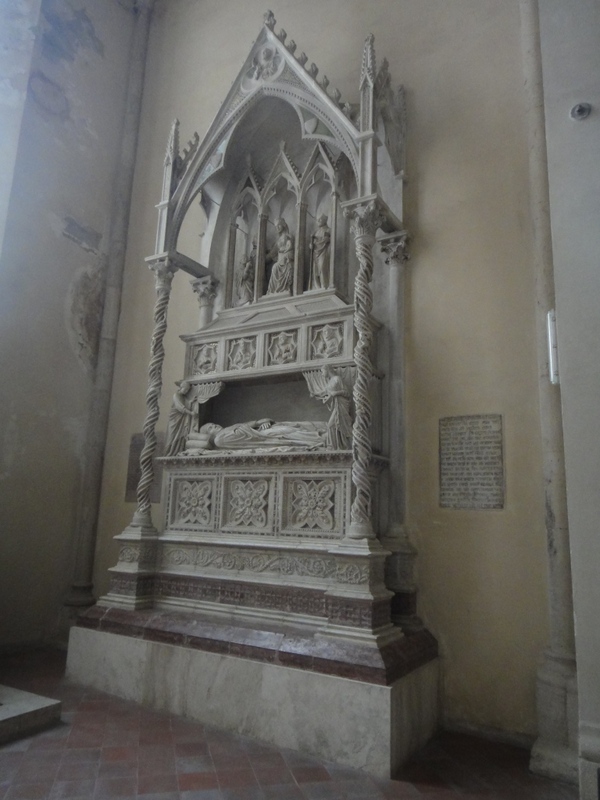 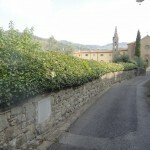 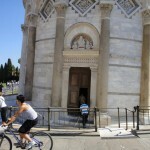 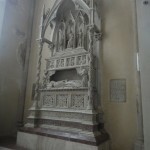 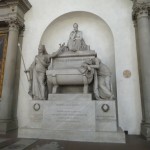 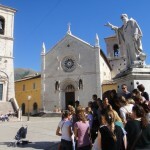 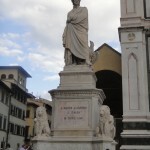 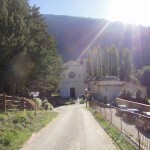 As for Dante, there is a huge statue of him outside in front of the church, and then inside there is a “tomb” of Dante. 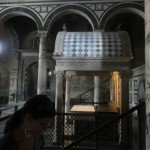 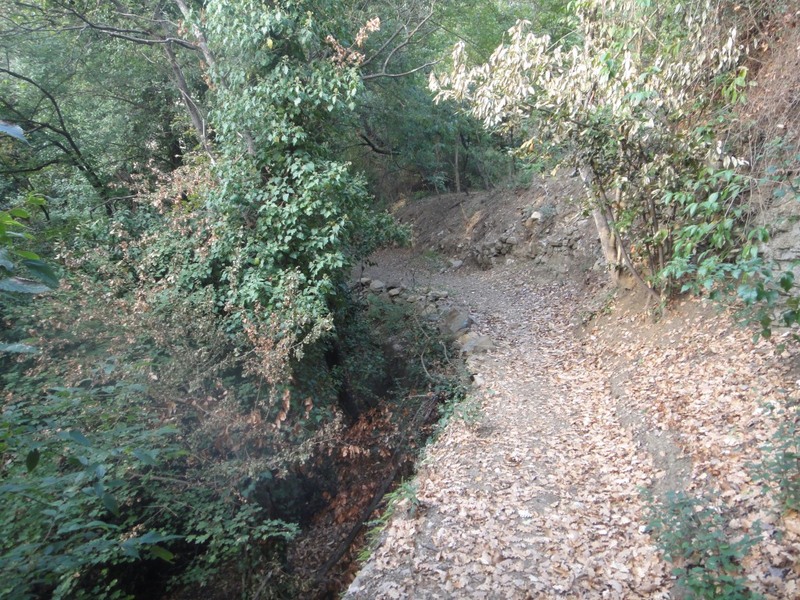 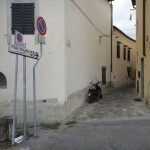 Dante’s body is not actually there–it’s in Ravenna where he died after he was exiled from his beloved Florence. 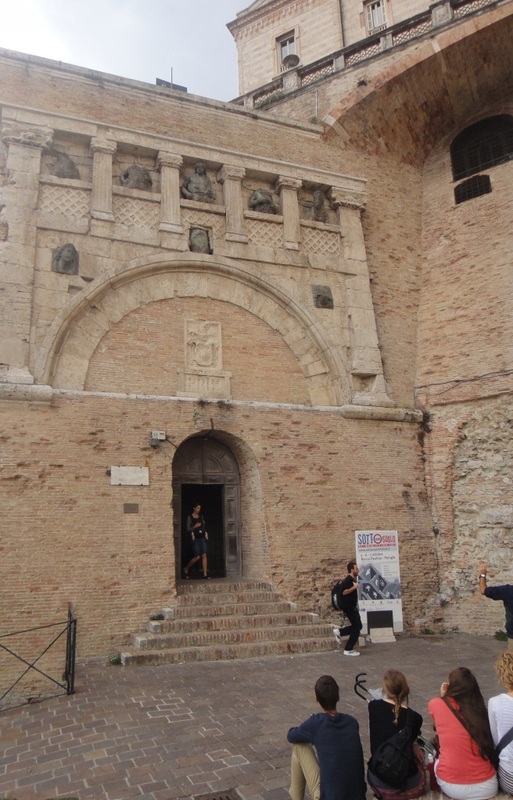 The Florentines tried to get him back, but Ravenna told Florence, “If you didn’t want him when he was alive, you can’t have him now that he’s dead, either.” I really enjoyed praying a bit at this site. 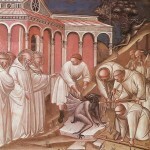 I can’t say if Dante is a saint in Heaven you can pray to, but certainly we can all strive to enter into the mystery he presents in the Comedy, that great journey out of the hellish pit of our sins through the mountain of purgation unto the celestial heights of virtue and union with God. 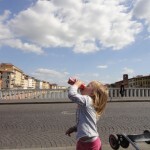 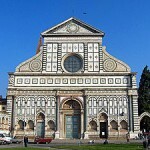 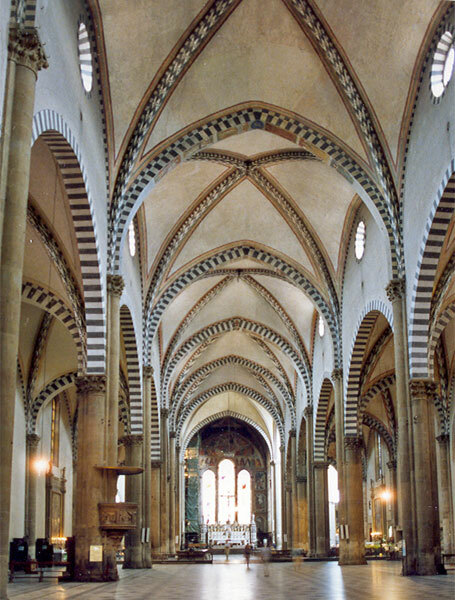 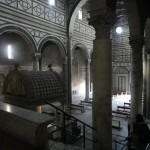 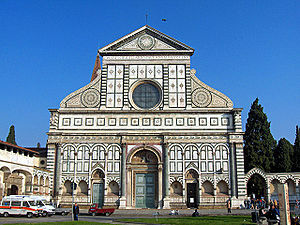 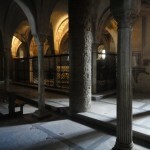 The second site I’d like comment on is the church of Santa Maria Novella in Florence. 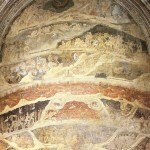 In a side chapel you can find panels depicting the Last Judgment and the Comedy’s three realms, Hell receiving the most attention. 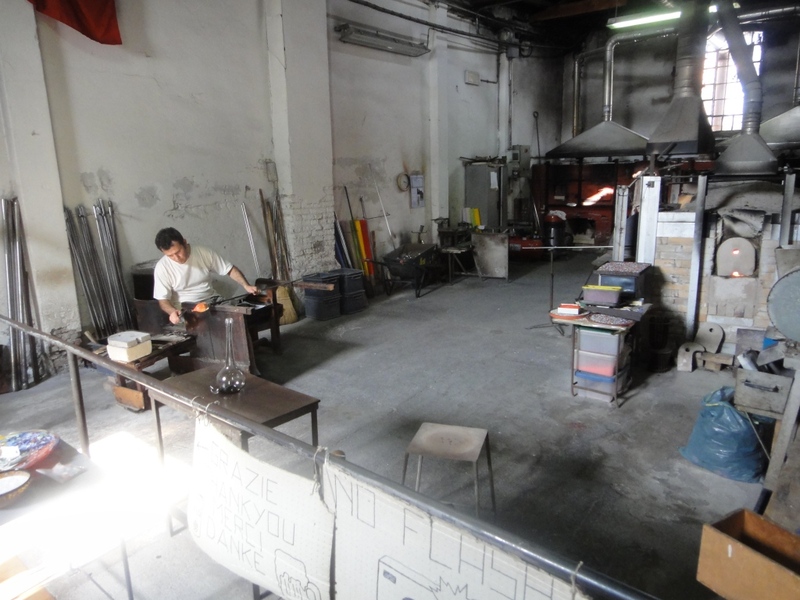 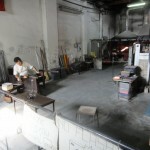 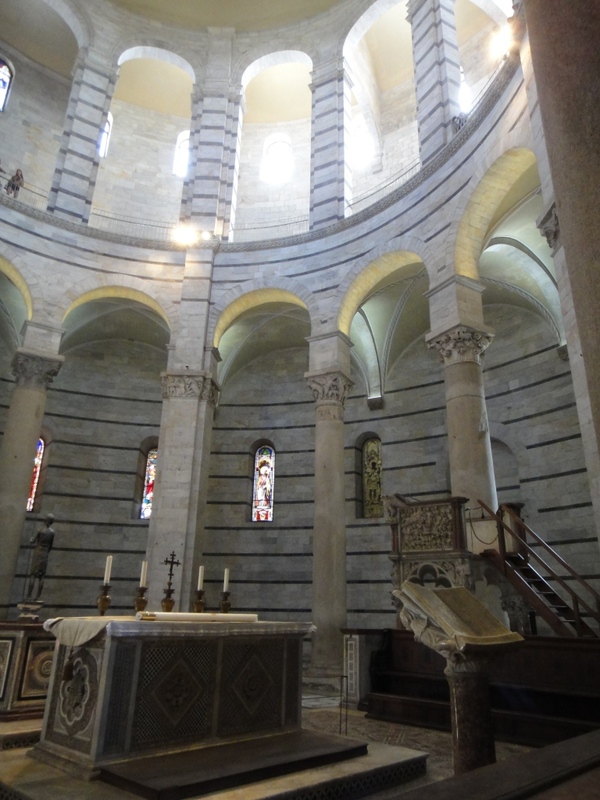 The works are deeply in need of restoration but are still great. 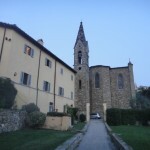 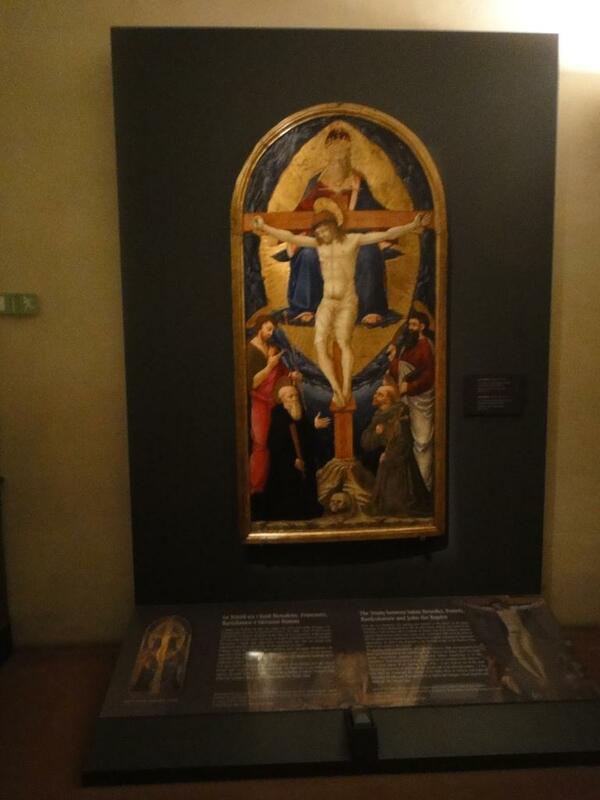 In this church you can also find masterpieces such as Masaccio’s Trinity–the first of the Renaissance to use perspective–as well as crucifixes from Giotto and Brunelleschi. 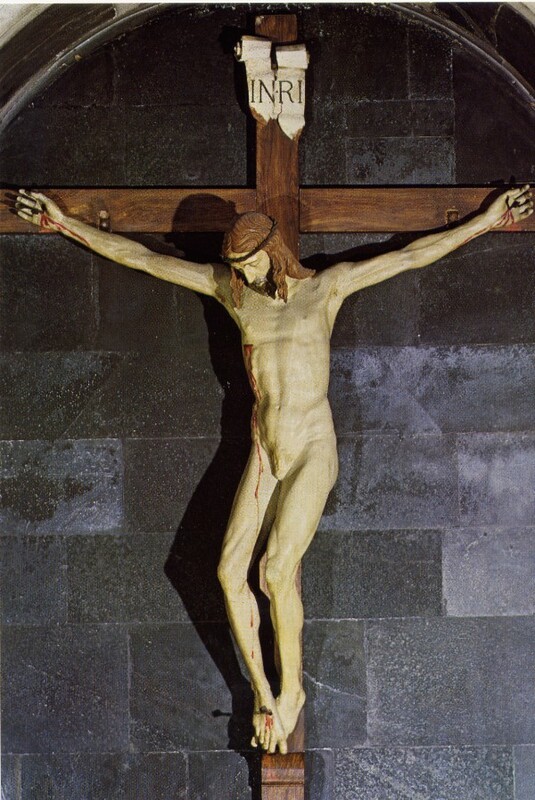 Below I have posted a complete view of Giotto’s crucifix and a close-up of its bottom wherein Christ’s blood drips upon a skull, traditionally understood to be that of Adam. 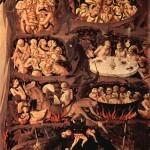 This is one variation on a common theme in Western and Eastern art–that of Christ harrowing Hell and raising Adam, Eve, and the patriarchs. 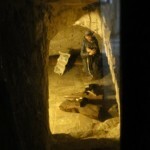 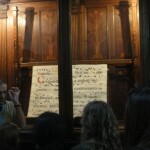 In Jerusalem, there is also a chapel of Adam and Eve under the site of Golgotha in the Church of the Holy Sepulcher. 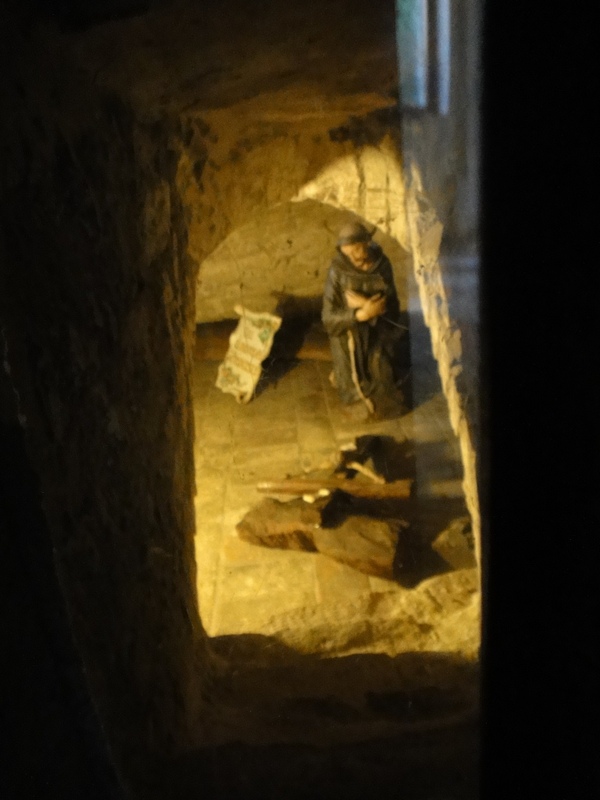 Here you see a fissure in the rock directly below the crucifixion site which is described as the place where Christ’s blood dripped down to reach those in limbo who awaited his coming. 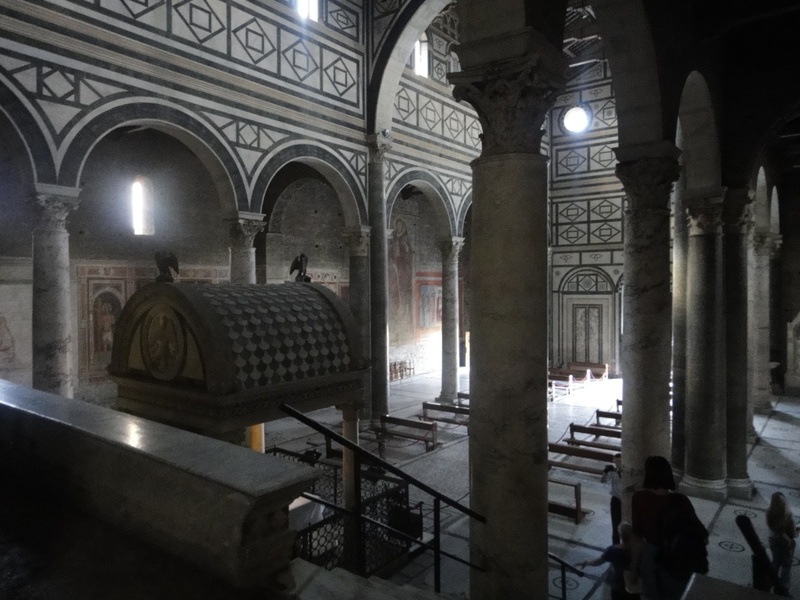 Brunelleschi’s first dome atop the Pazzi Chapel within the complex of Santa Croce in Florence. 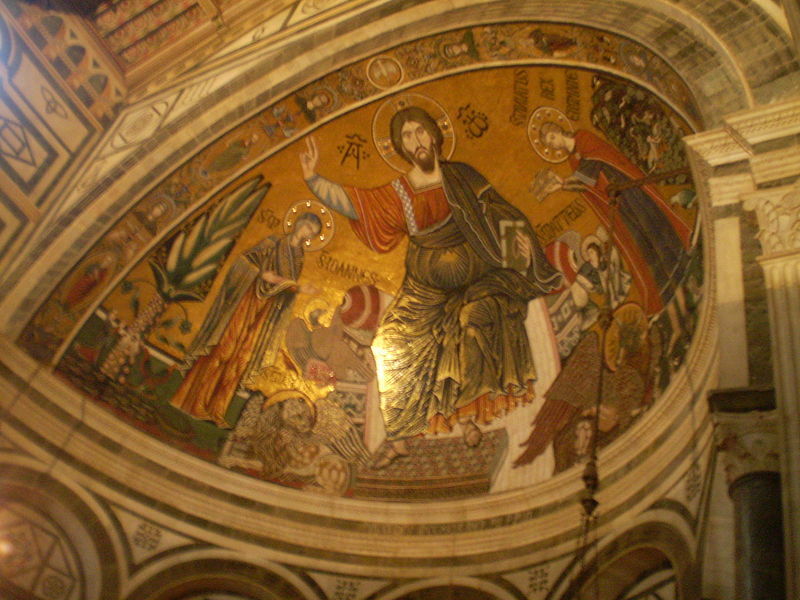 This was a “practice” dome for the great one atop the Duomo. 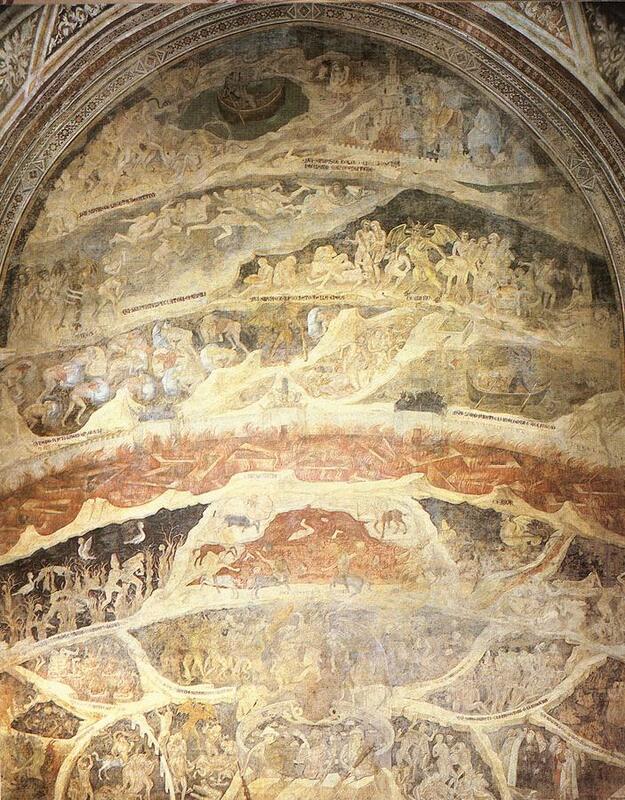 A segment of Fra Angelico’s Last Judgment in San Marco, Florence. 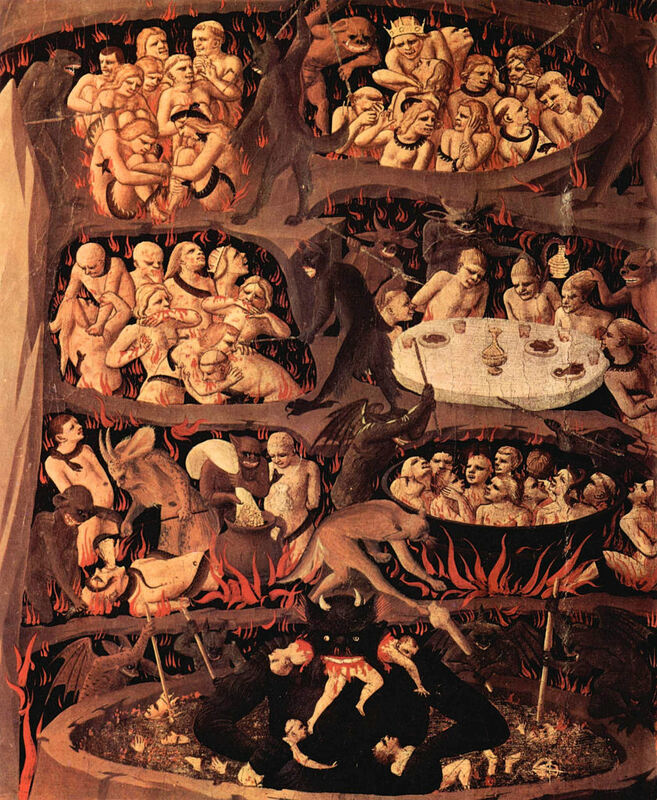 See Satan at the bottom with his three heads as depicted in the Divine Comedy. 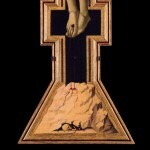 More on this another time. 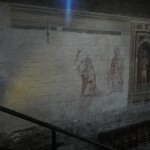 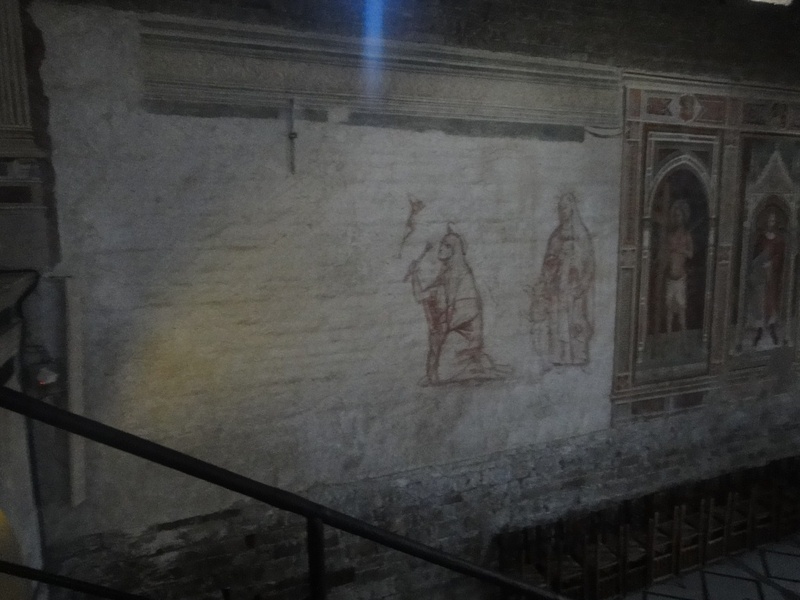 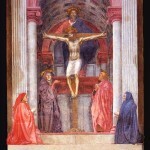 Masaccio’s Trinity in S. Maria Novella with perfect persepctive. 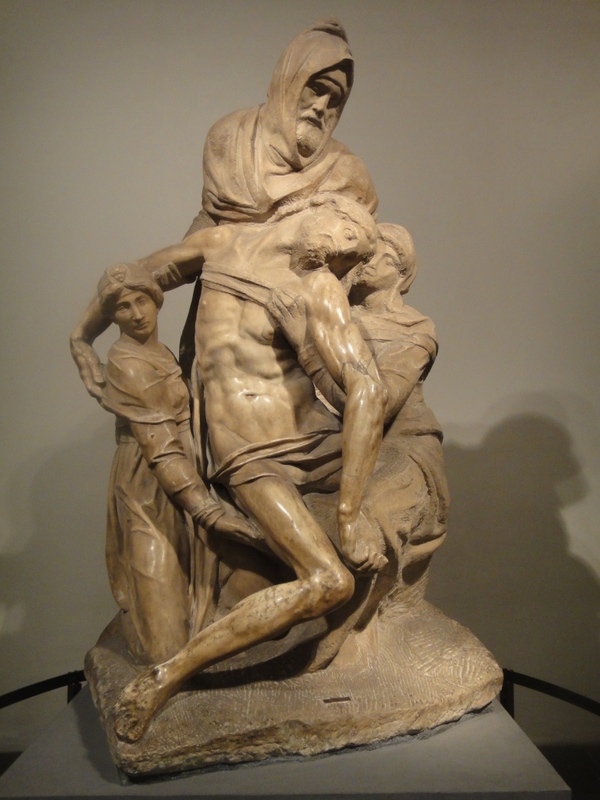 The skeleton below is accompanied by the words, “WHAT YOU ARE, I ONCE WAS; WHAT I AM, YOU WILL BECOME”–a true memento mori. 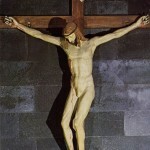 Close-up of the bottom of Giotto’s crucifix with Christ’s blood drips upon a skull, traditionally understood to be that of Adam. 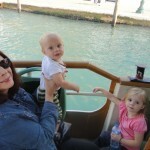 The past week has been yet another wild ride for us Ramages and our BC group. 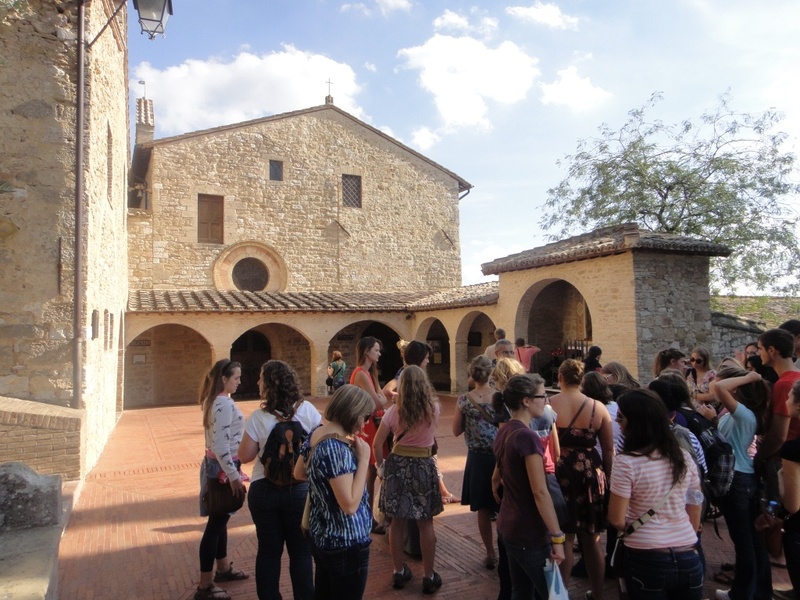 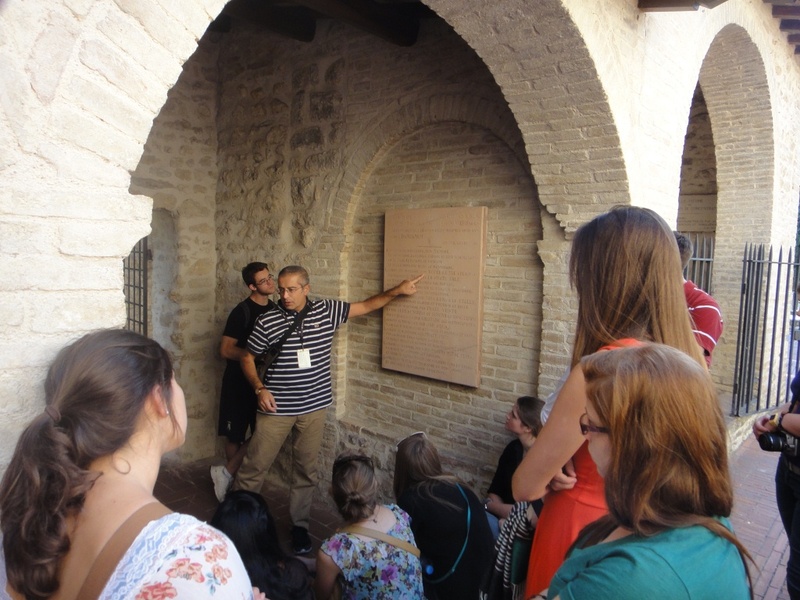 This weekend students went all around Europe, with some going to Germany, others to Spain, others to Poland, and others–like us–traveling within Italy. 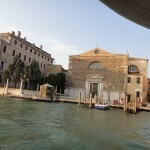 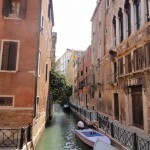 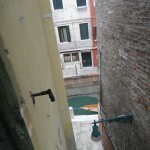 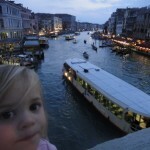 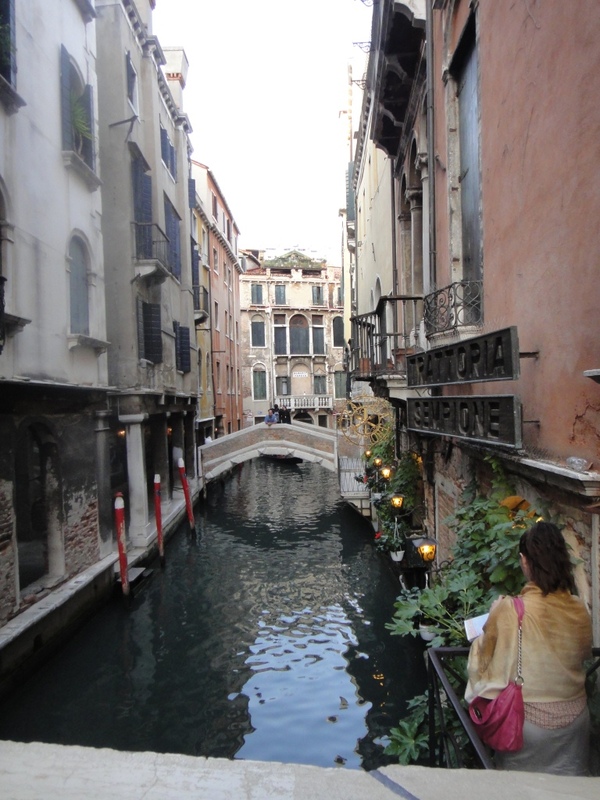 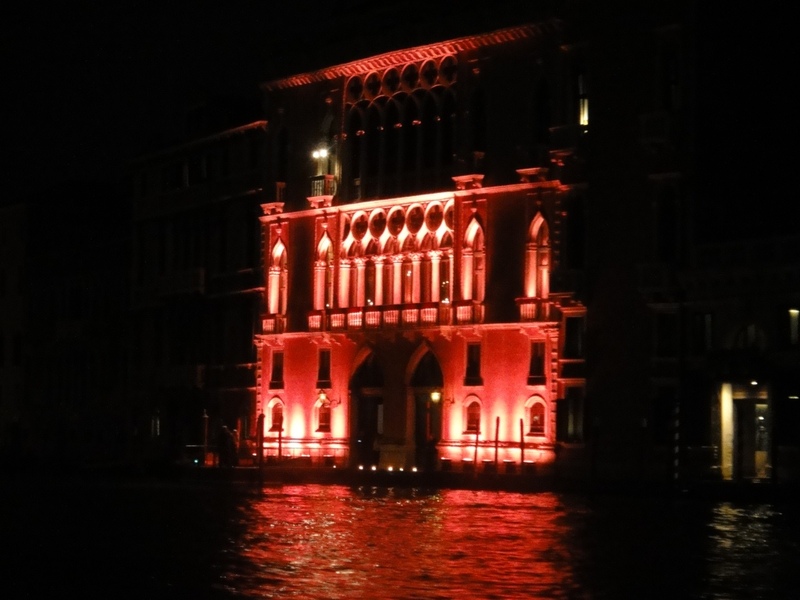 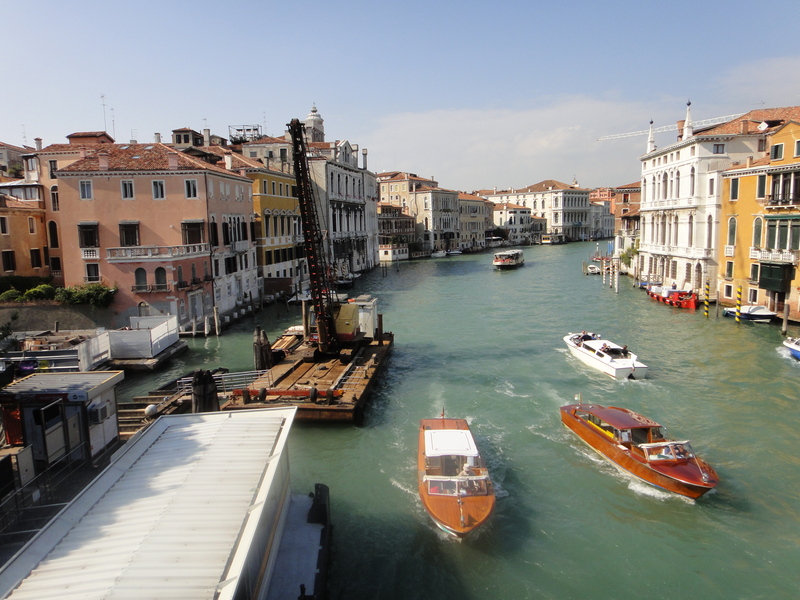 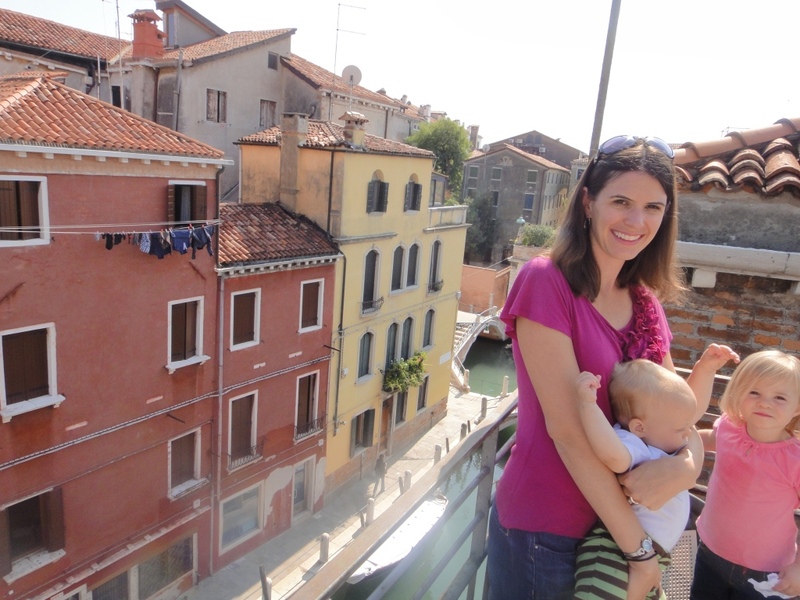 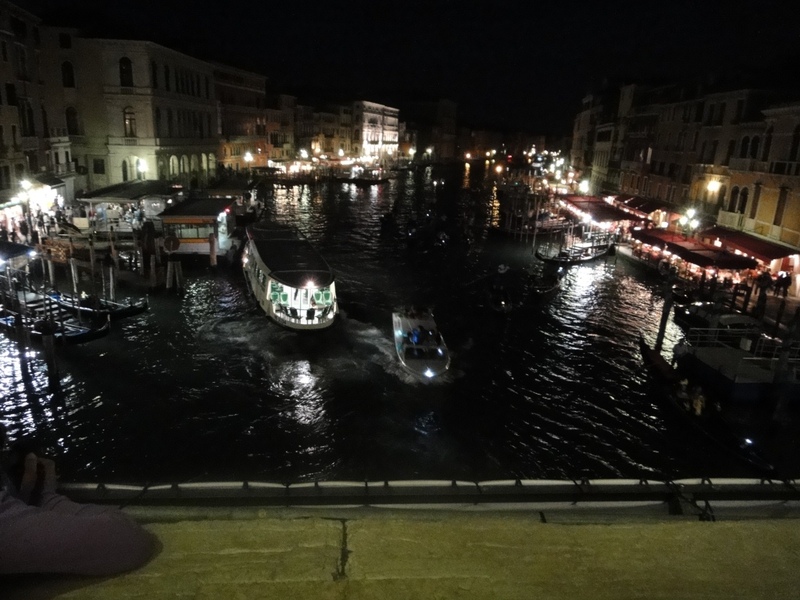 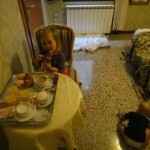 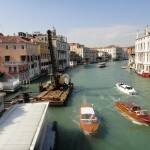 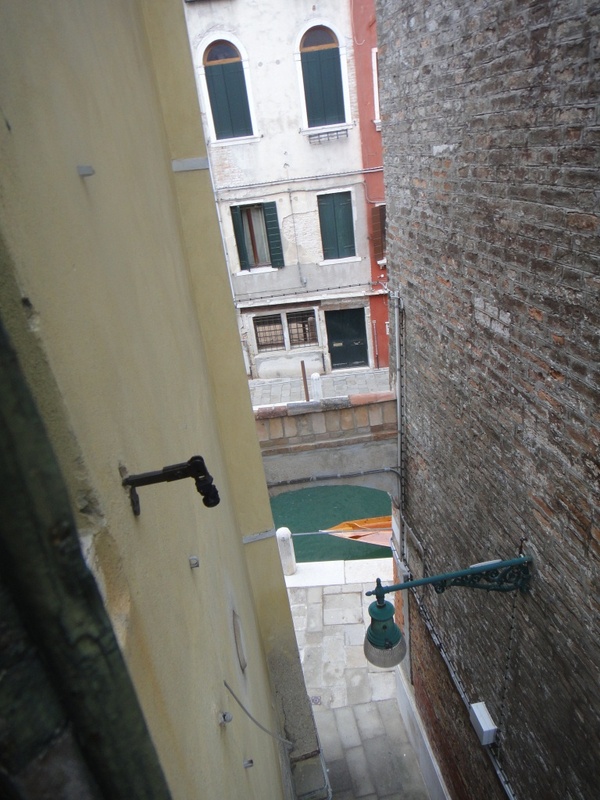 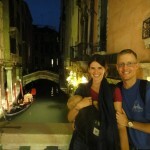 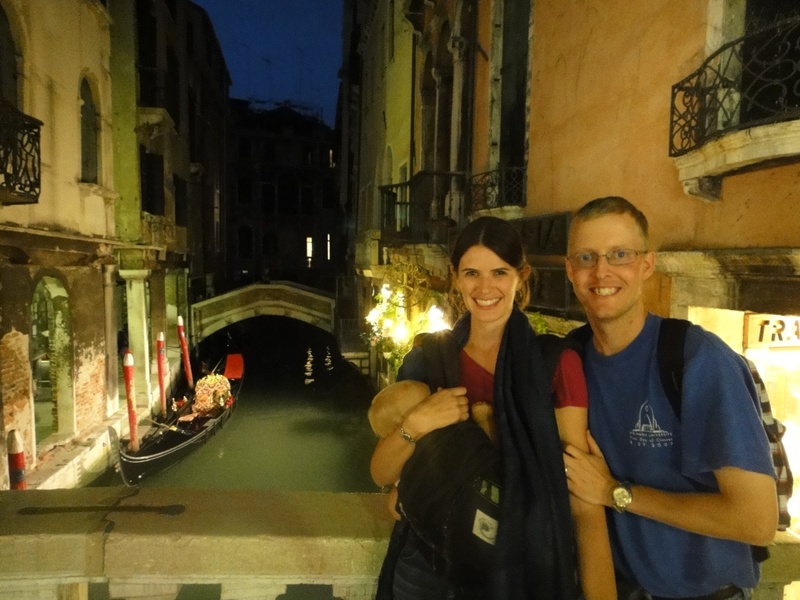 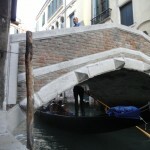 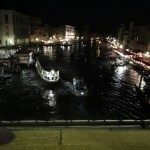 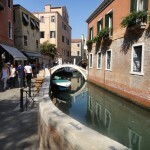 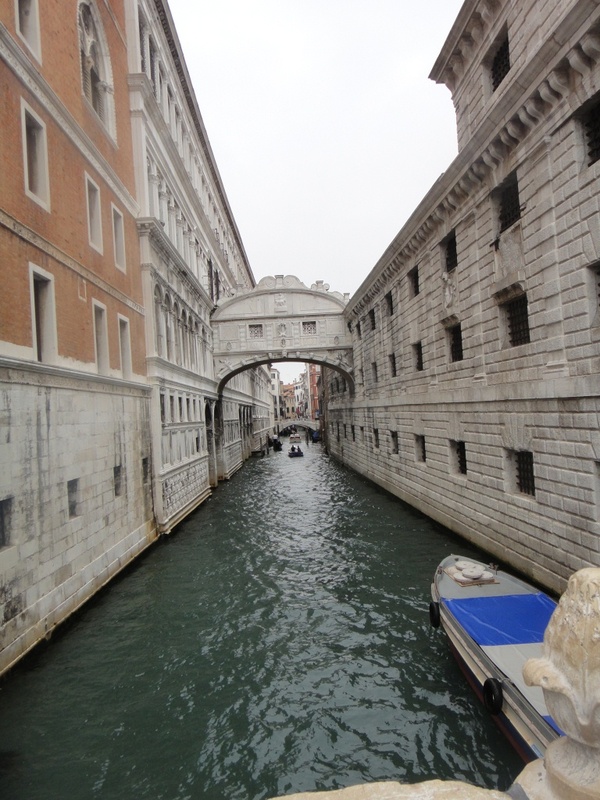 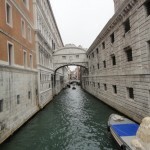 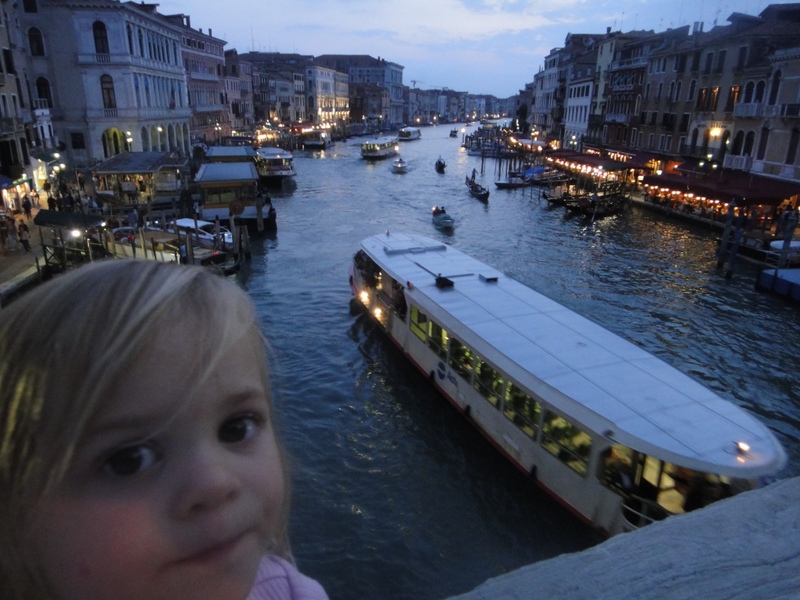 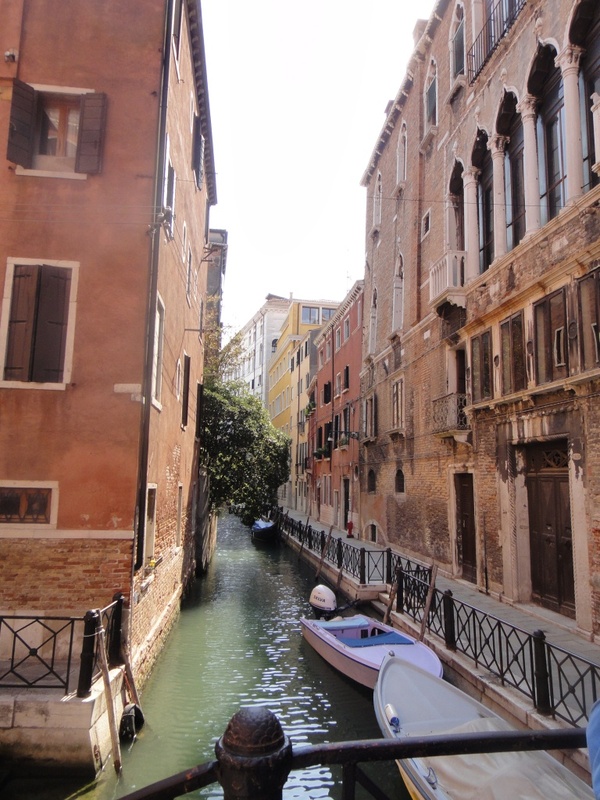 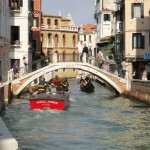 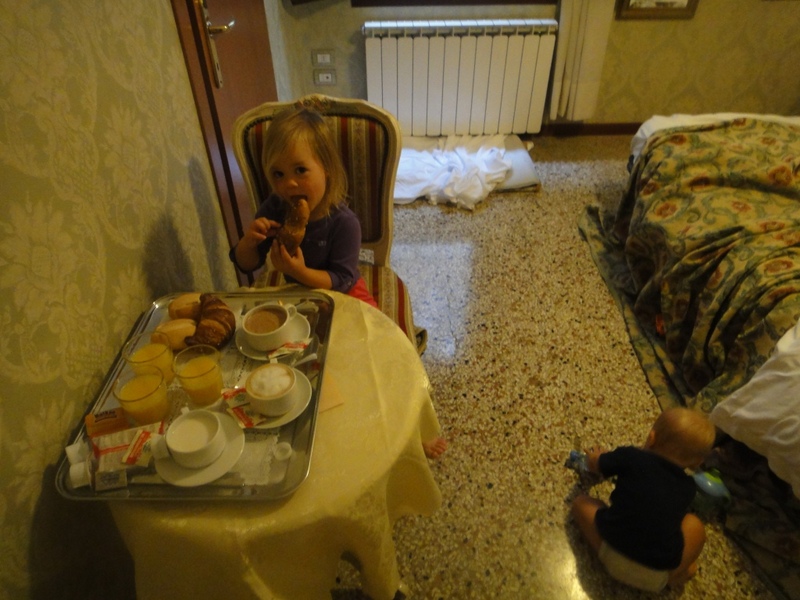 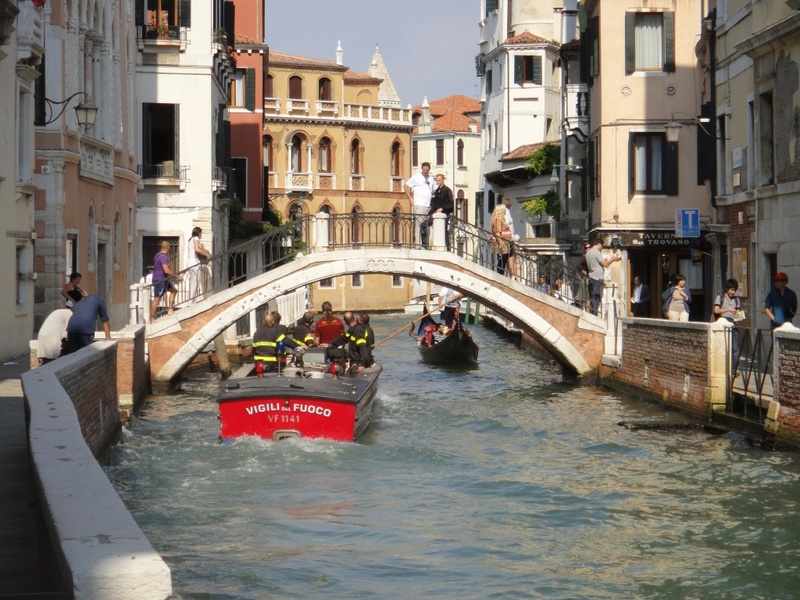 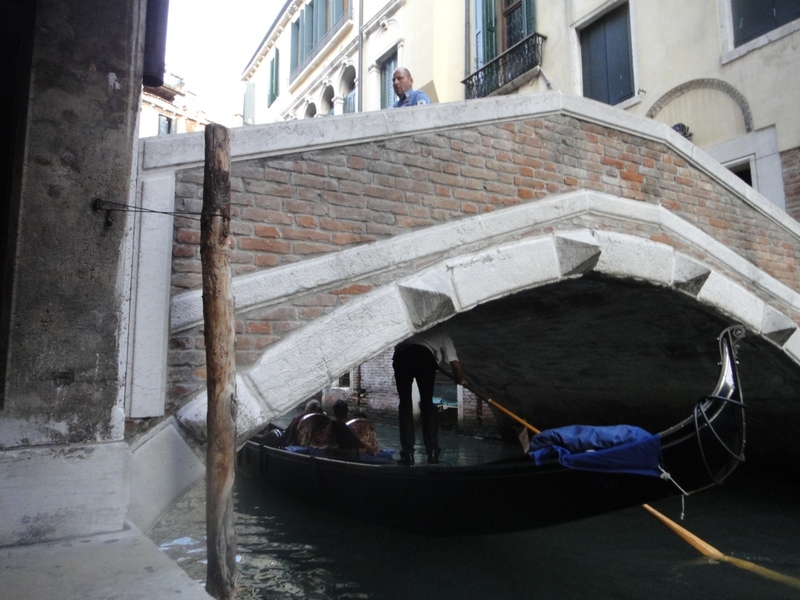 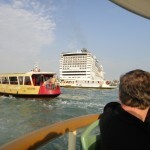 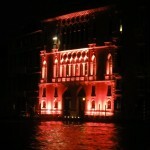 Our choice for the weekend was Venice, which more than surpassed my expectations. 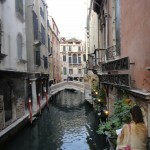 Unlike some other Italian towns, the cat has long been out of the bag when it comes to Venice’s beauty. 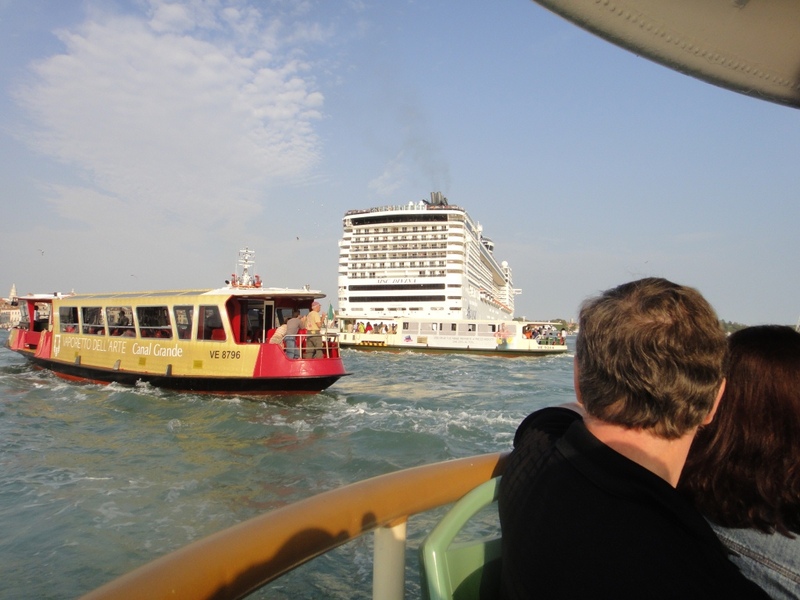 Indeed, the hordes of tourists and cruise ships that pile into the island town daily can be annoying, but once you remember that you too are one of those tourists and just accept that most great sites are like this, it is no problem. 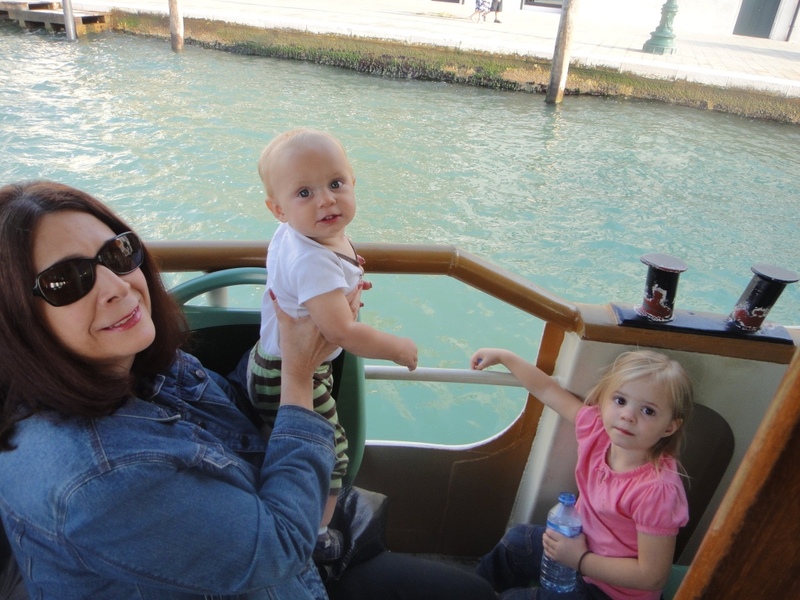 For me, the best part of Venice is just walking around and taking the vaporetto (boat) around the lagoon to take in the rustic beauty of the old palaces and churches sitting on the water. 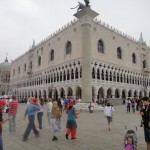 Saint Mark’s Basilica is of course great. 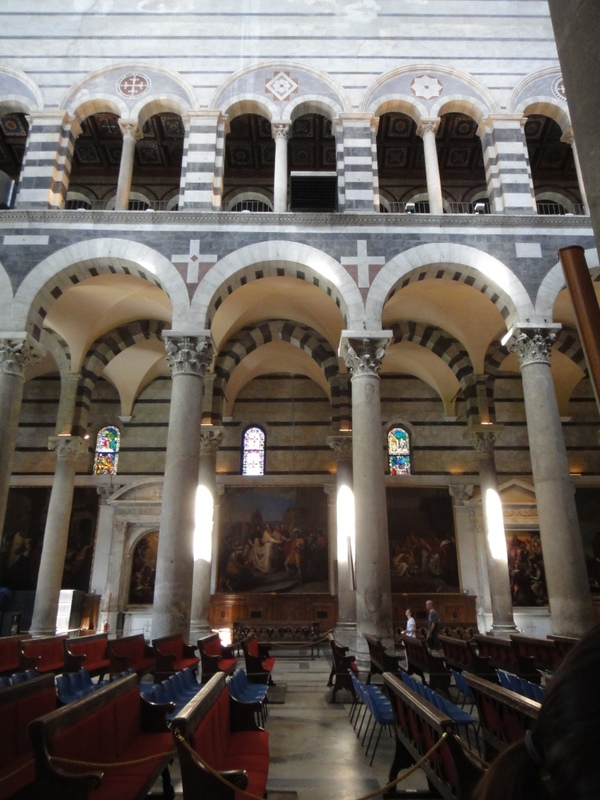 I am a big fan of Eastern-style churches and art, and this one fits the bill as it was constructed with the experience of Venetians who knew the East and who had gone on Crusades. 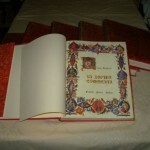 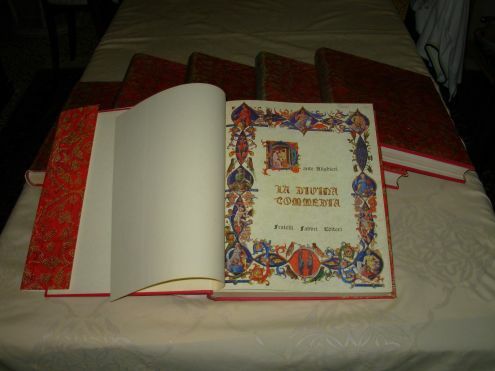 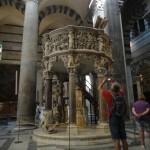 (In fact, some if the infamous deeds of Christian Crusaders were committed precisely by the Venetians!) 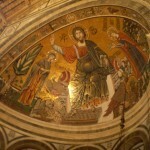 It’s great to go into an Italian church and see icons of the Pantocrator and the Descent into Hades. 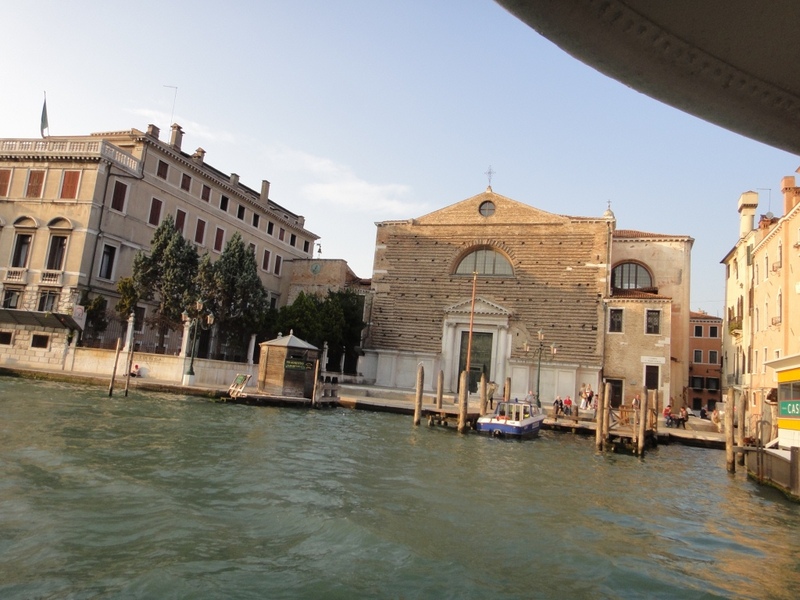 Then of course St. Mark is buried there, having been “rescued” from Alexandria by the Venetians who needed a big saint for their big empire. 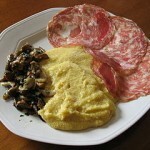 Another one of my favorite parts of the weekend: Sopresa Veneta. 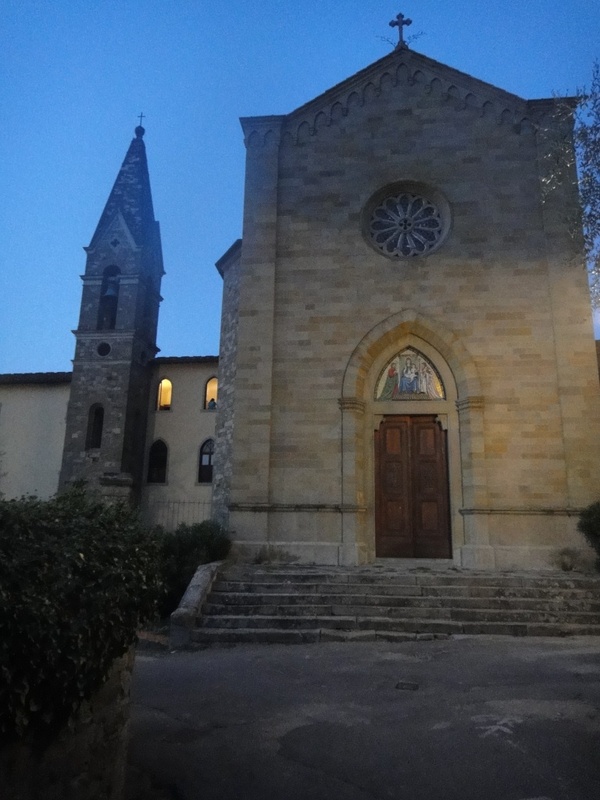 No, it’s not a church. 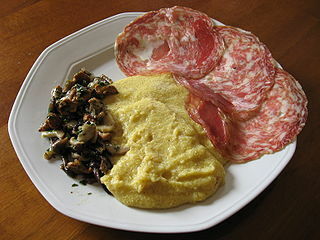 It’s meat, a specialty of the region which we bought on the cheap along with some cheese and bread for an outdoor lunch in front of the train station on our way home. 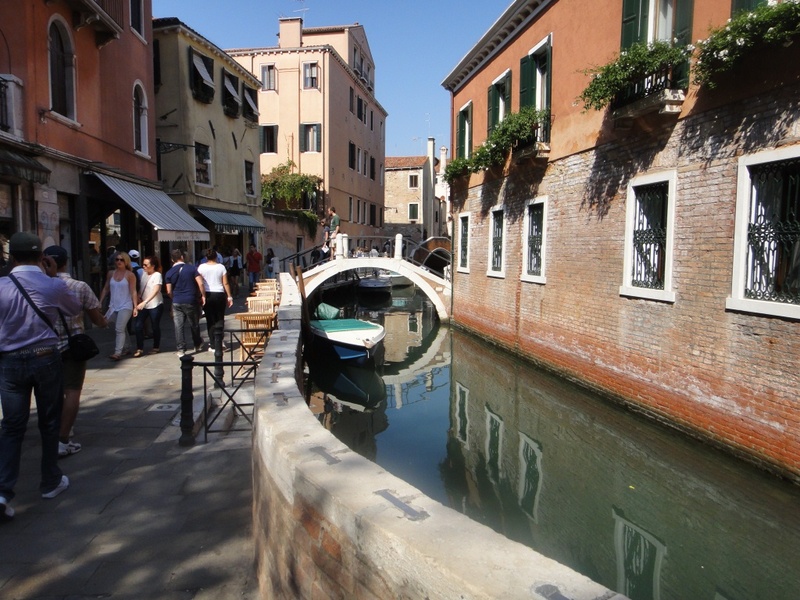 The simple things in life, like a nice view of a body of water or a tasty panino, are sometimes the best. 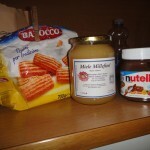 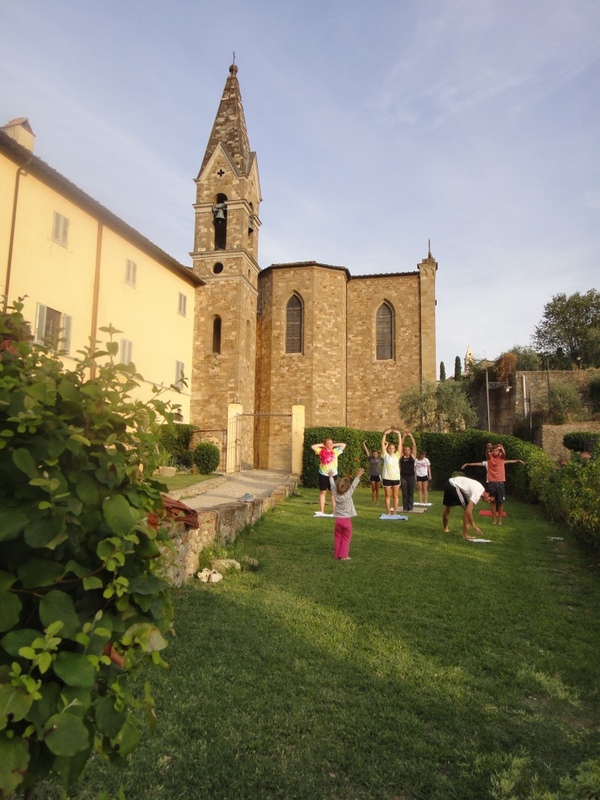 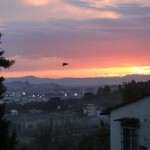 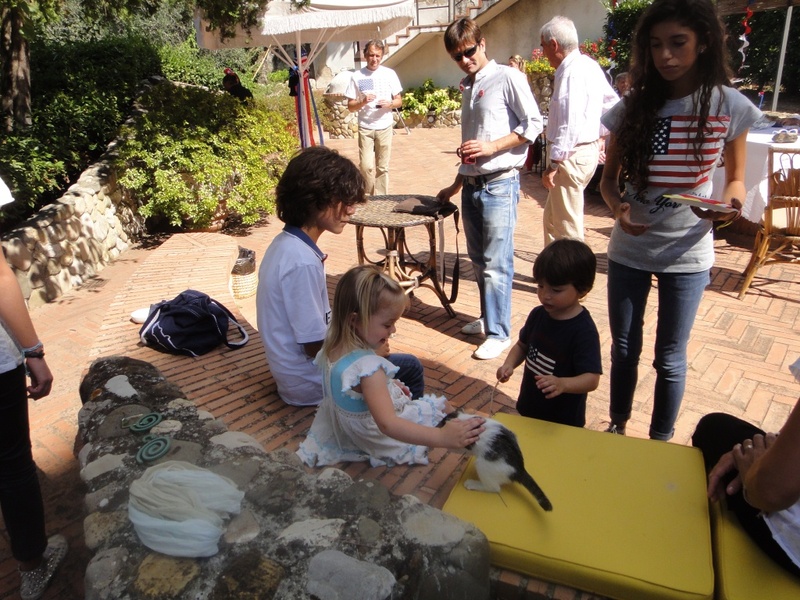 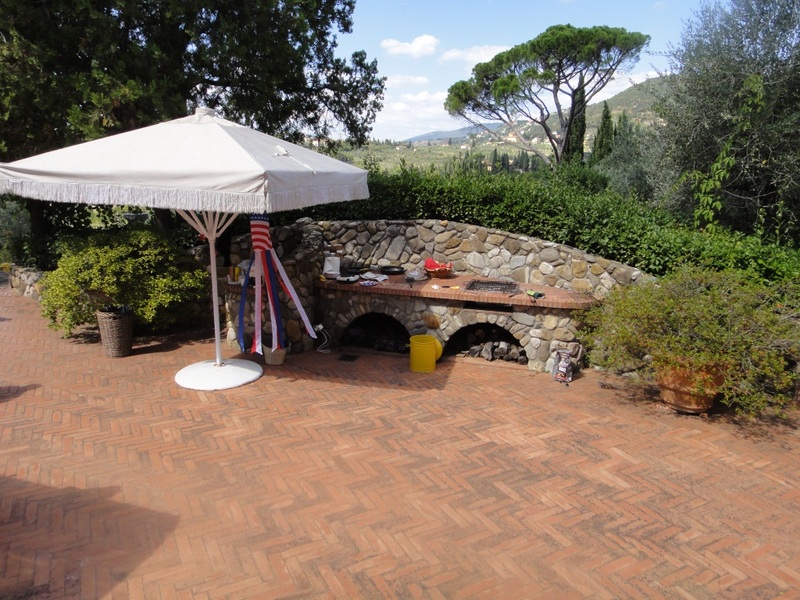 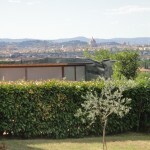 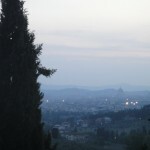 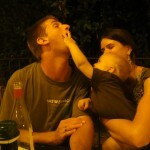 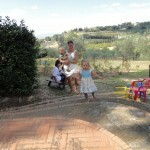 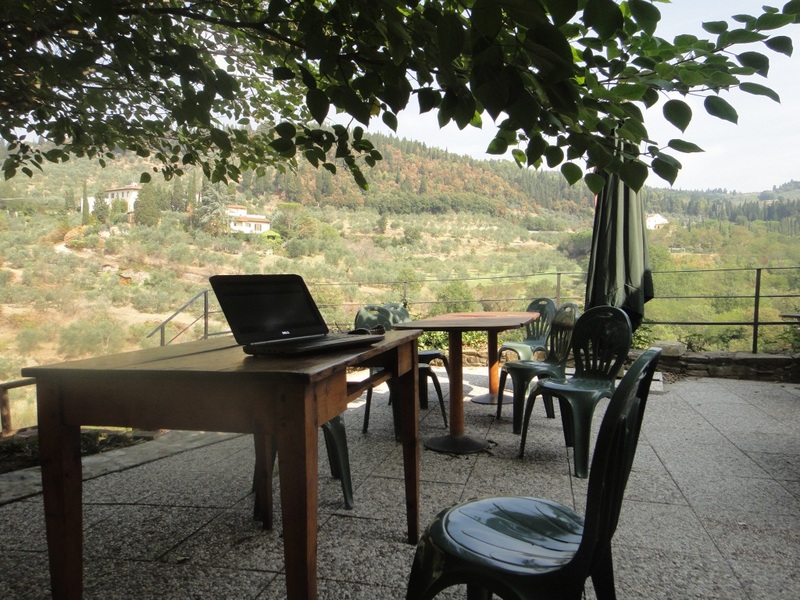 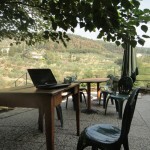 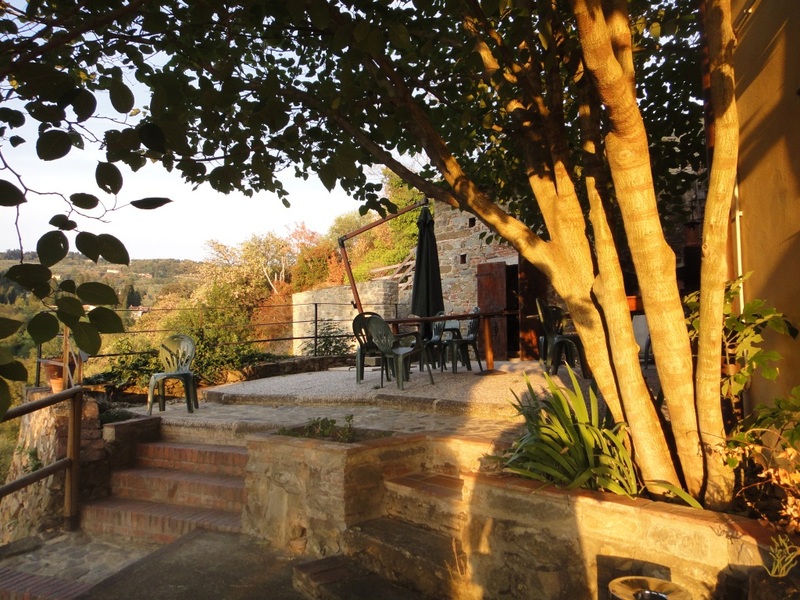 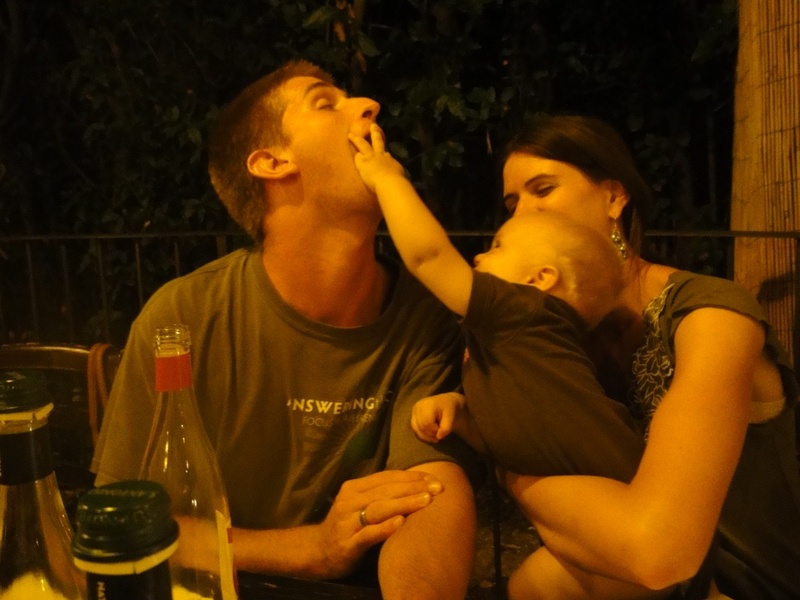 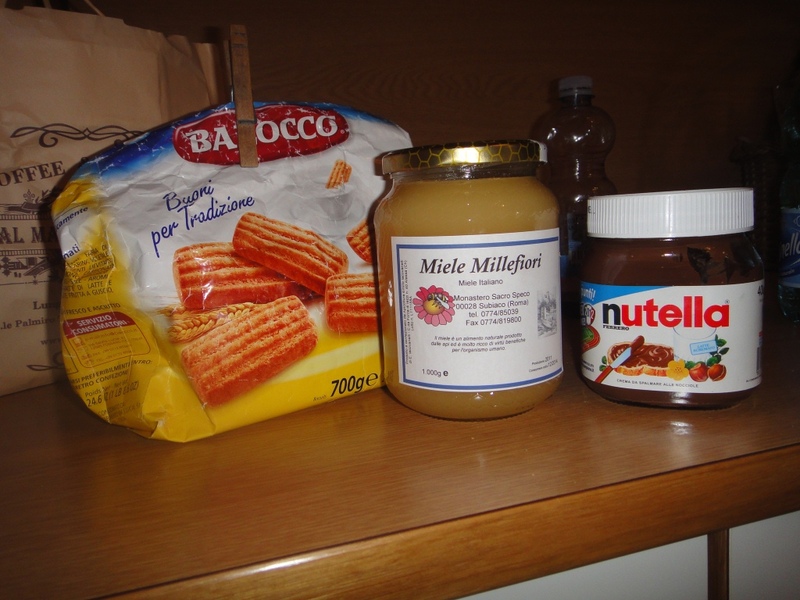 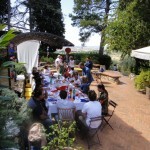 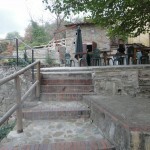 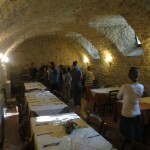 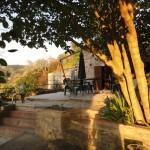 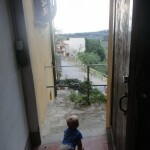 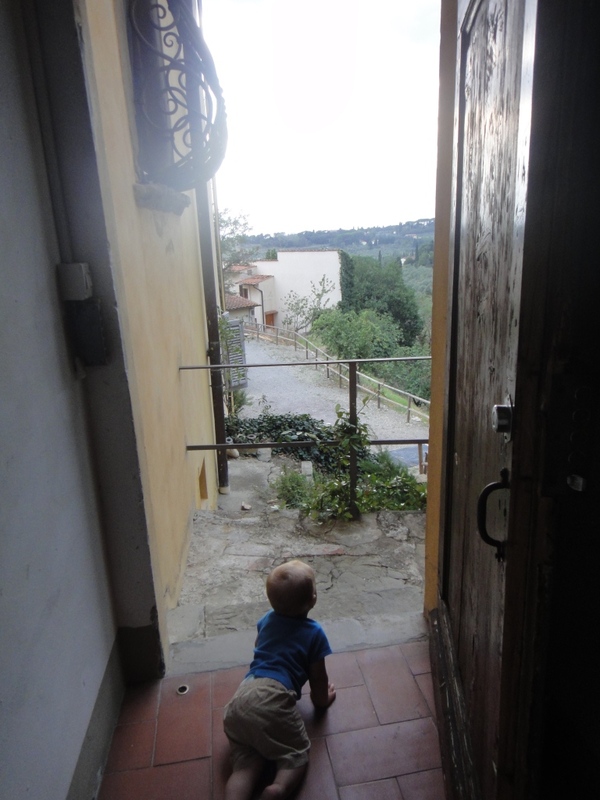 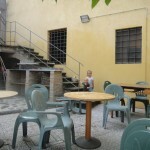 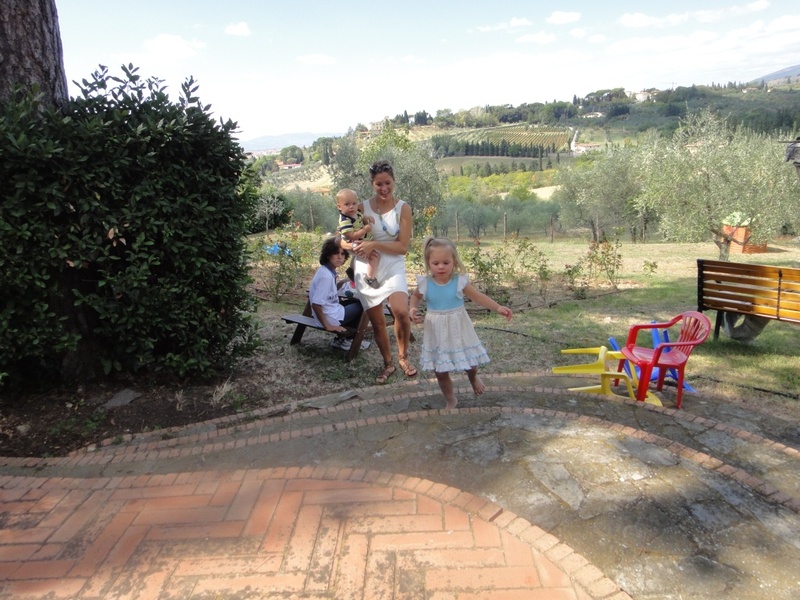 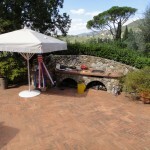 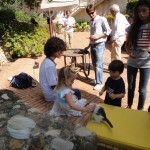 Oh, by the way: some pictures below are of a BBQ with some new Italian friends of ours. 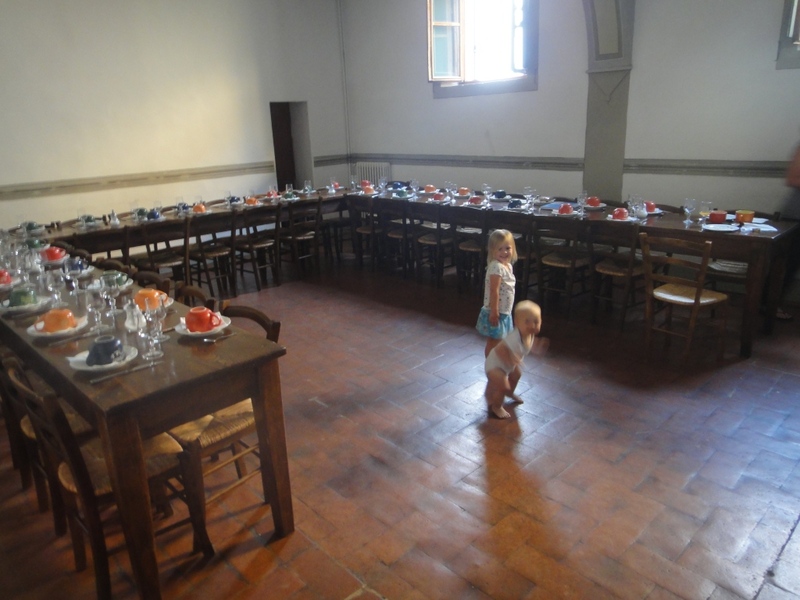 It was a bizarre and providential feast. 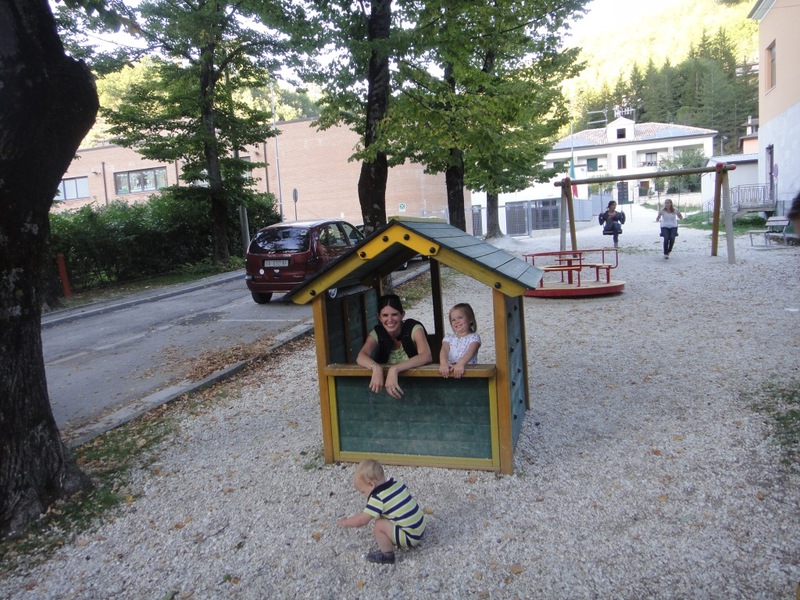 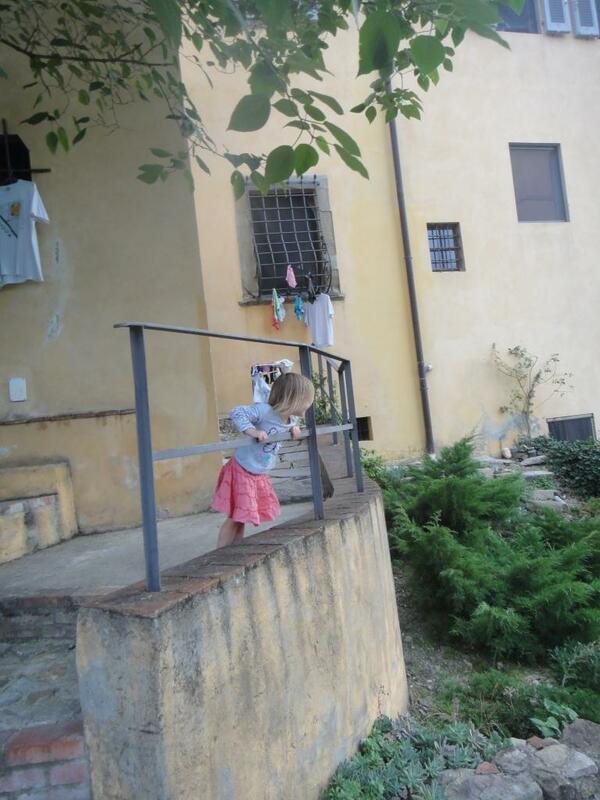 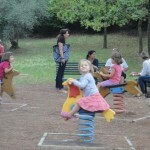 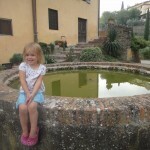 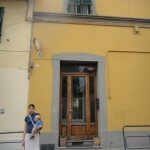 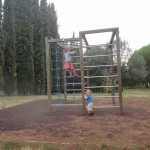 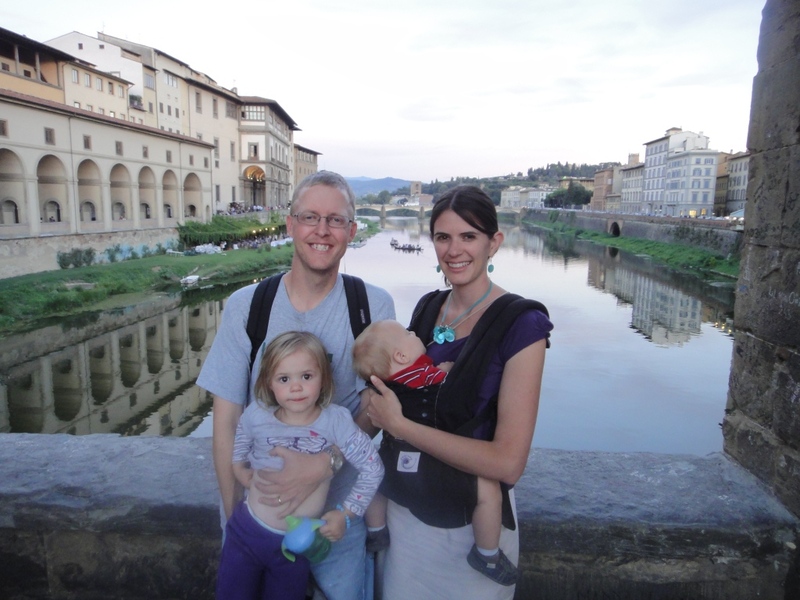 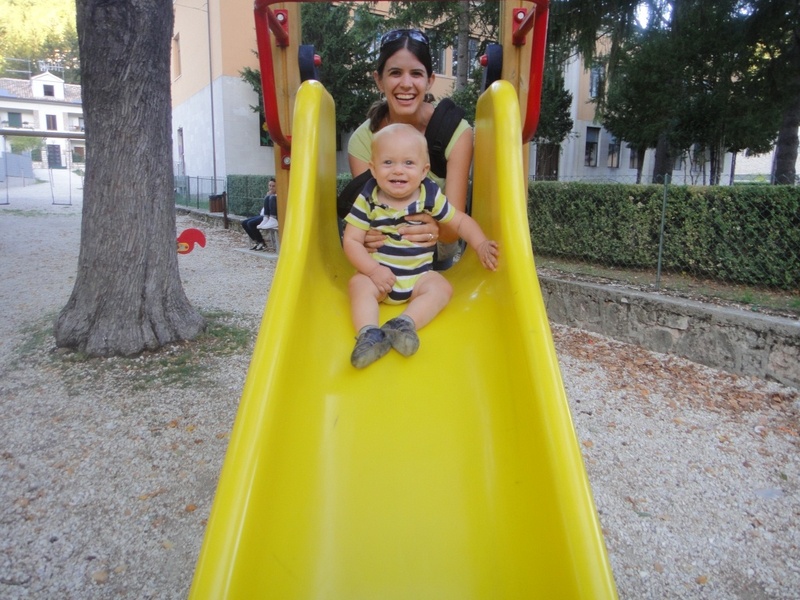 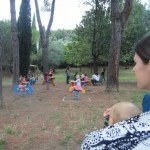 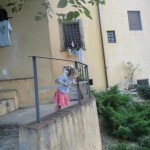 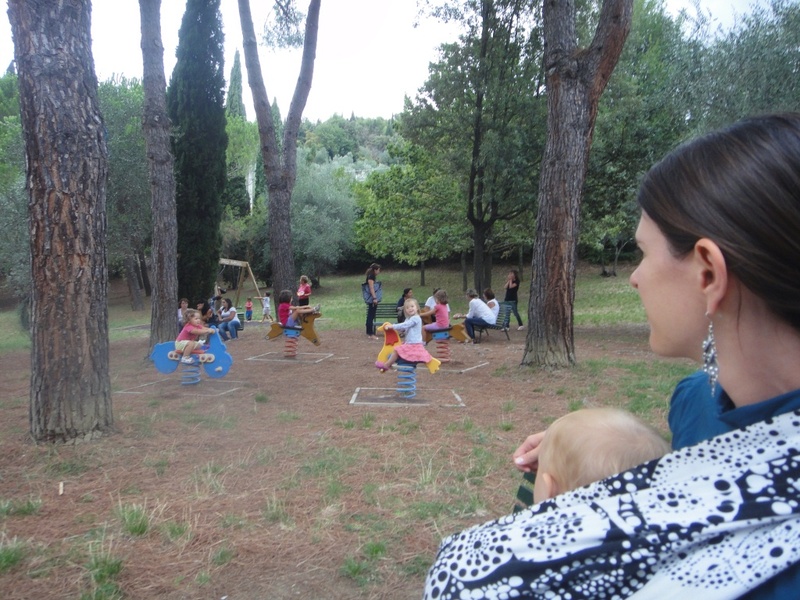 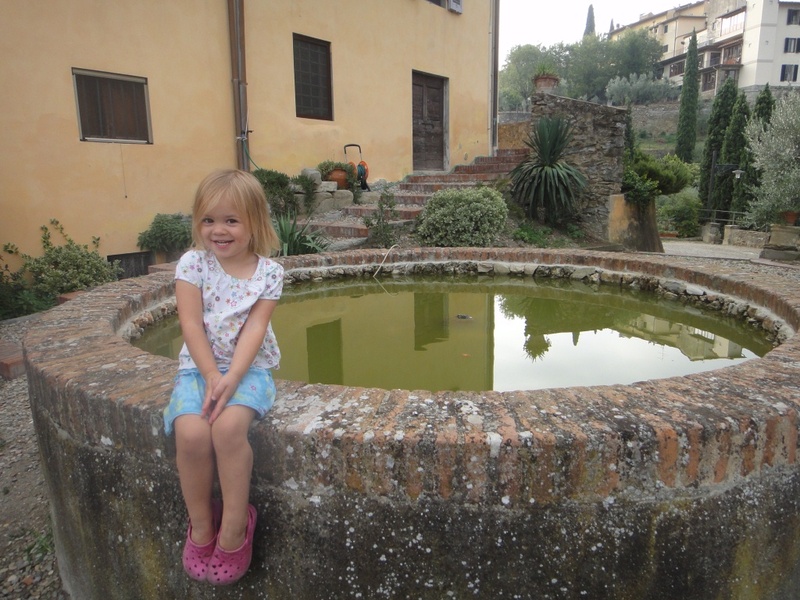 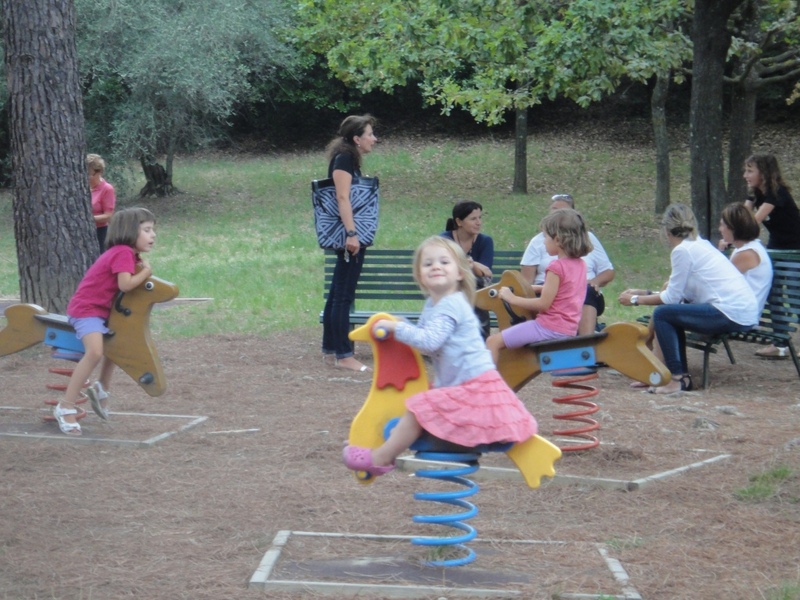 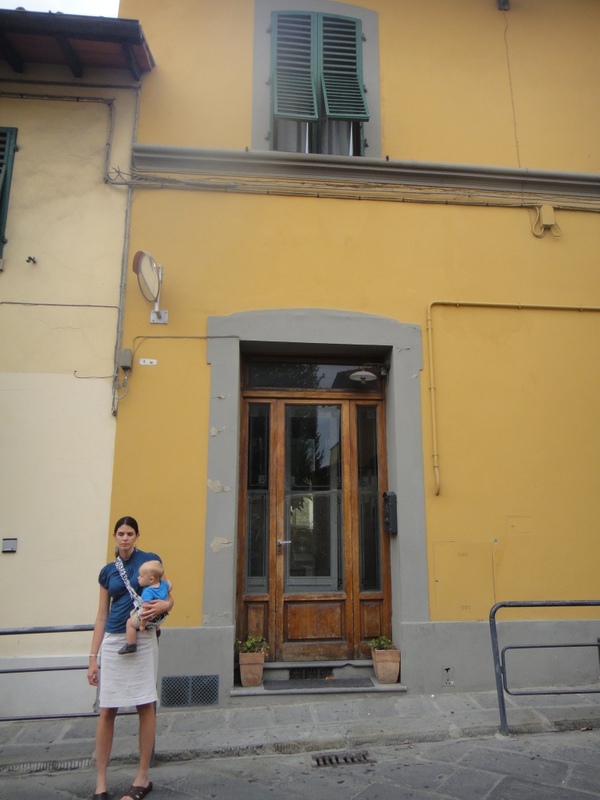 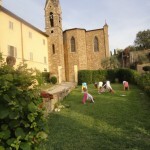 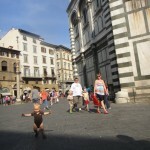 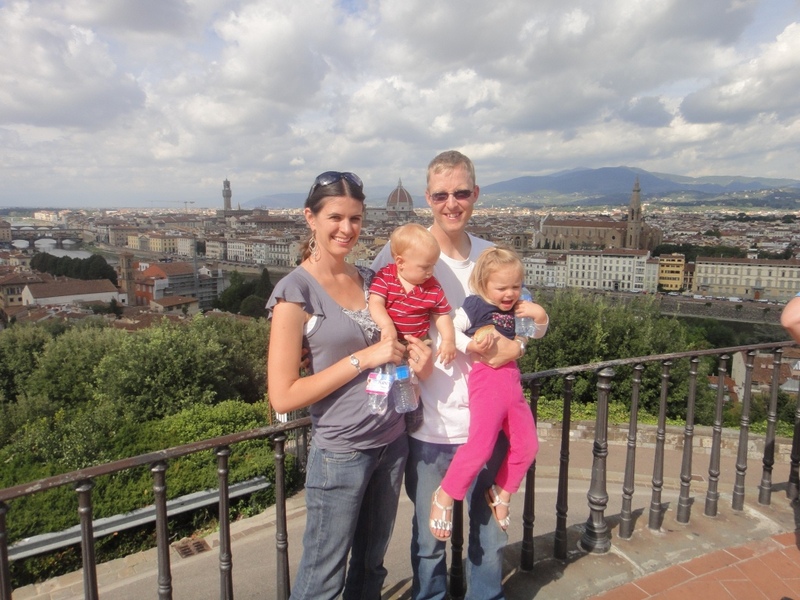 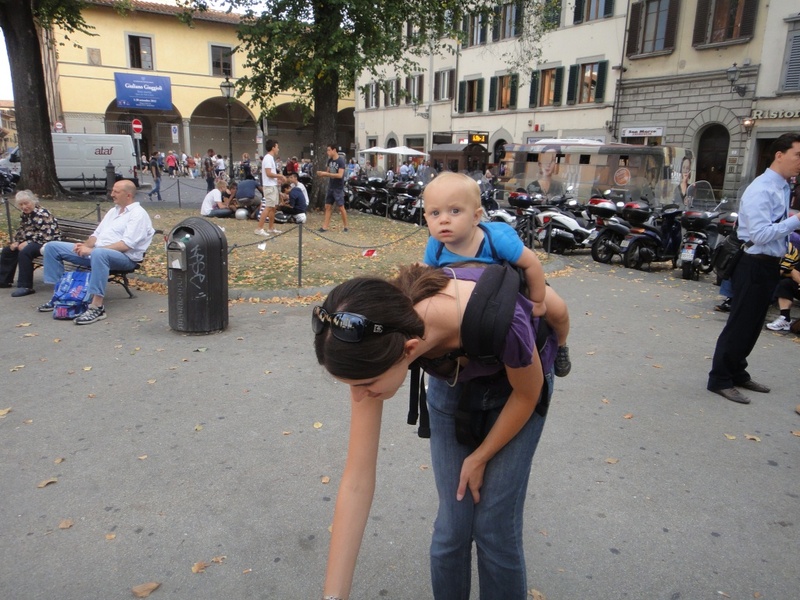 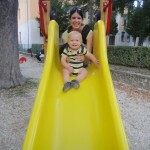 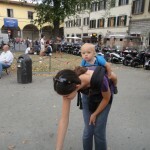 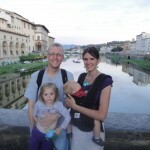 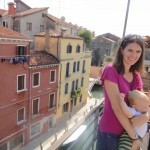 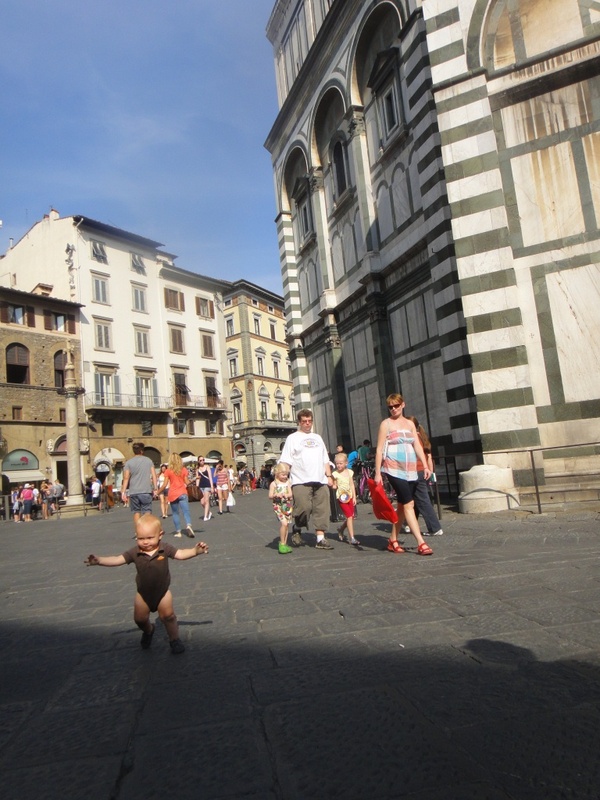 So Jen goes on the internet looking for some kids Julia can play with, and she finds a site with an Italian mom asking to see if any English-speaking toddlers in Florence would be around to play with her kid. 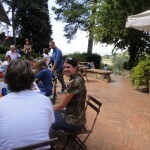 We give her a call, and she says to come over the next day for a BBQ. 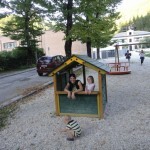 I wondered what she meant by this term. 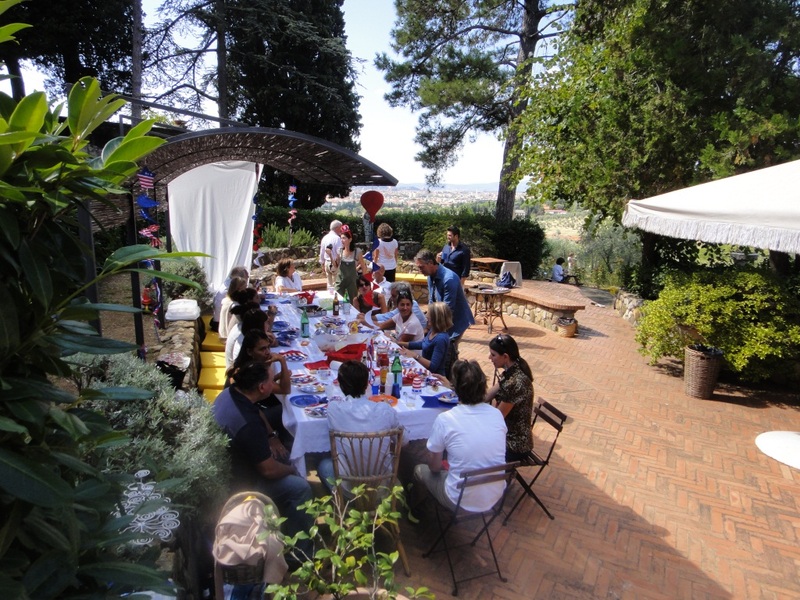 When we arrived, it turned out that this day was this family’s annual “American BBQ” day, wherein they all dress in red, white, and blue, put out American flags, and grill out American style. 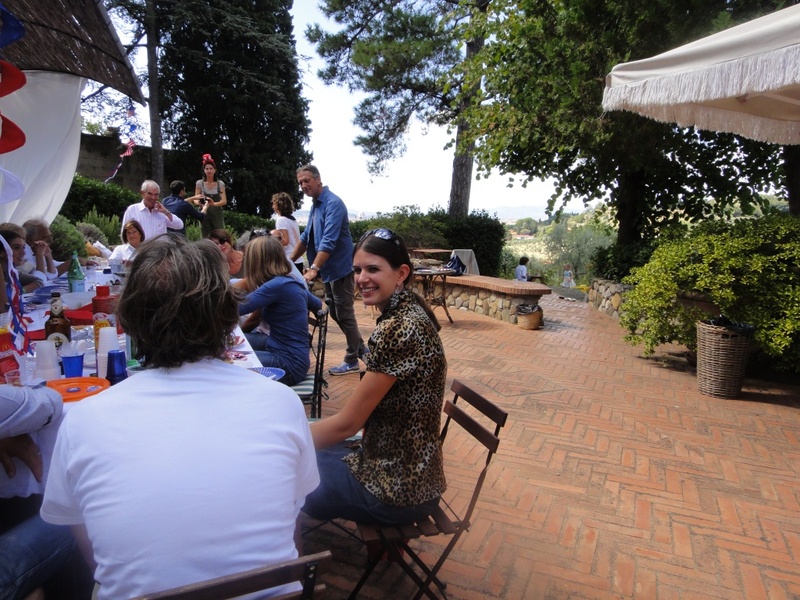 It was a welcome treat to have chesseburgers and hot dogs in the company of America-loving Italians. 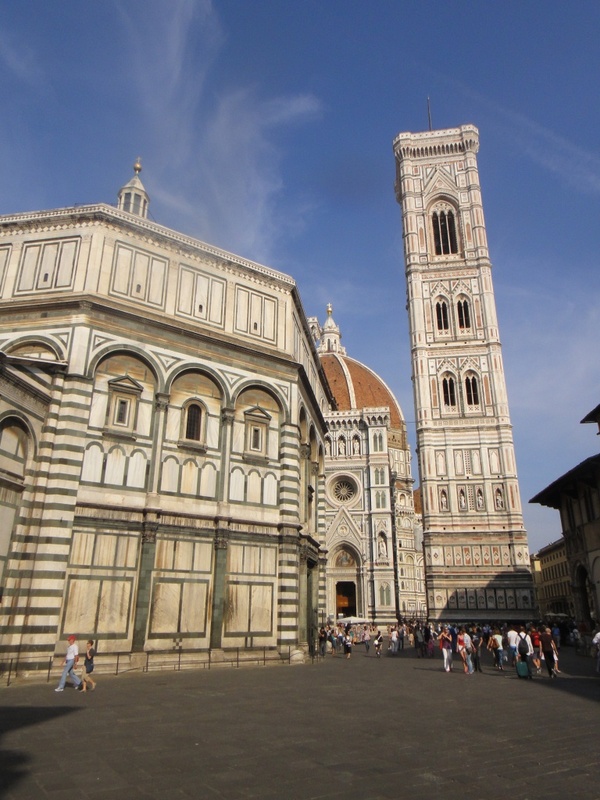 Nice late p.m. shot of the Duomo, etc. 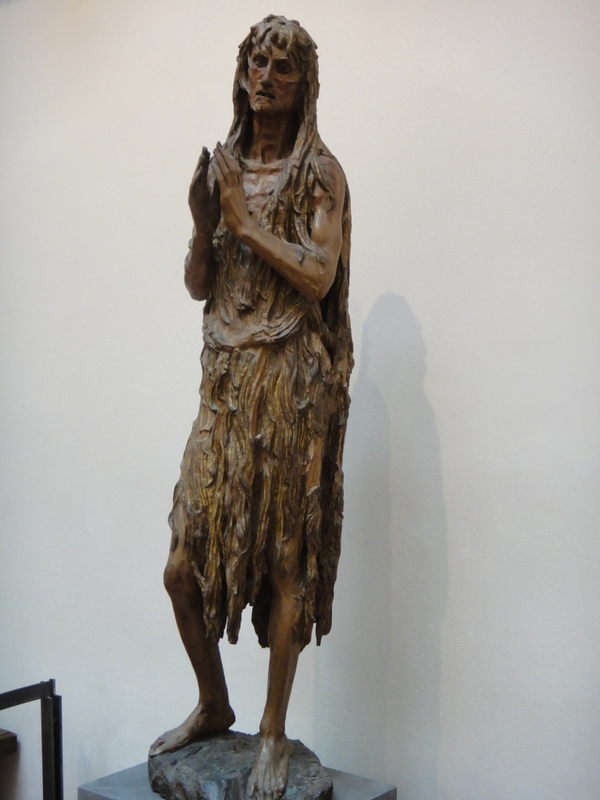 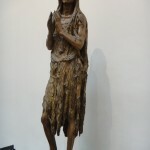 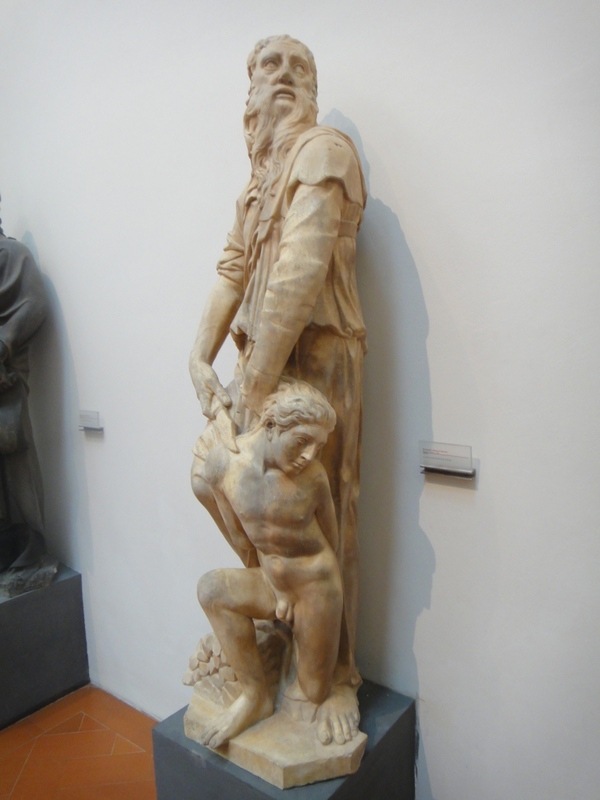 Donatelloâ€™s Mary Magdaleneâ€”what point in her life do you think he is depicting? 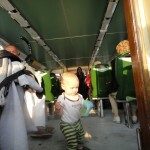 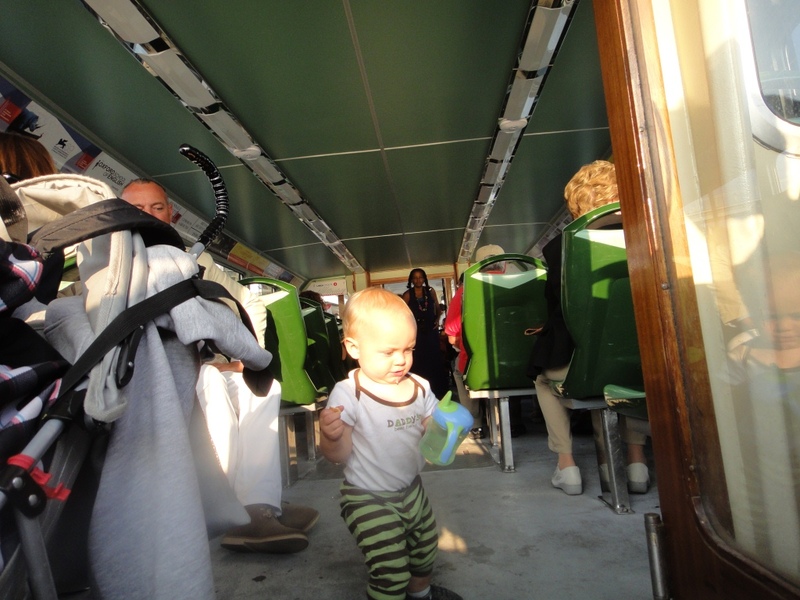 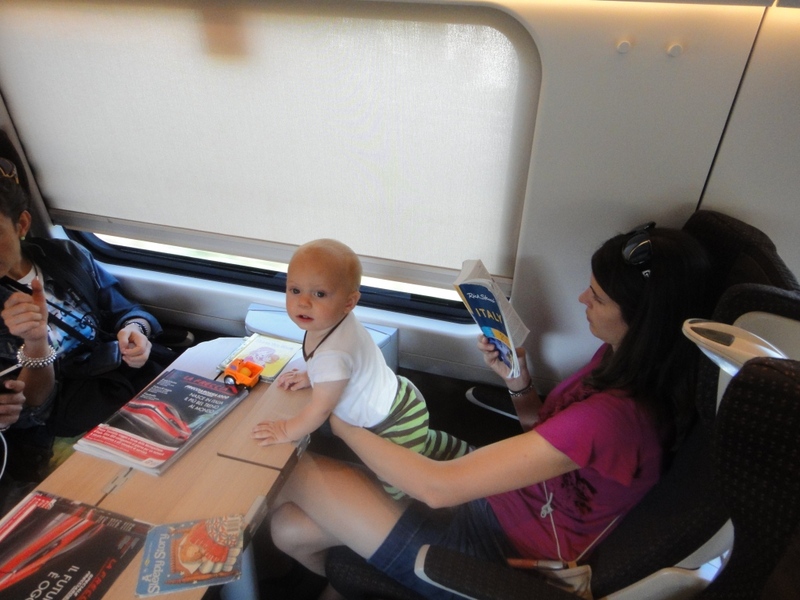 Manning the baby on the trainâ€”even the fast trains are not quite fast enough! 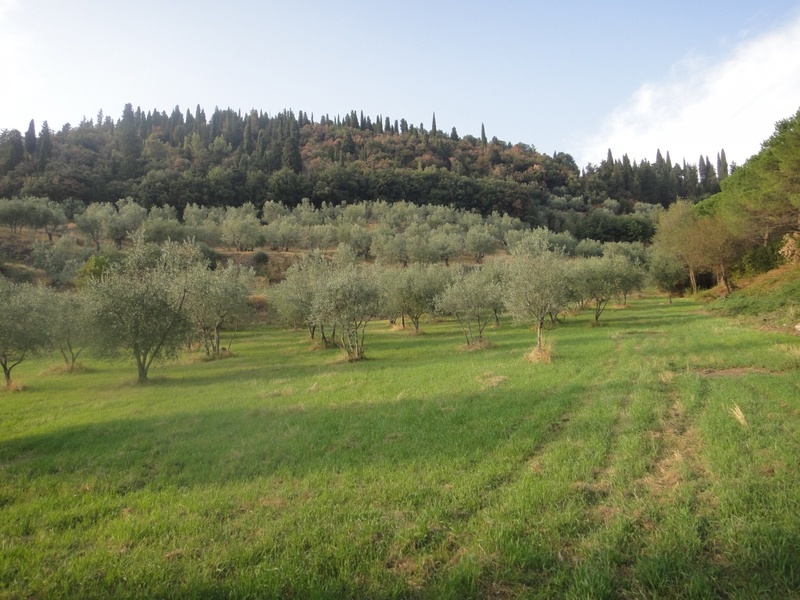 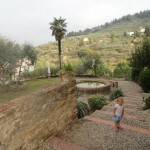 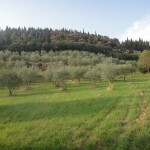 Life in Tuscany was not so sunny the past couple days, as the weather turned unseasonably cool and windy. 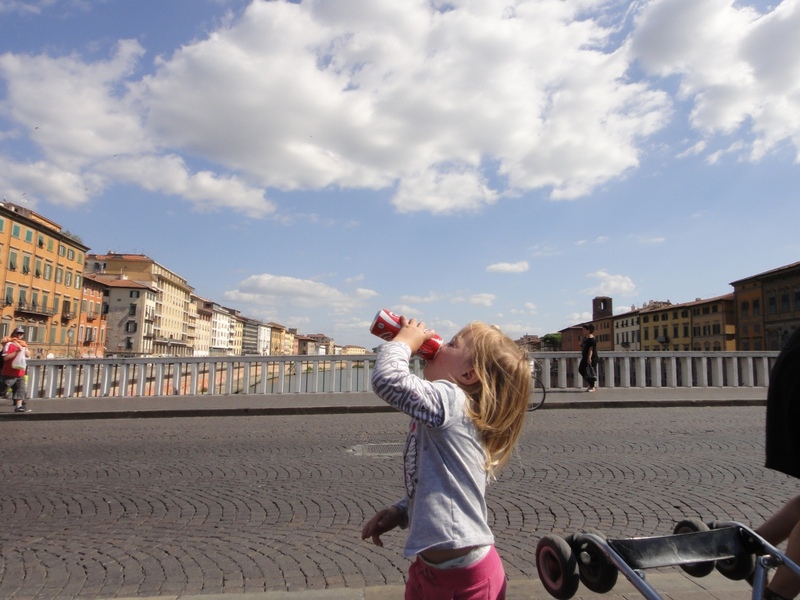 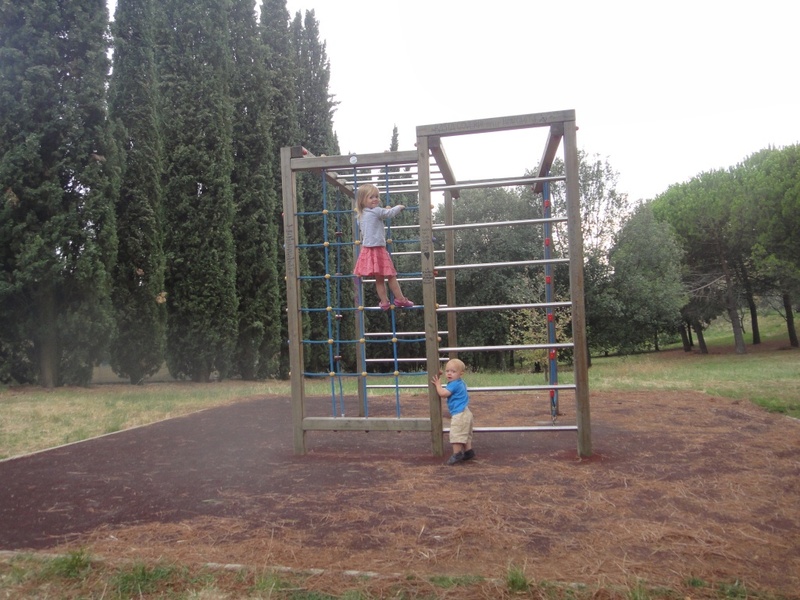 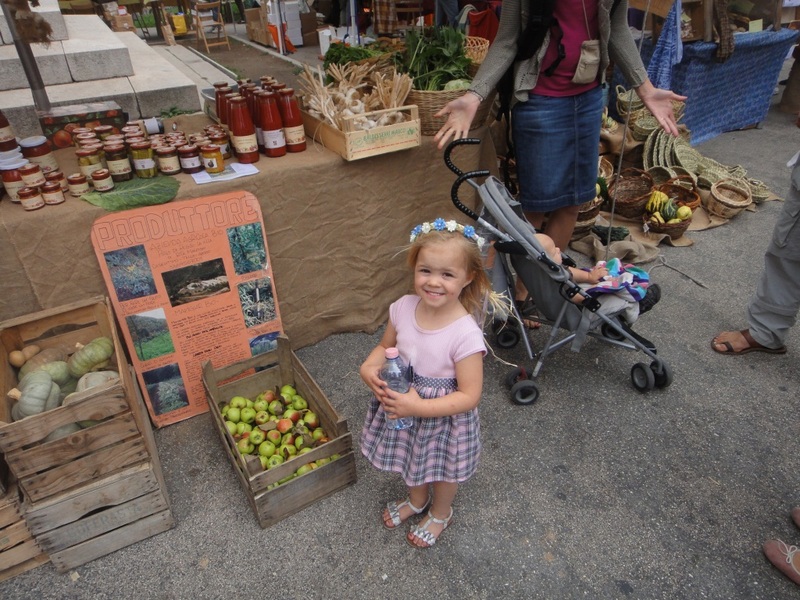 It was actually a welcome relief from the merciless heat we had in Rome last week and it made hiking around with kids and baggage more pleasant. 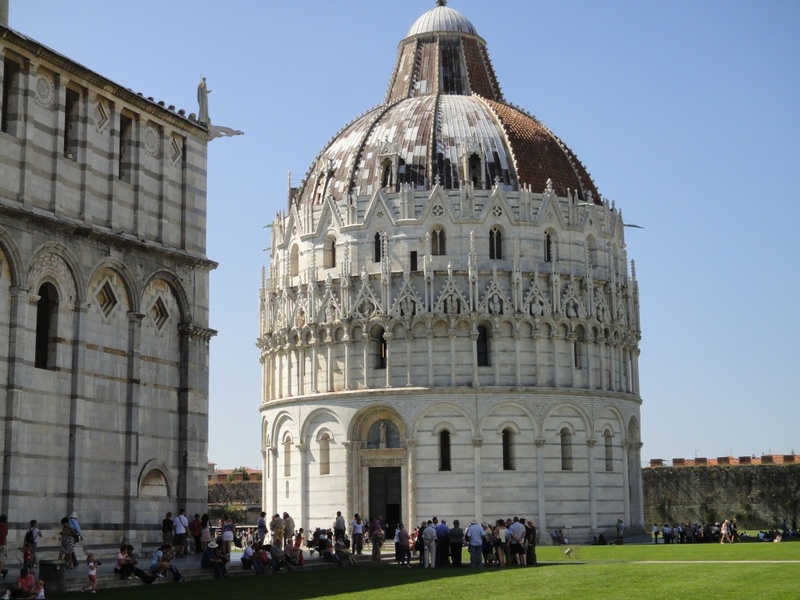 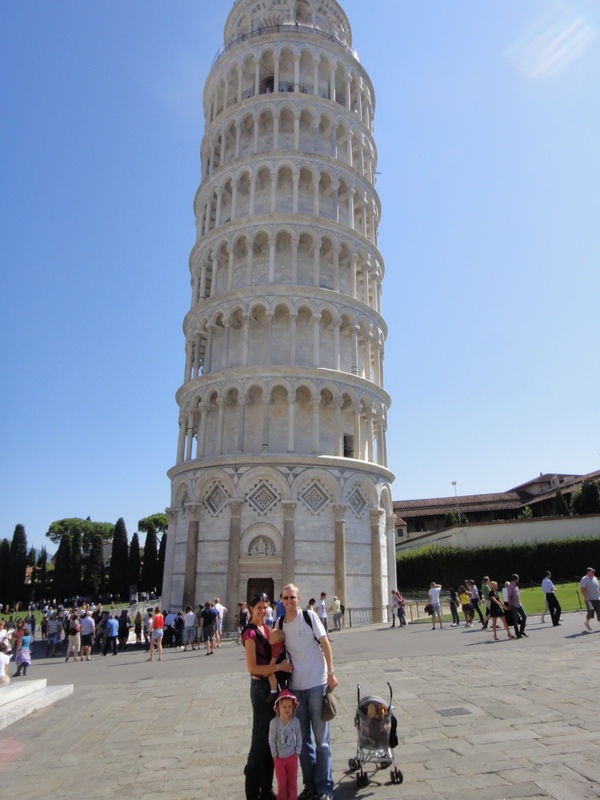 Two days ago our family spent some time in the Duomo in downtown Florence, and yesterday we took a day trip to the lovely town of Pisa. 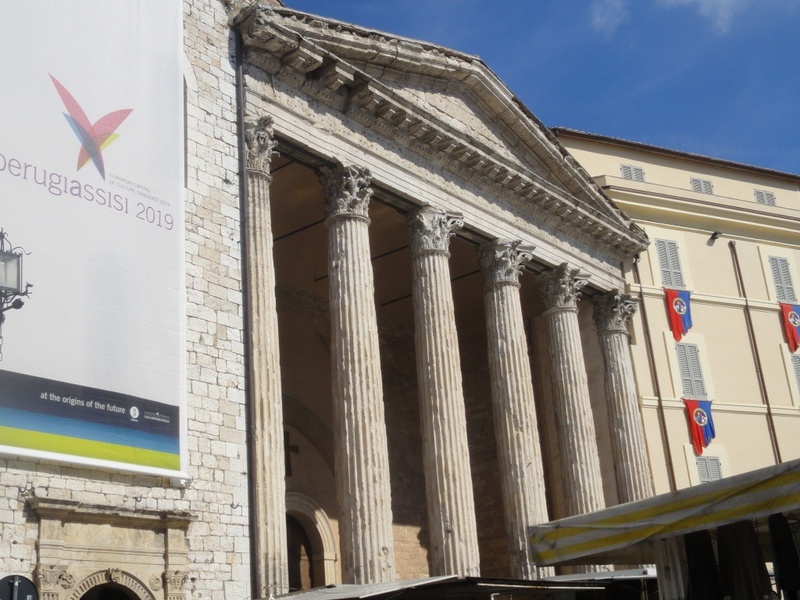 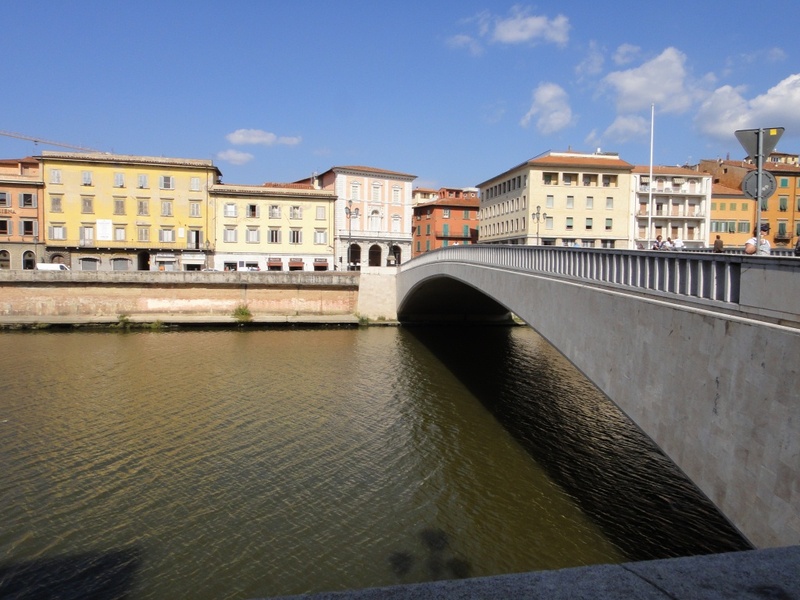 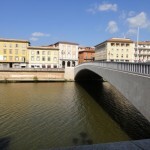 I was astounded at how beautiful the town was, from its almost Venetian river scene to its famous Campo dei Miracoli featuring the one-of-a-kind “Pisan Romanesque” style. 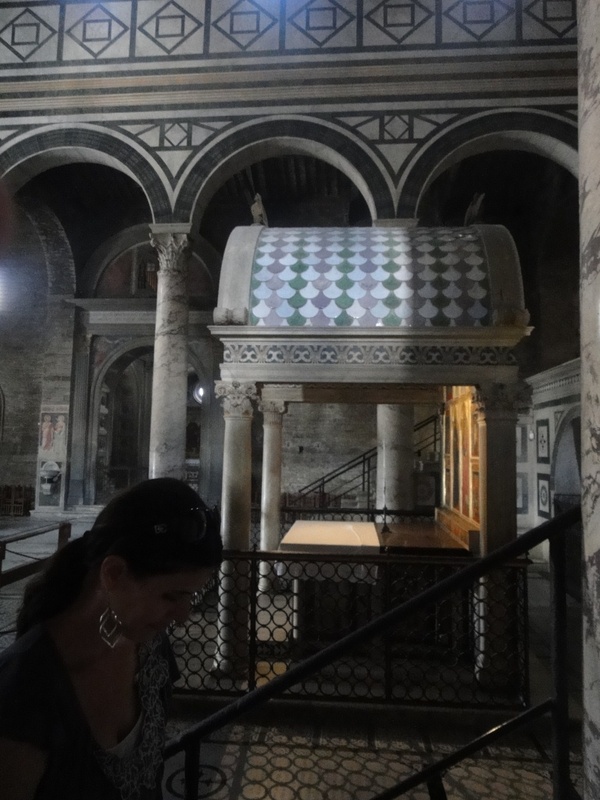 I particularly enjoyed the baptistery, built in 3 successive periods as you can see when looking at it from the bottom up. 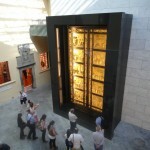 On the inside, a note you sing will echo for 10 seconds, and every 30 minutes a guard does a demonstration wherein he sound 3 consecutive notes and makes a chord. 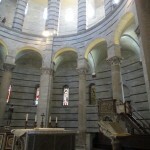 Very unique auditory experience. 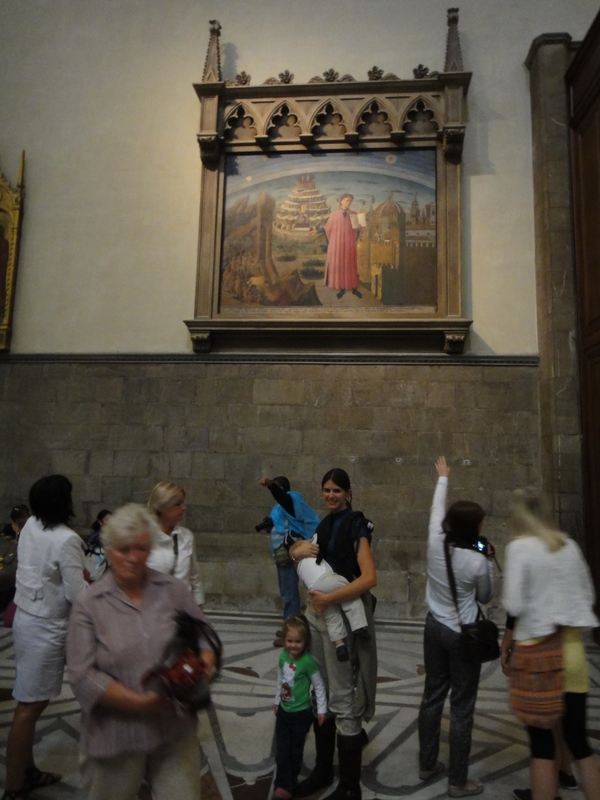 The highlight in Florence for our visit that day was a painting of Dante inside the Duomo which has him standing alongside his beloved town of Florence and the 3 realms he portrayed in the Divine Comedy. 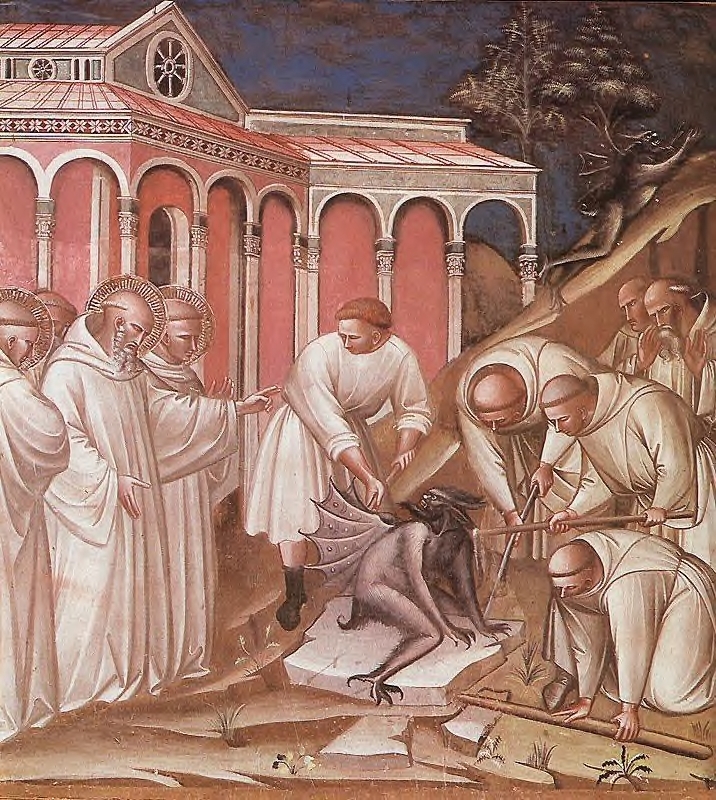 Next time I post I’m hoping to do some theology for a change, highlighting some key points from our BC class’s discussion of Dante this past week. 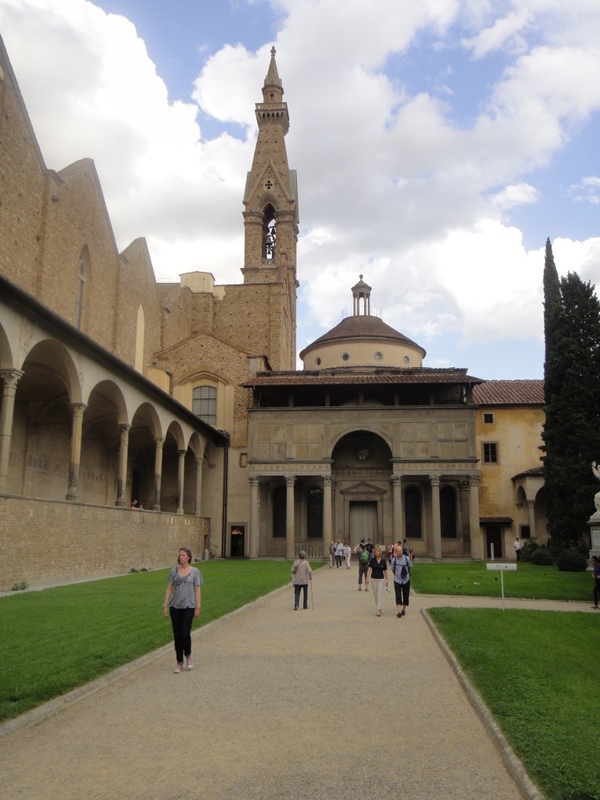 Great view of the baptistery, built over 3 periods, from the simpler Romanesque (bottom) to ornate Gothic (middle) to the Renaissance dome. 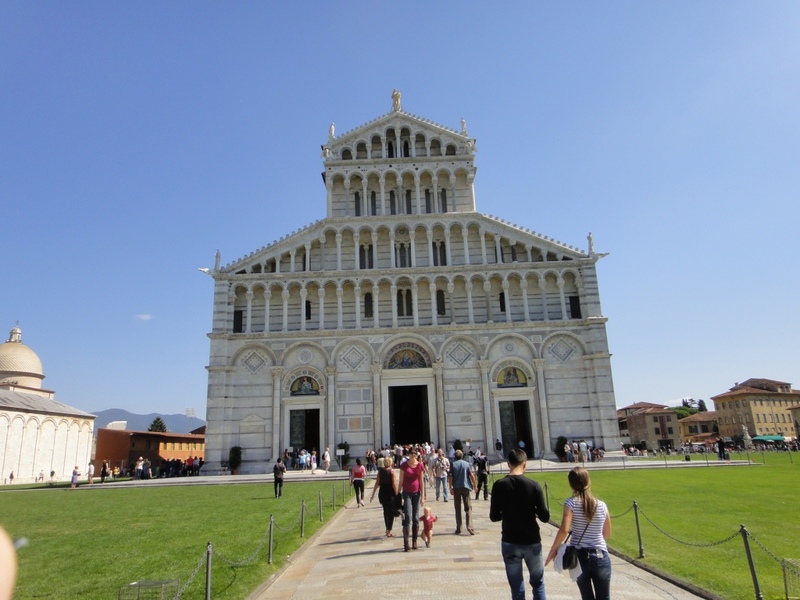 Pisa duomo featuring its characteristic “Pisan Romanesque” facade–the whole thing is titled a bit (as is my camera angle). 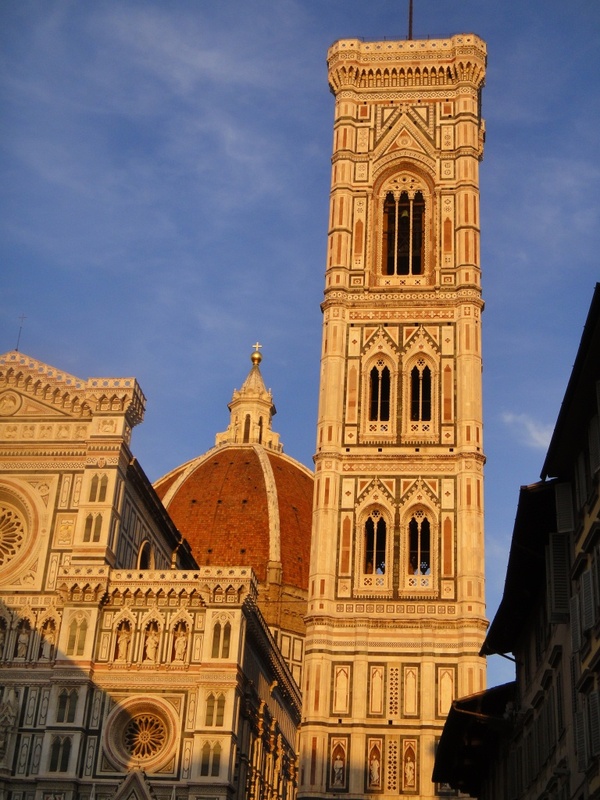 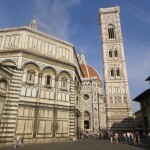 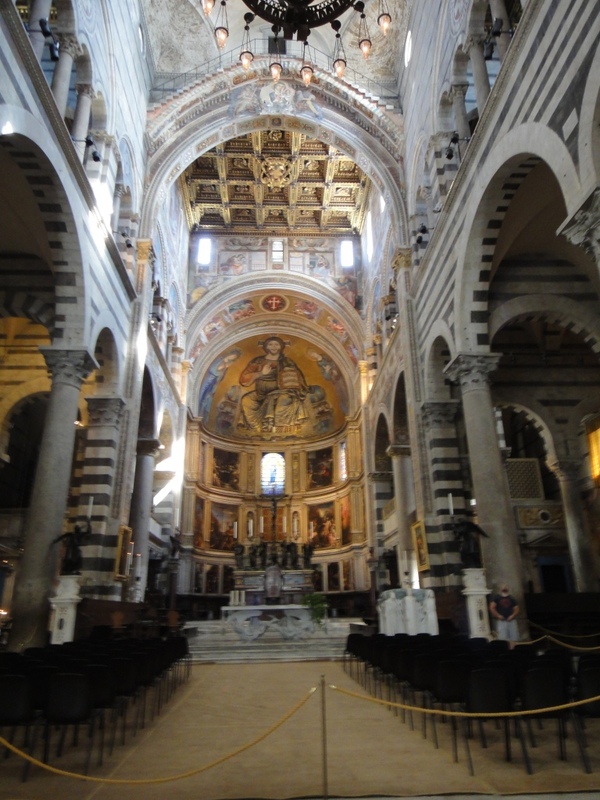 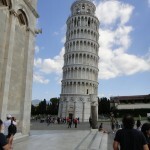 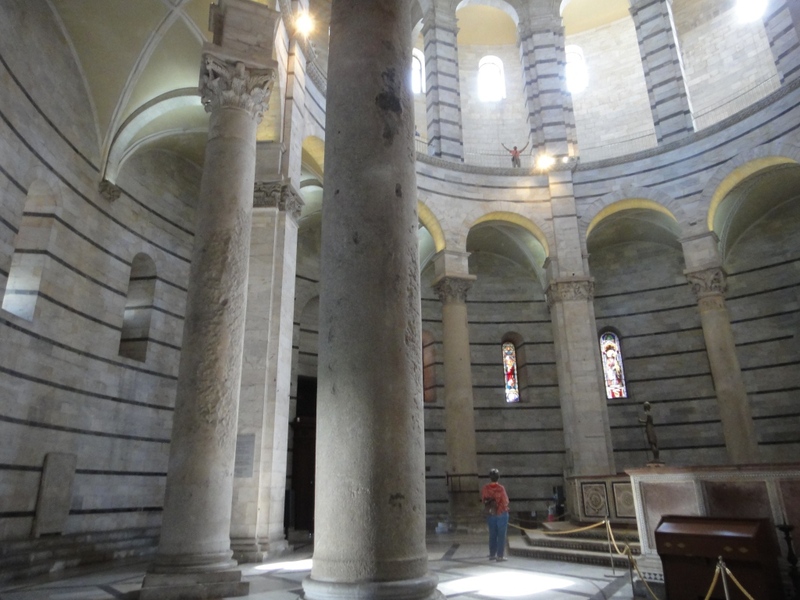 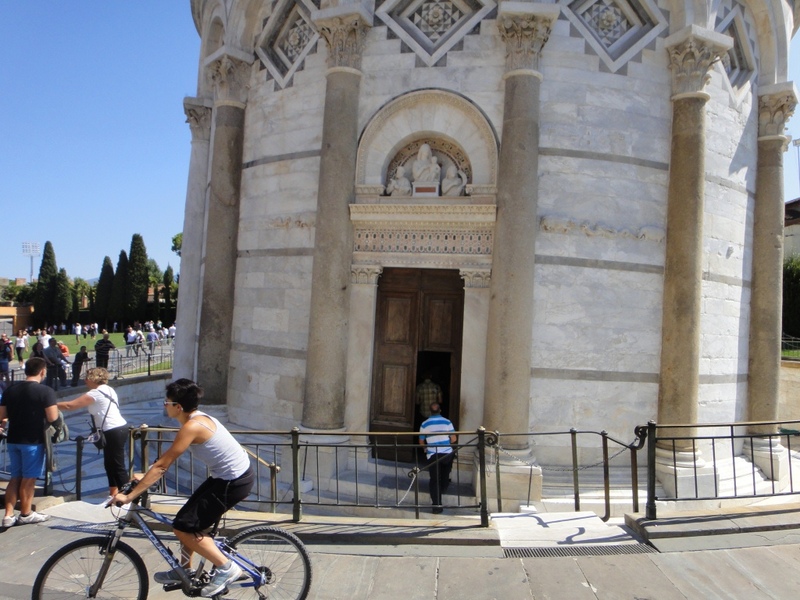 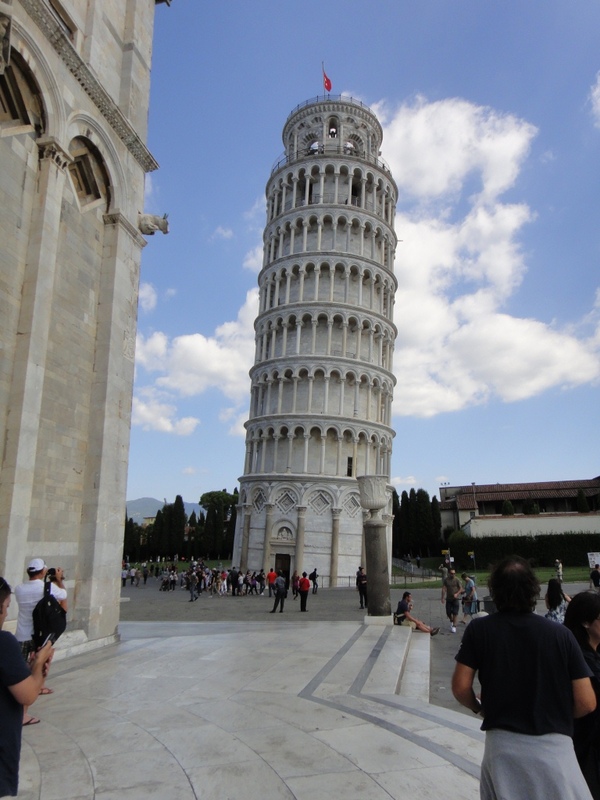 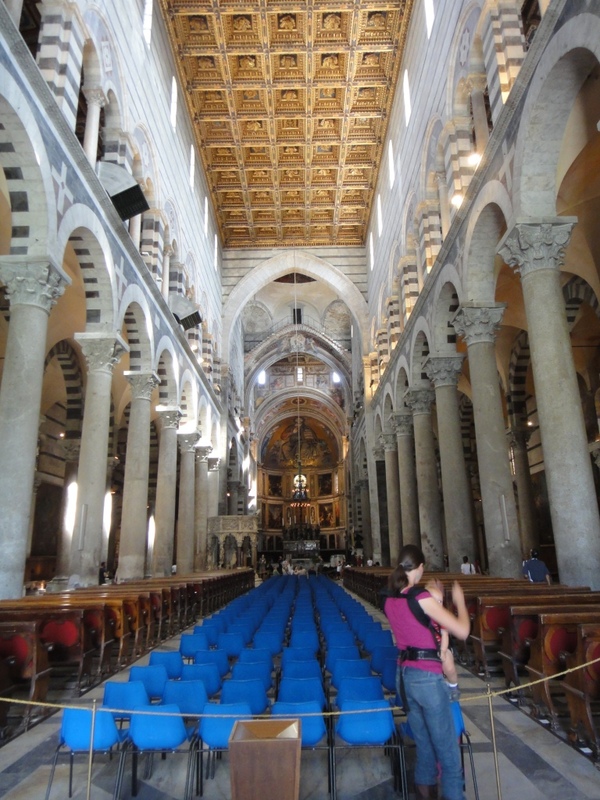 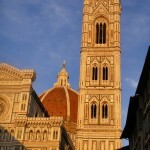 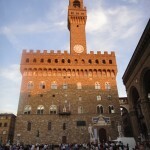 In fact, the tower, the baptistery, and the duomo are all unlevel. 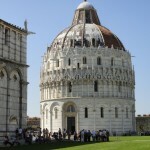 Awesome baptistery, the largest in Italy. 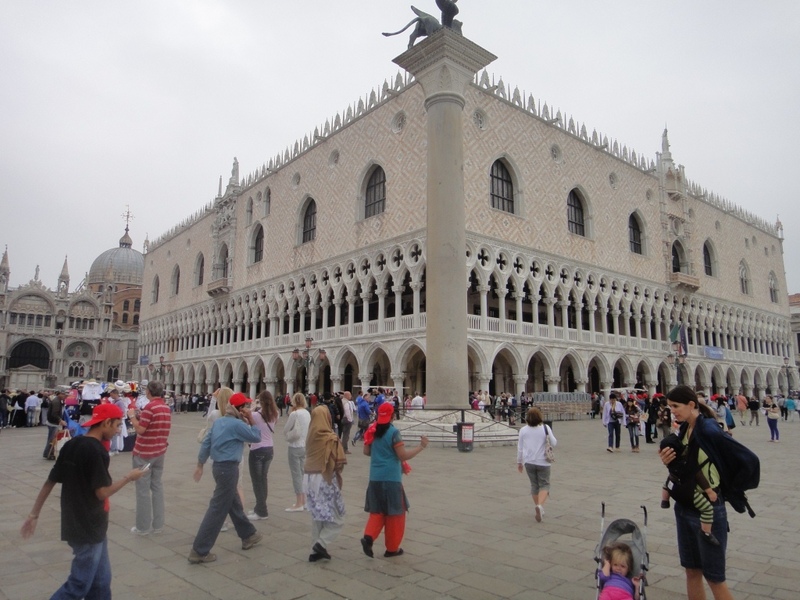 Every 30 min a guard does a demo of how musical notes echo for 10 seconds inside. 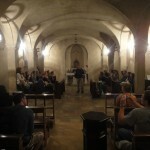 He is able to make a chord of 3 notes off of his own echo–very unique. 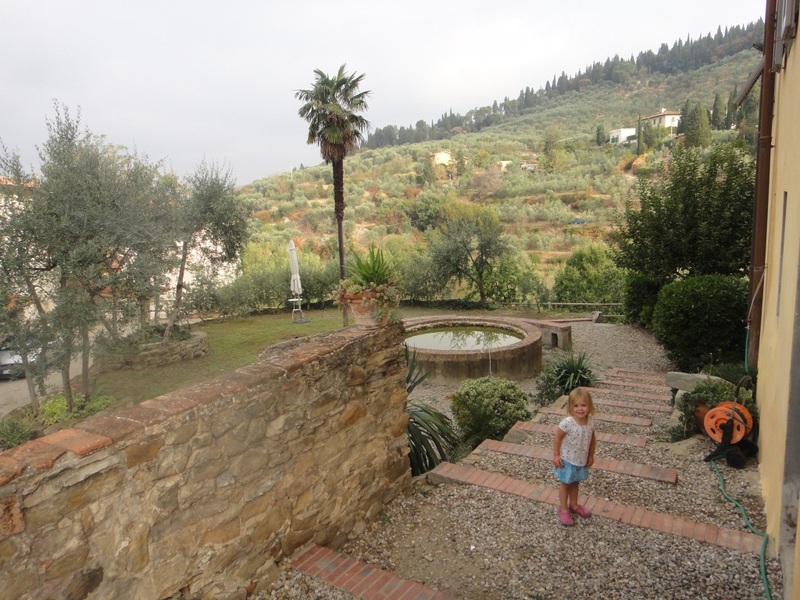 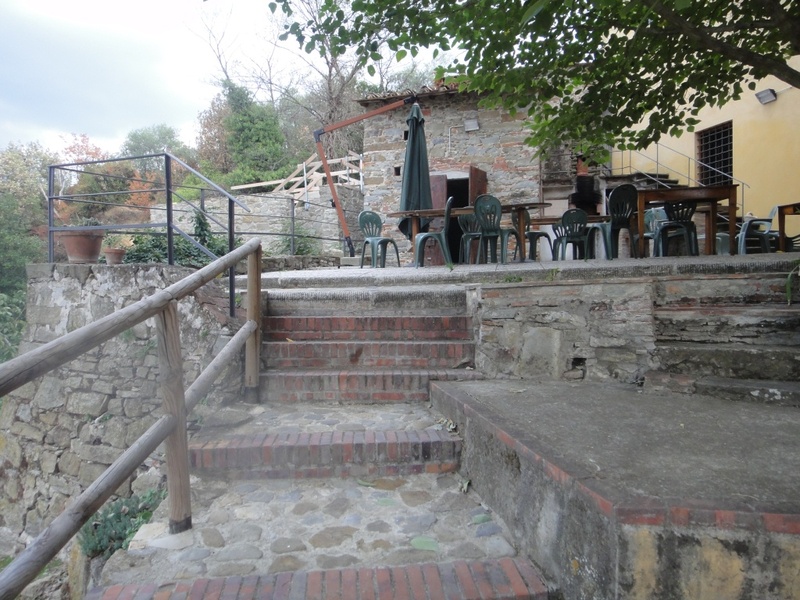 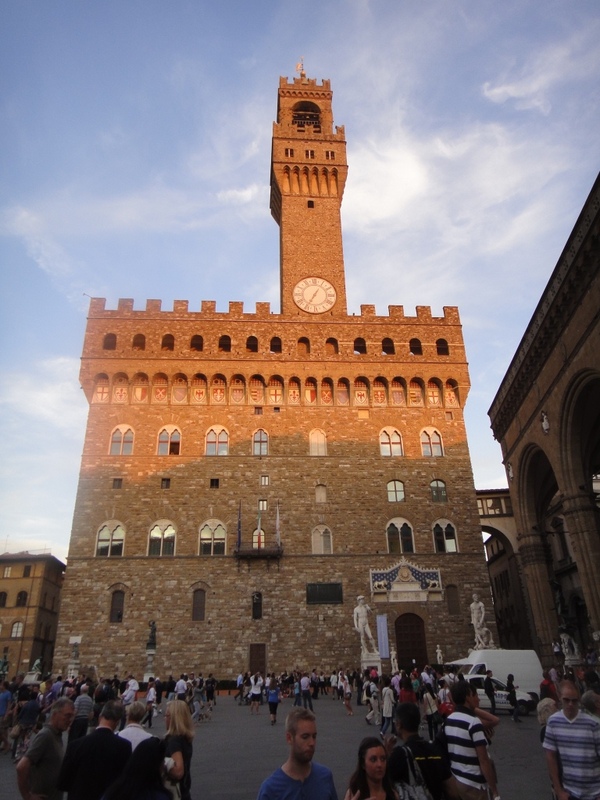 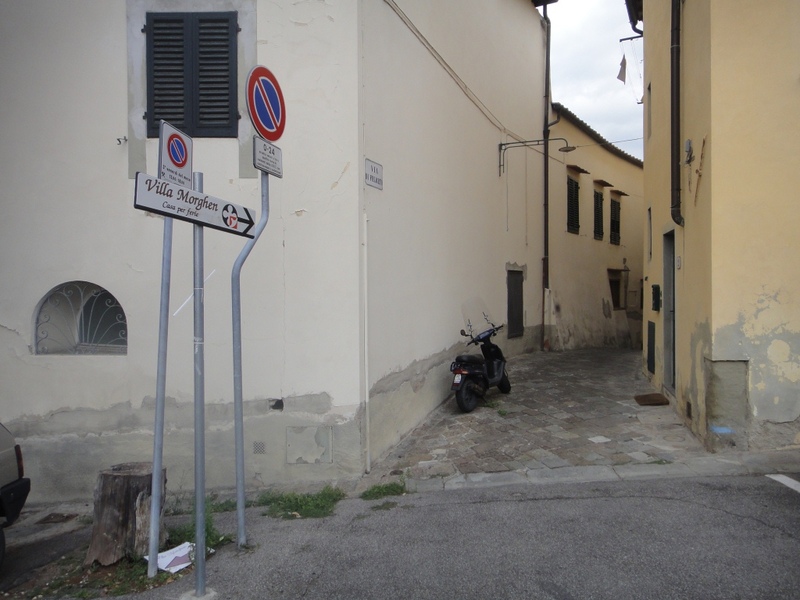 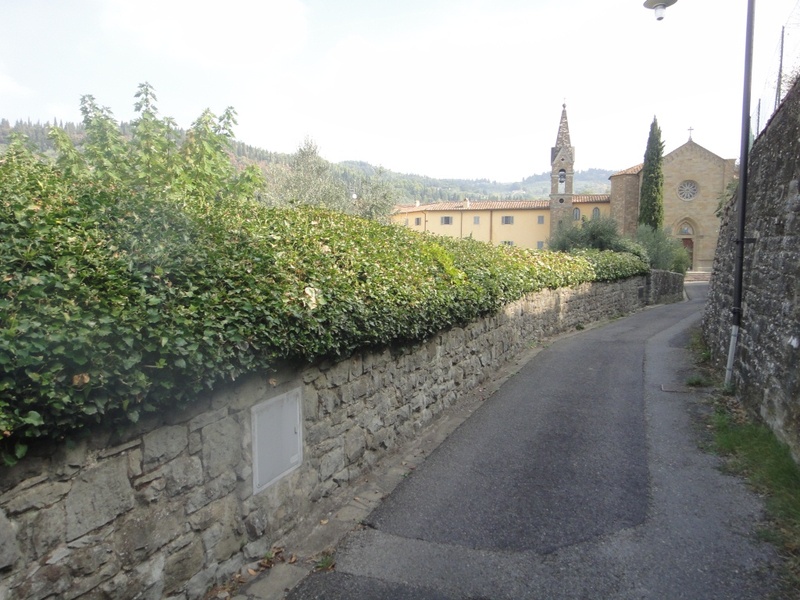 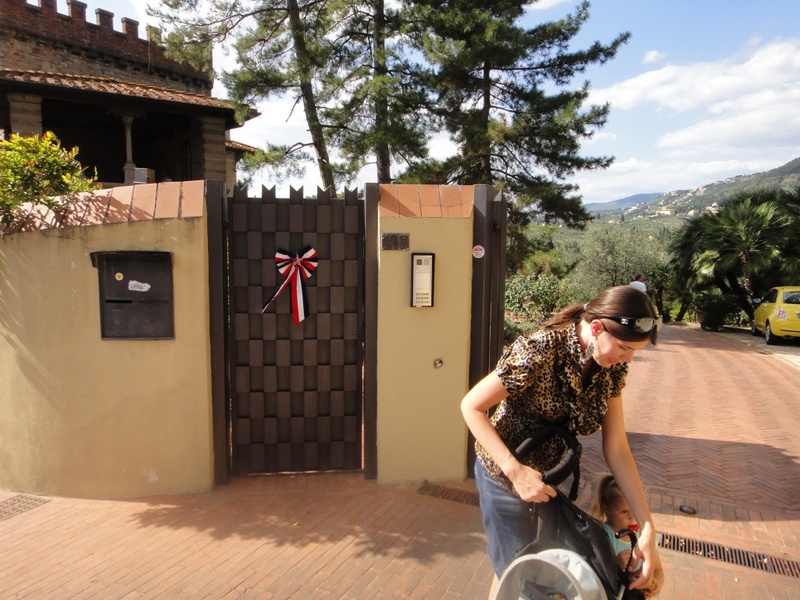 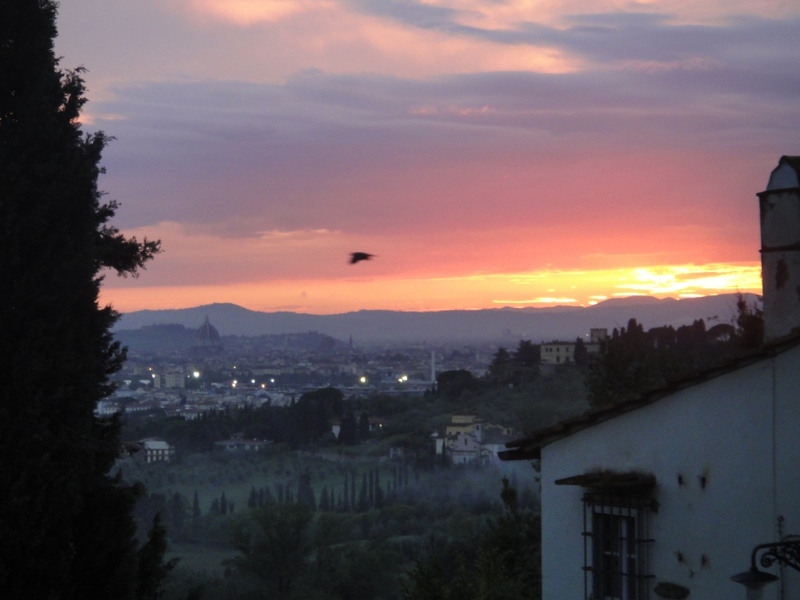 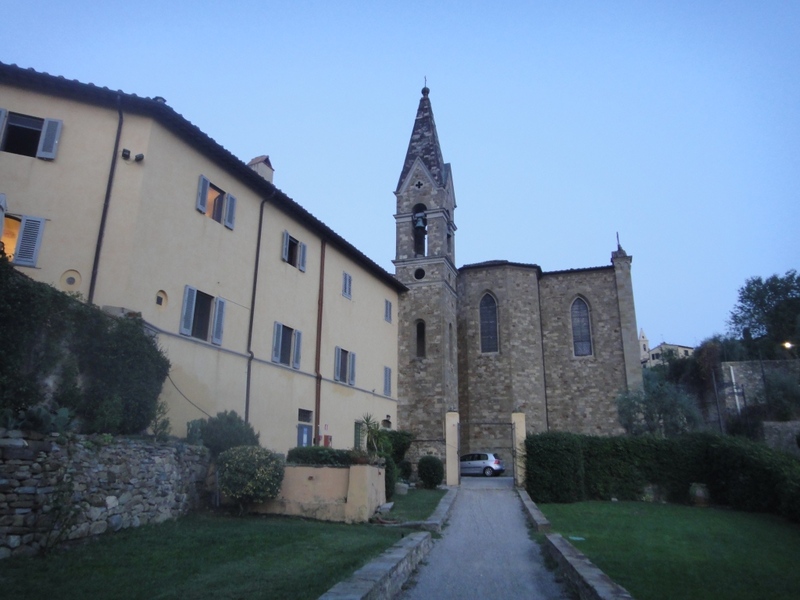 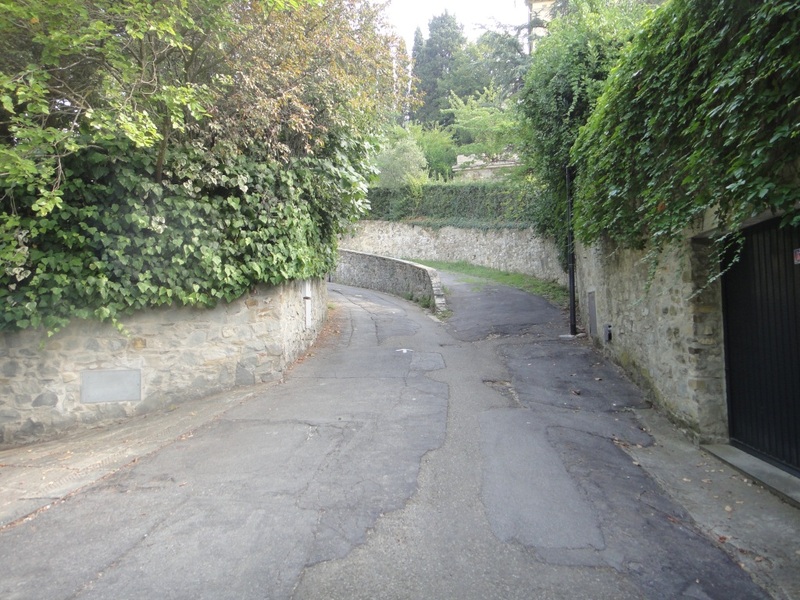 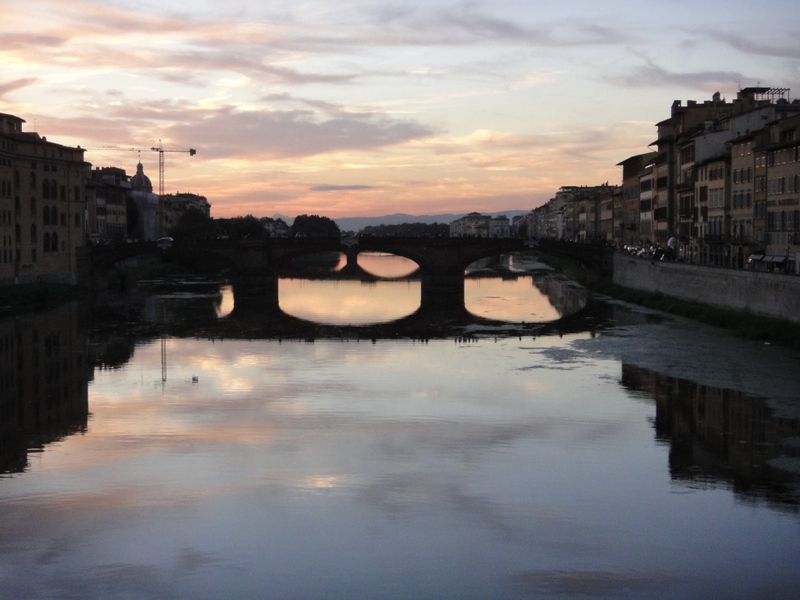 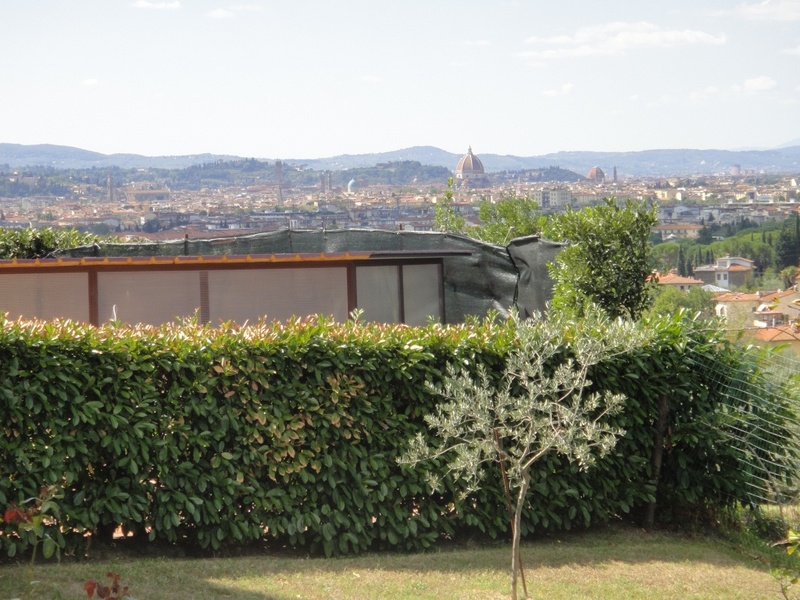 Below I have posted some pictures of our villa, the walk around it, and our little town which is about a 20-min bus ride to downtown, commercialized Florence. 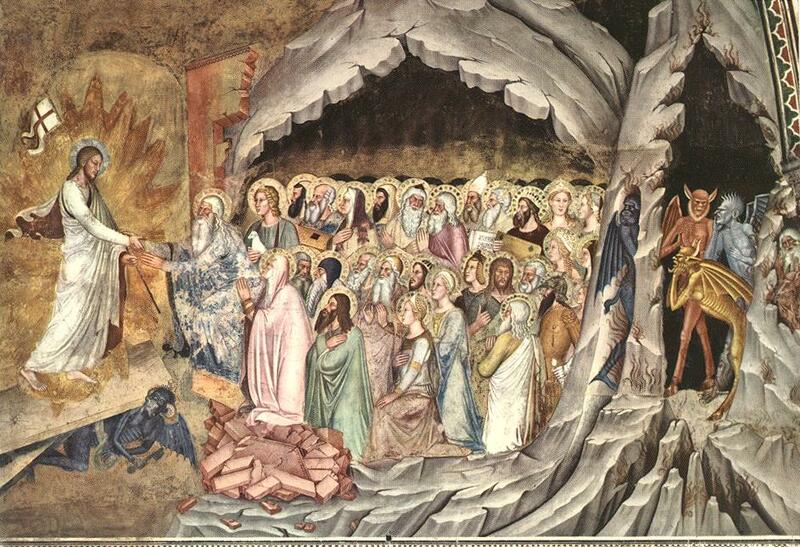 Yesterday was the first day of both classes I am teaching this semester, Theology of Benedict XVI and Dante’s Divine Comedy. 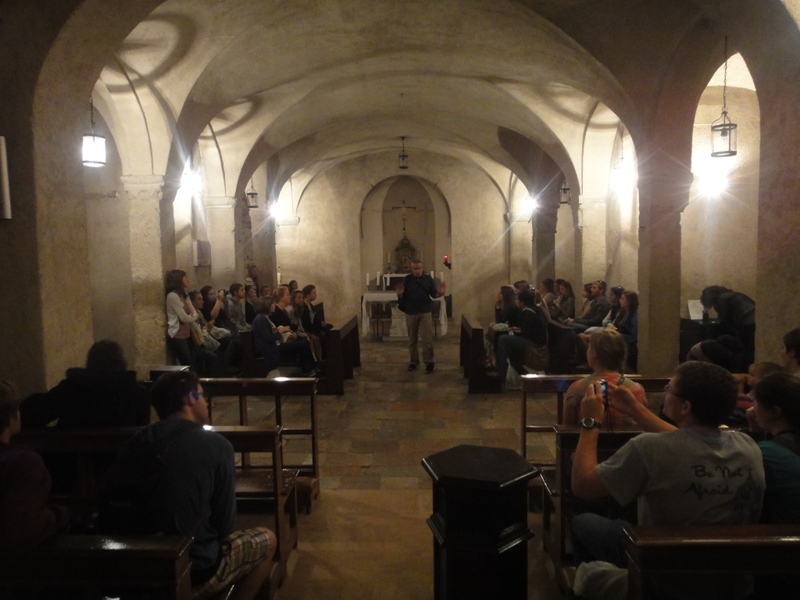 The students did great, and I am looking forward to working with them all semester. 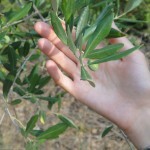 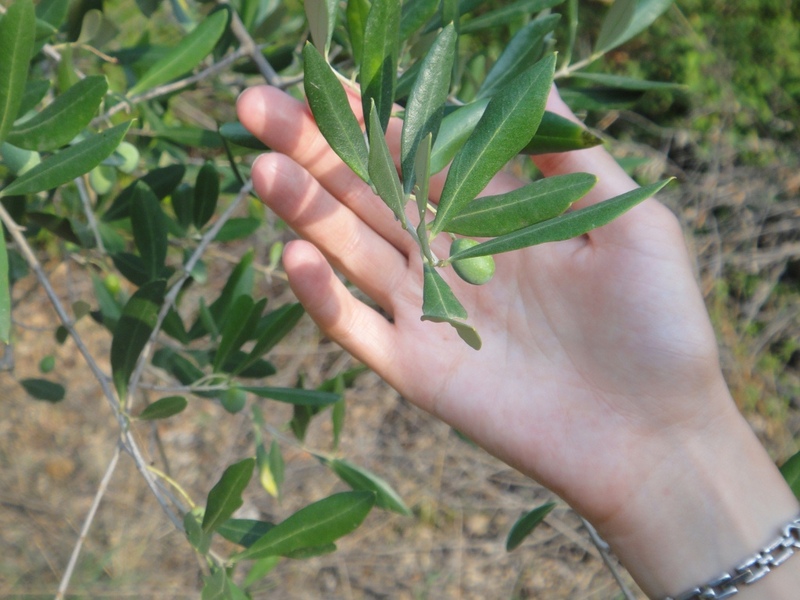 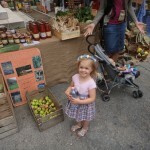 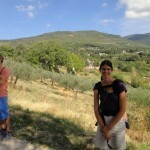 Jen showing that there are real olives on these trees!